1954 - The R. Robb and Ouida C. Taylor House, 104 Laurel Avenue, Carrboro. Architect unknown. 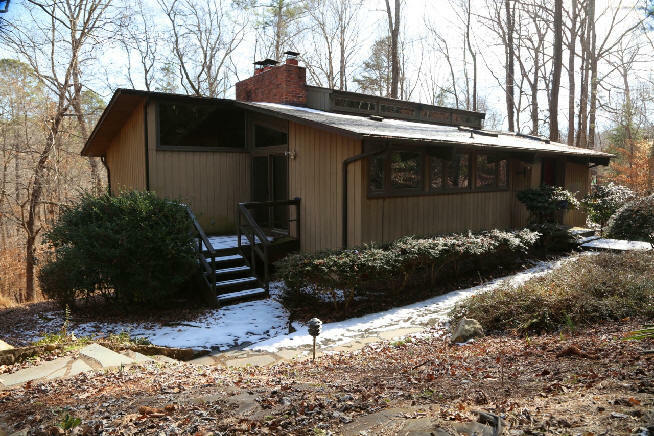 Sold in 1959 to Margaret Robbins Davis. Became a rental. Destroyed 2011. 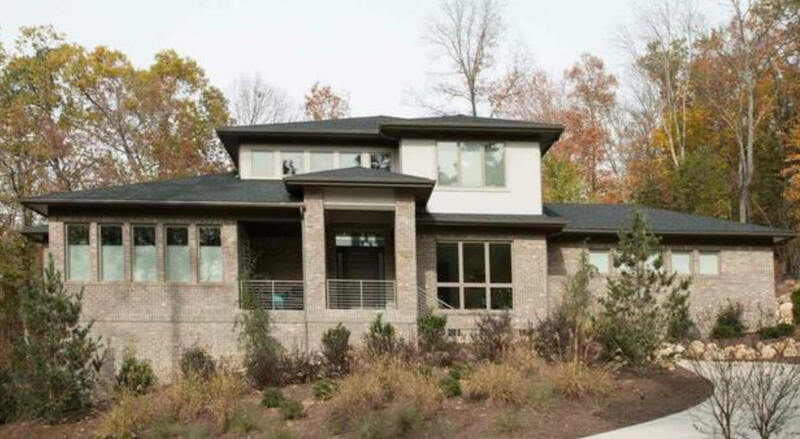 A new house was completed on the site in 2012, bottom photo. 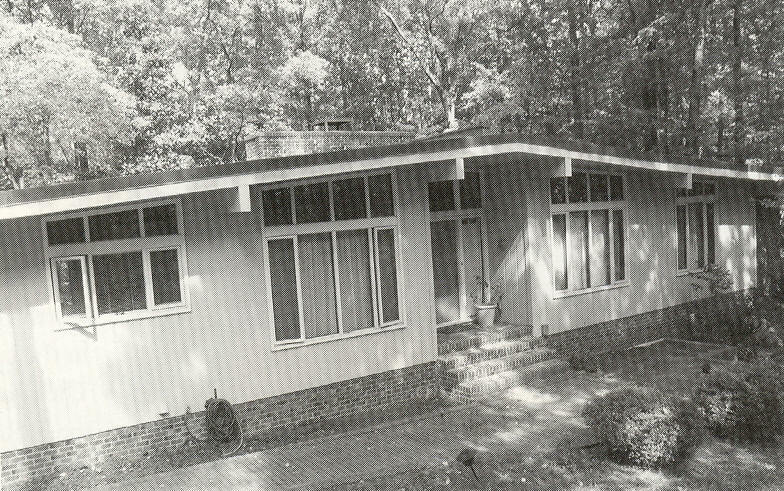 1955 - The Kenneth Sugioka House, 612 Morgan Creek Road, Chapel Hill. 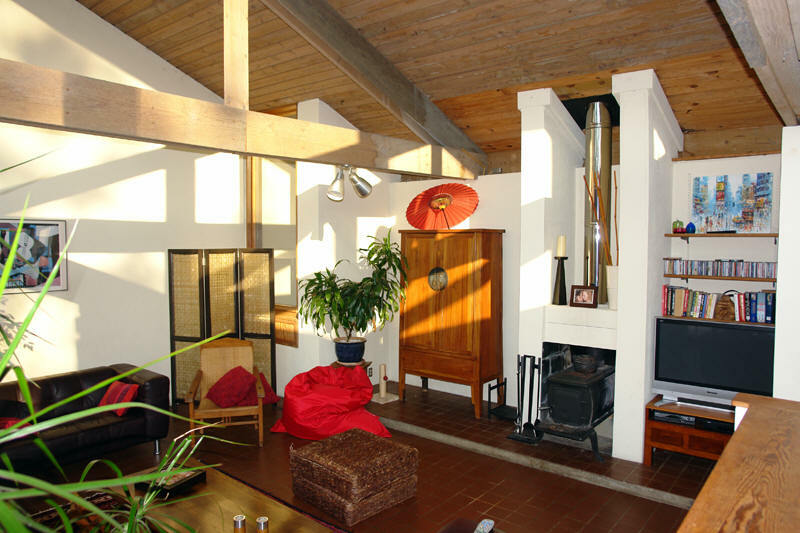 Designed by architect G. Hugh Tsuruoka. Sold at least once. 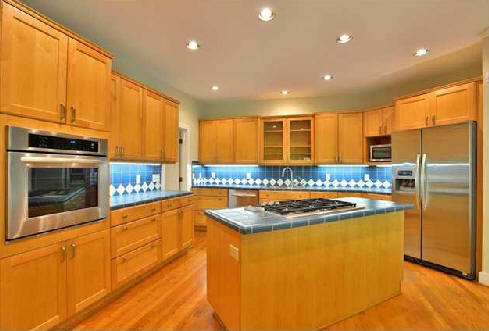 Sold in 2002 to Roseann Farber and Tom Petes. Featured in the Chapel Hill News Leader Nov 28, 1955. Photo by Carin Walsh. 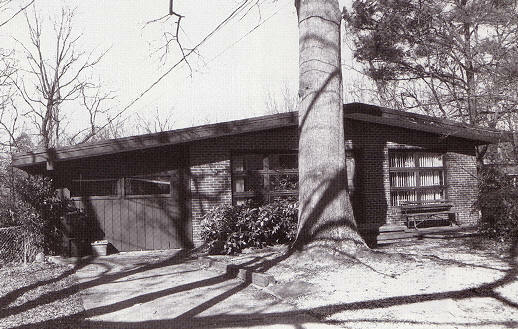 1956 - The Harry Macklin House, 112 Noble Street, Chapel Hill. Architect unknown; probably built from mail order plans, according to historian Ruth Little. 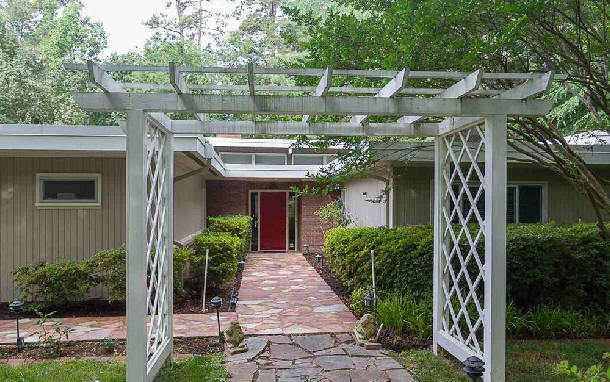 Sold in 1966 to Ralph and Sandra Macklin. 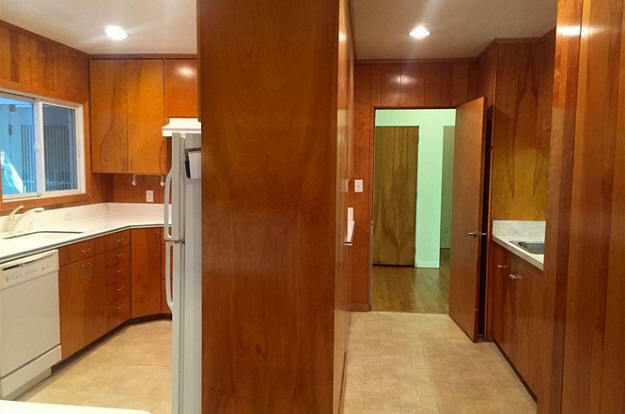 Sold to a variety of mortgage companies during the 1970s. 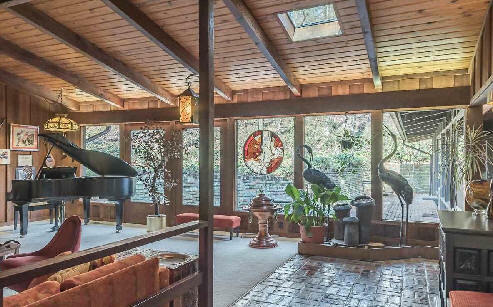 Sold in 1975 to Eleanor and Jerome Seng. Sold in 1999 to John and Rita O'Sullivan who still owned it as of 2012. Bottom photo by Leilani Carter. 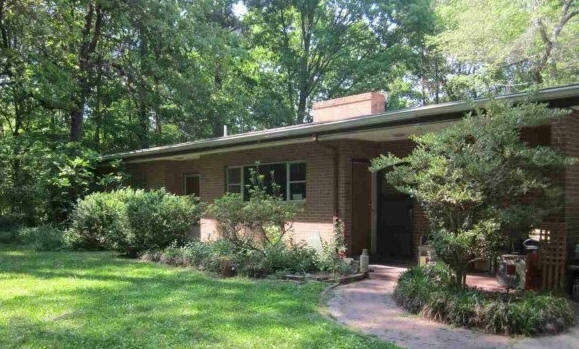 1957 - 402 Ridgecrest Drive, Chapel Hill. Sold in 2017 to Melissa G. and David H. Cline IV. 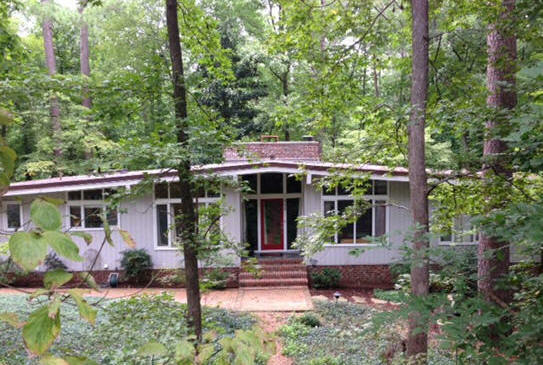 1957 - The Elisabeth W. and Barry T. Winston House, 3 Sycamore Drive, Chapel Hill. 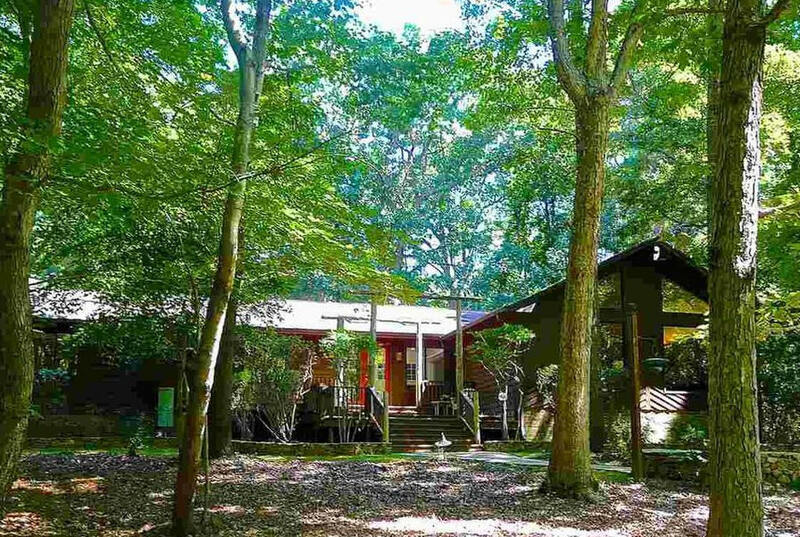 Sold in 1976 to Eleanor and Robert N. Broadus. Sold in 1997 to Nina C. Diamond. Sold in 2003 to Kristin M. Hondros and William G. Fick III. Sold in 2014 to Laura T. and James P. Griffin. 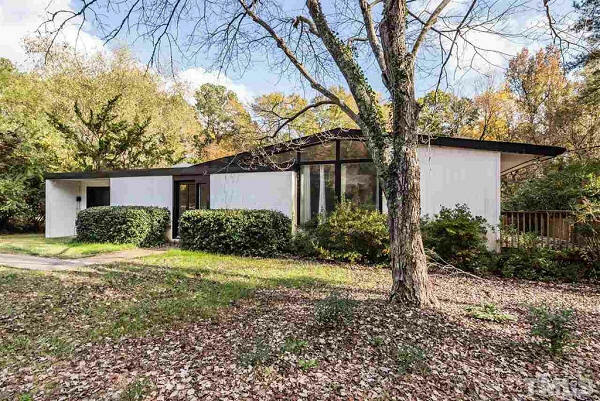 1957 - The John S. Clayton House, 1115 Sourwood Circle, Chapel Hill. Manufactured by the National Homes Corporation. 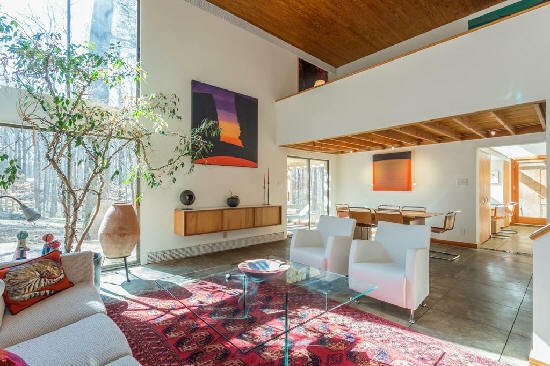 Sold in 1967 to Helen Norgord Gillin. Sold in 1996 to Joseph Sica. Sold in 2002 to Thomas C. Tucker. Sold in 2007 to Cheryle J. Wicker. Sold in 2011 to Sandra and Michael McManus. Sold in 2013 to Jeanne A. Shanahan and Thomas M. Simon. 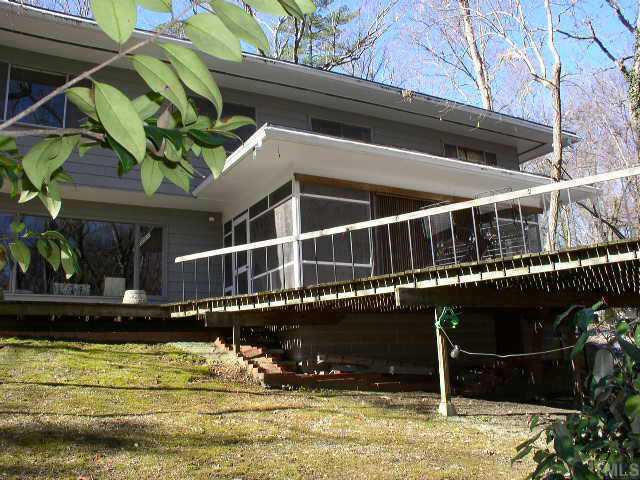 1957 - The Ann Thibaut House, 1004 Highland Woods Road, Chapel Hill. Designed by Chicago architect Edward D. (Ned) Dart. Built by Van Thomas of Siler City NC. The family lived there for over 50 years. Sold in 2011 to Alexander McLachlan and Mary Turner. 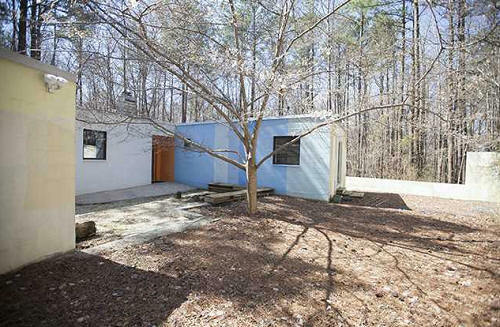 1957 - 312 Ridgecrest Road, Chapel Hill. Unknown architect. Sold in 1989 to to Sledge Chip Corporation. Sold to Virginia S. Koelle. 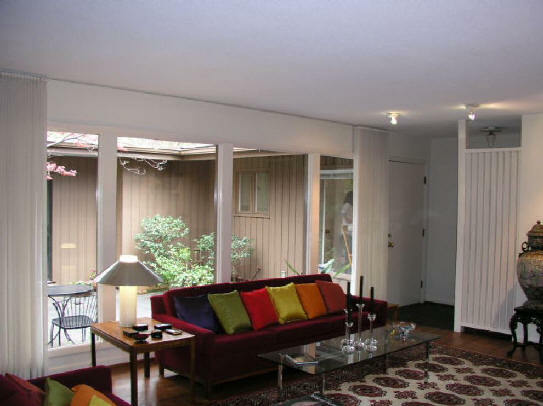 Sold in 1992 to Sonya Ishii and James Hirschfield who still owned it as of 2012. Studio addition by Dail Dixon. Photo by Dail Dixon. 1957 - 806 Kings Mill Road, Chapel Hill. Architect unknown. Sold to Kenneth Hoff. 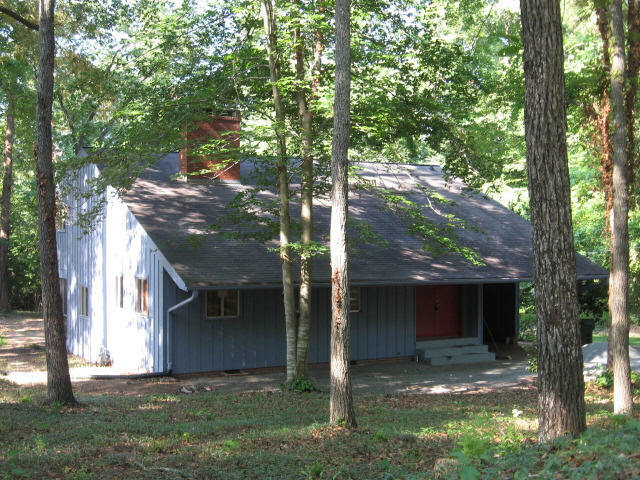 1958 - The Harold and Mary Ellen Bierck House, 1019 Highland Woods Road, Chapel Hill. Architect unknown, but possibly Jim Webb. Built by Van Thomas. Renovated. Deeded in 2014 to Richard and Mary E. B. Bierck. Sold in 2016 to Marian and John Rice. 1958 - 916 Kings Mill Road, Chapel Hill. Architect unknown. 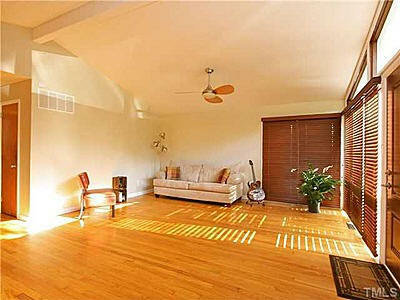 1705 square feet. 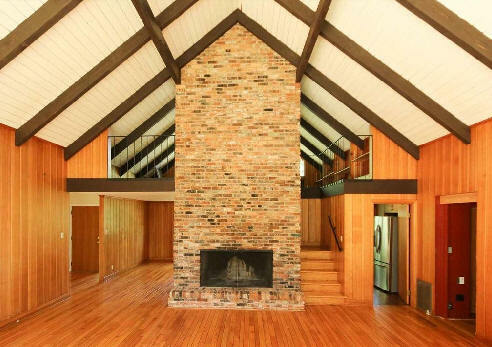 Sold in 1965 to Richard and Nancy Knapp. 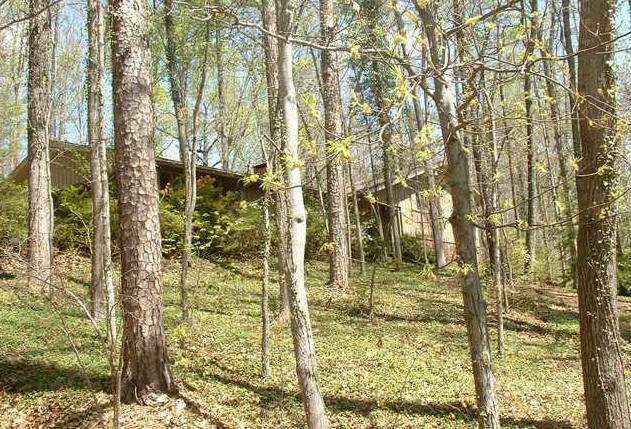 Sold in 1977 to Albert Richard Elam, Jr. Sold in 1999 to Margaret Able Elam. 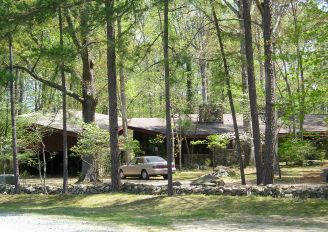 Sold in 2001 to Doris E. and Edward Jackem who still owned it as of 2012. Photo by Dail Dixon. 1959 - The James R. and Gladess Hudspeth Crisp House, 1912 Rolling Road, Chapel Hill. Architect unknown. Built by a Mrs. Bone. 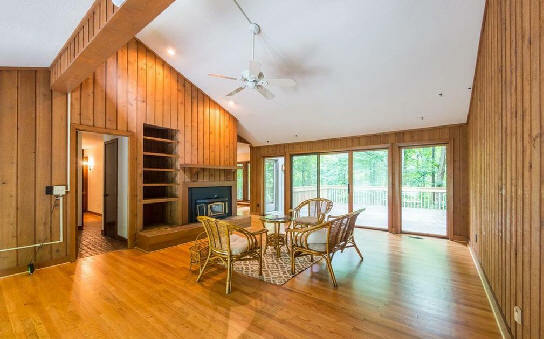 Deeded in 1975 to Gladess. 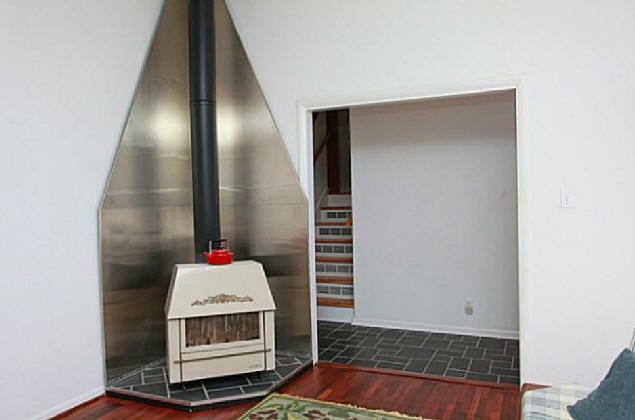 Sold in 2016 to Thorrarin R. Einarsson and Gudrun Johnsen. 1959 - 313 North Estes Drive, Chapel Hill. Sold in 2017 to Bonnie McManus and David Ingram. 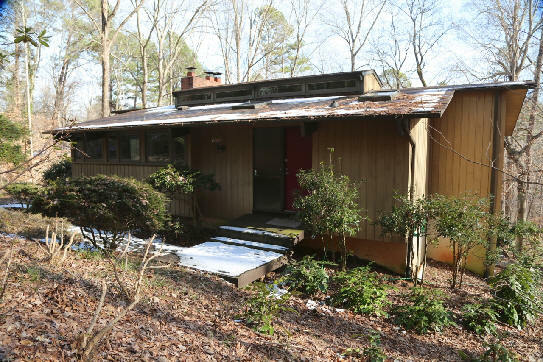 1959 - The Anne L. and Donald B. Anderson House, 620 Greenwood Road, Chapel Hill. 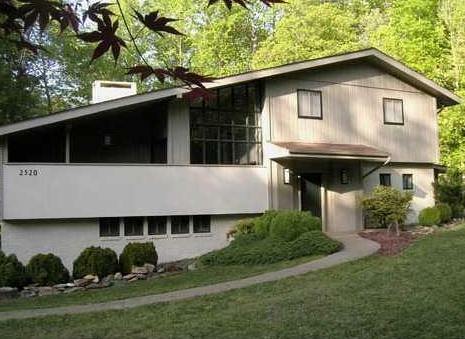 Designed by architect Robert Graham Anderson, later the founding Dean of the School of Architecture at UNC Charlotte. 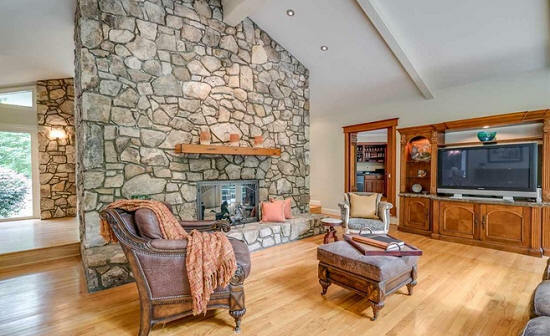 Anderson's father, the owner, hired a builder but also actively participated in construction. 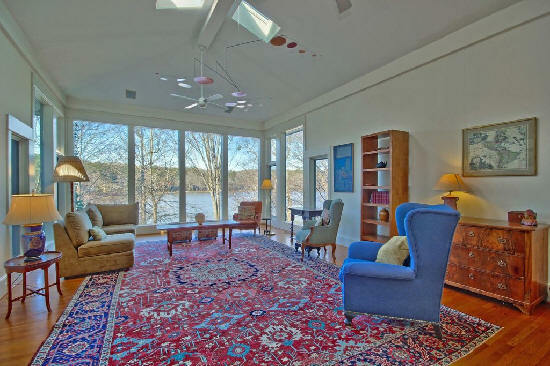 Deeded 2010 to Anne L. Anderson. Was a rental 2009-2013. 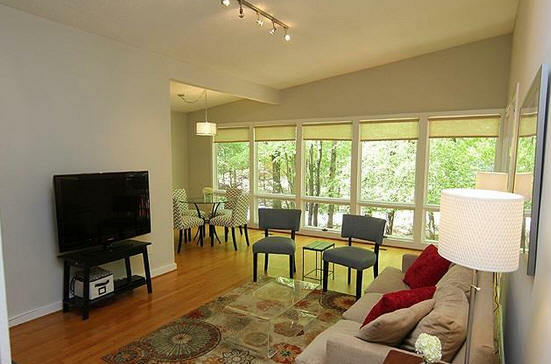 Sold in 2013 to Elaine and Christopher Crowson. 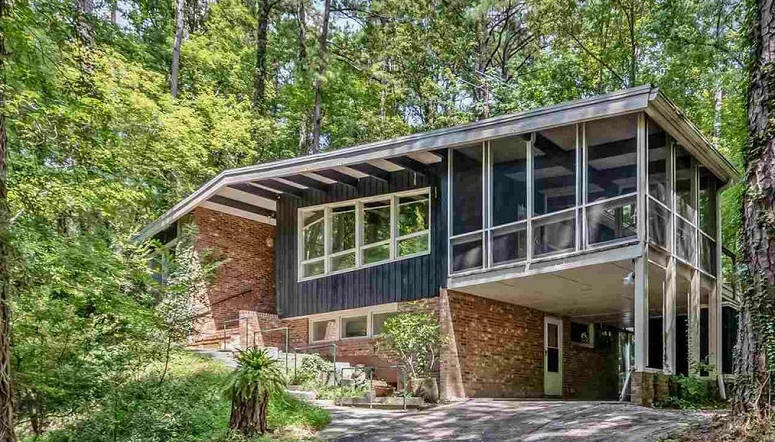 1960 - The Dan Pollitt House, 1018 Highland Woods, Chapel Hill. Architect unknown. 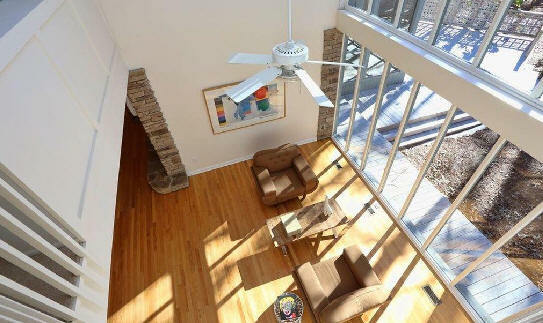 3,000 plus sq ft with in-law suite with separate entrance. Sold in 2012 to Wei and Benjamin Z. Duan-Porter. 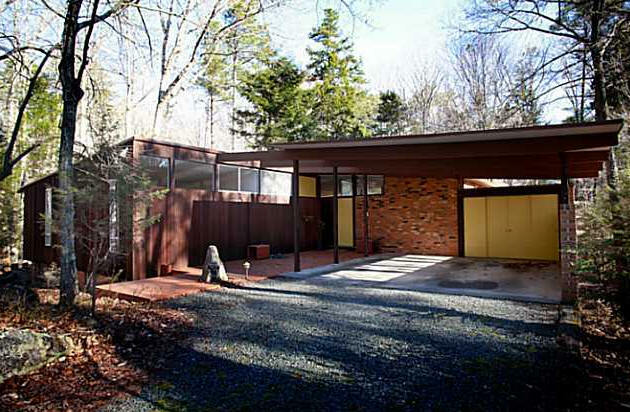 1960 - The Roger and Dorothy Barton House, 1500 Michaux Road, Chapel Hill. Possibly designed by Sumner Winn; needs verification. Built by Carl Ellington. Sold to a Dr. Salisbury. Sold to Marc La Branche. Photo by Jill Blackburn. 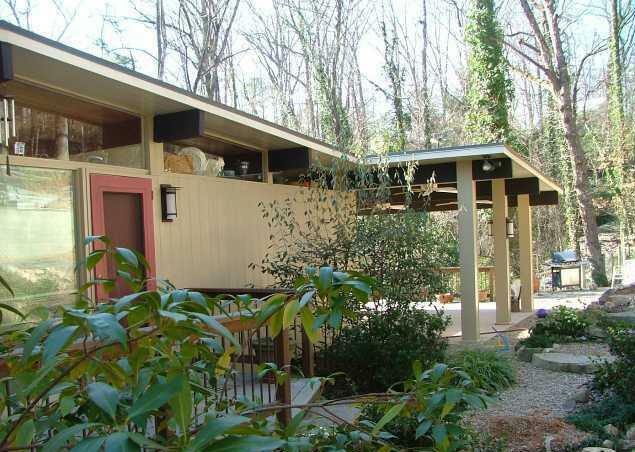 1960 - The Joyce and Dave Dobson House, 1034 Highland Woods, Chapel Hill. 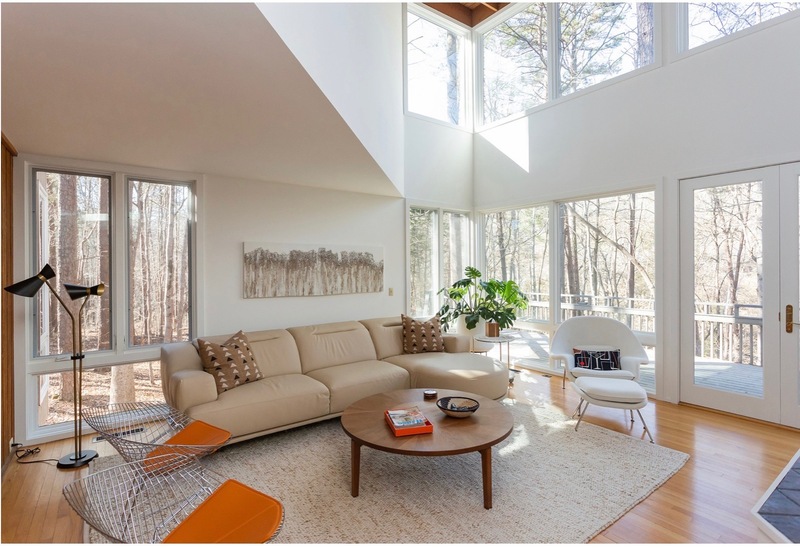 Surrounded by Modernist houses, many by Jim Webb, these owners chose a traditional ranch straight out of the Durham Morning Herald weekly feature on houses. According to their daughter Pamela Dobson, Herman Lloyd was the builder. Sold to Jane and Richard Caswell in 2007. 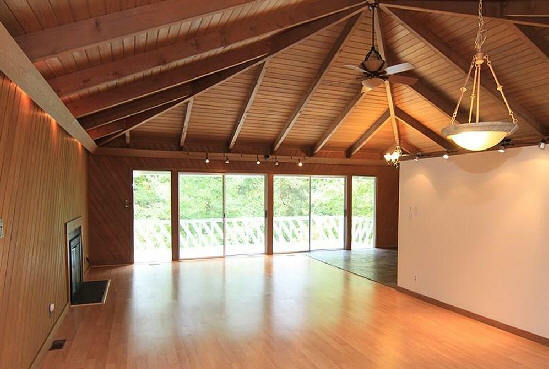 There was a fire in 2009 and the house sat empty for several years. As of 2011, it was rebuilt along more modern lines. 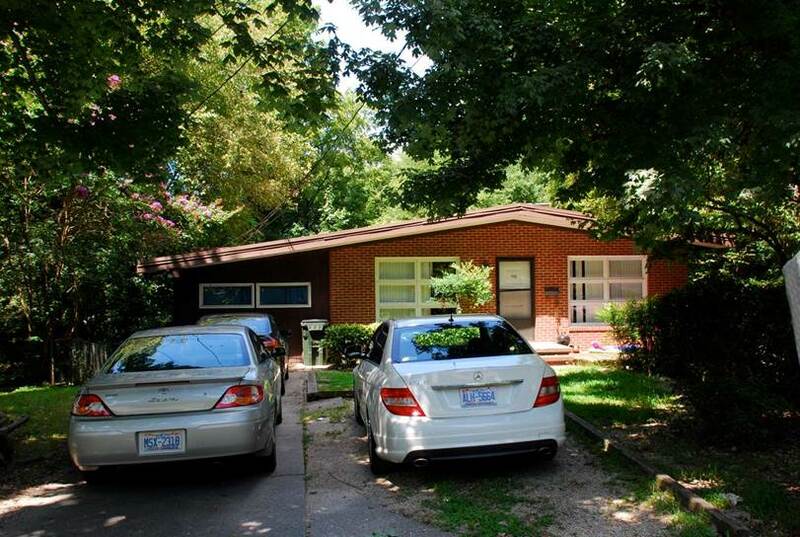 Sold in 2013 to Krista and Matthew Mauck. 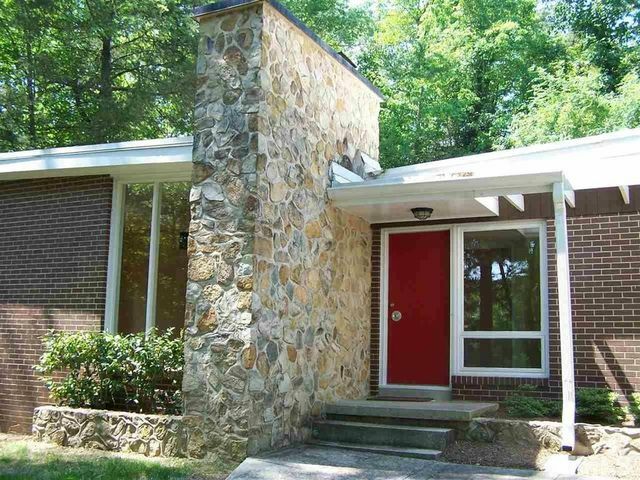 1960 - The Morris and Sylvia P. Gelblum House, 607 Rock Creek Road, Chapel Hill. 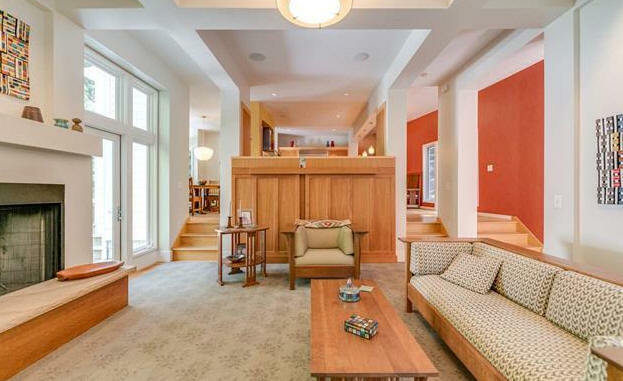 Built from a planbook designed by Richard Pullman, an architect working for Irving Palmquist Homeplanners. Sold in 2006 to Carol A. and Kevin M. Kennedy. 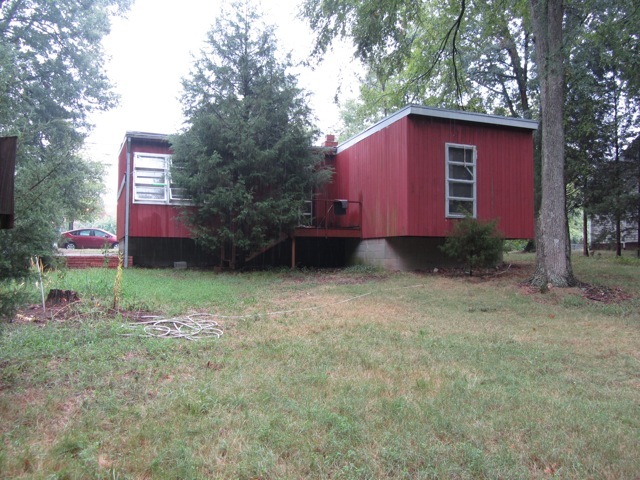 Sold in 2013 to Susan E. Hunter and Charles S. Garrison. 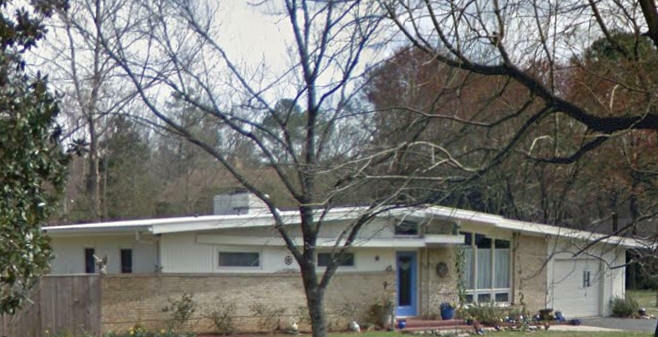 1960 - The Bea M. (Bee F.) and Howard D. Henry House, 211 Marilyn Lane, Chapel Hill. Architect unknown. 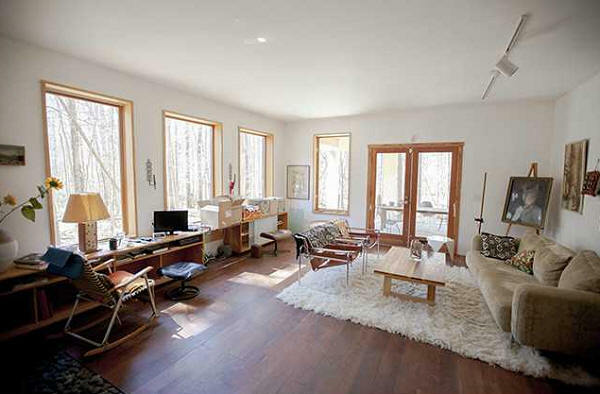 Sold in 2008 to Miriam L. and Robert A. Troxler. Sold in 2013 to Aferdita and Enton Hito. 1960 - The James Mccallum House, 723 Smith Level Road, Chapel Hill. Architect unknown. Still with original owners as of 2014. 1960 - 1909 South Lakeshore Drive, Chapel Hill. Architect unknown. Sold in 2015 to Mary K. and Rene Lorenz. 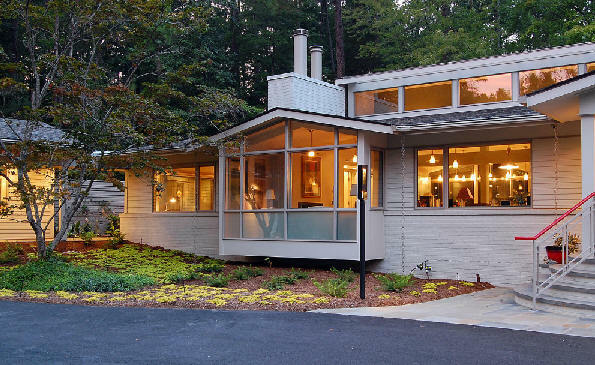 1961 - The Thom and Beulah Stowe Collins House, 1920 South Lakeshore Drive, Chapel Hill. Architect unknown. The family had a colonial-era church bell they rung every July 4, according to former neighbor Kathy Higginbotham. Beulah Collins died in 1983. 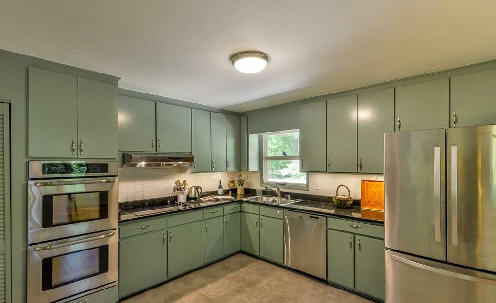 In 1985 the house was sold by sons Todd, Paul, and Kent Collins to Louis Crittenden who redid the kitchen and bathrooms. Sold in 1989 to William Edward McConaghay. Sold in 2004 to Richard Crandall. 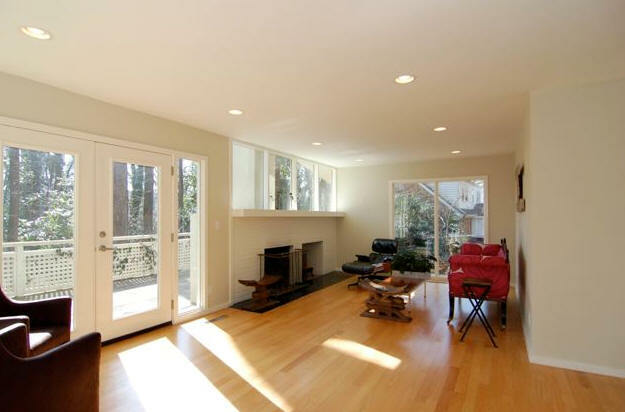 Sold in 2006 to Chad and Jennifer McGlone. 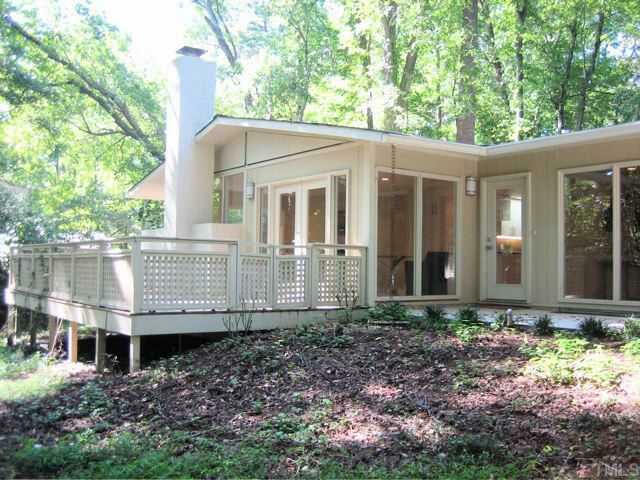 Renovated by Steven Fisher of Carrboro who closed in the carport and added a second story. 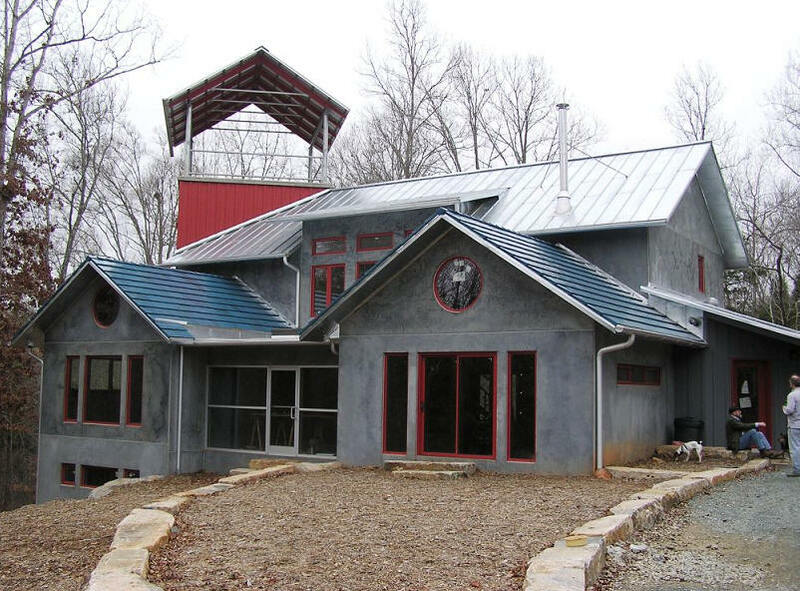 As of 2009, none of the owners know the name of the original architect. Kent Collins recalls the builder as M. J. Cowell. 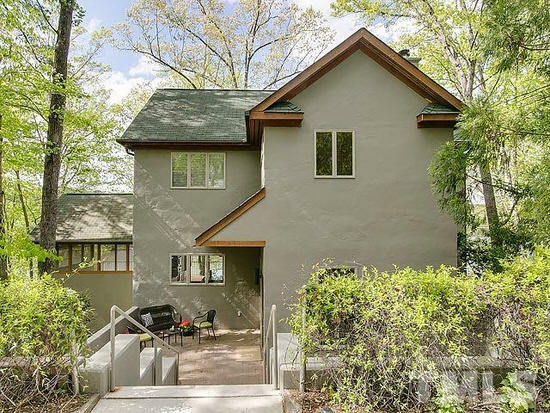 He also recalls that the original house number was 15 Lakeshore Drive; in the 1970's, Chapel Hill renumbered the entire Lake Forest neighborhood. 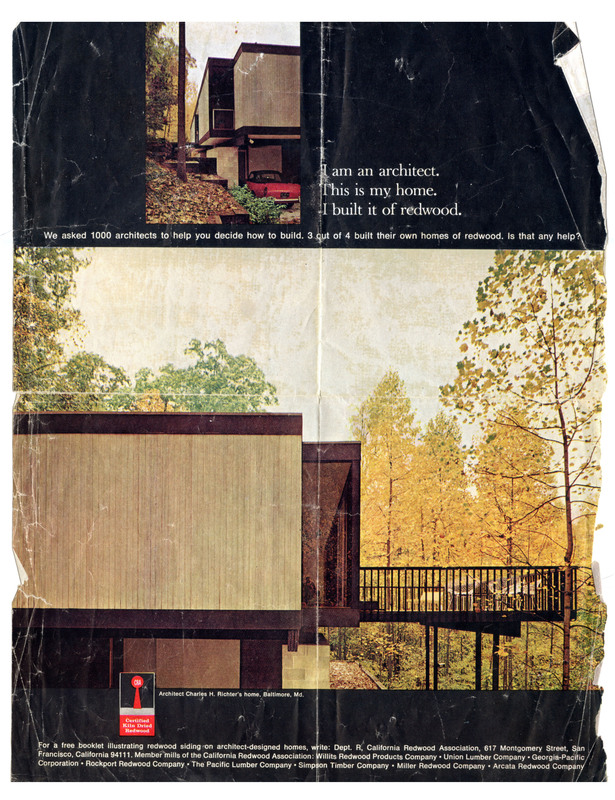 1961 - The Wettach House, 615 Greenwood Road, Chapel Hill. Deeded in 1972 to Helen J. Wettach. Sold in 2016 to Vanessa L. and Joshua D. McCullough. 1961 - The Francis X. 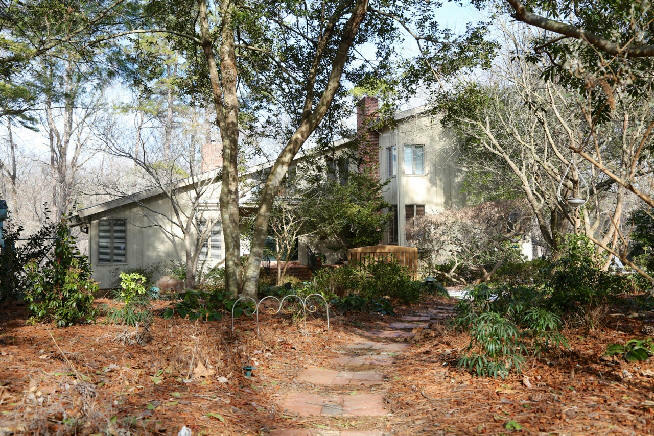 Foster and Constance E. Foster Residence, 381 Wesley Court, Chapel Hill. 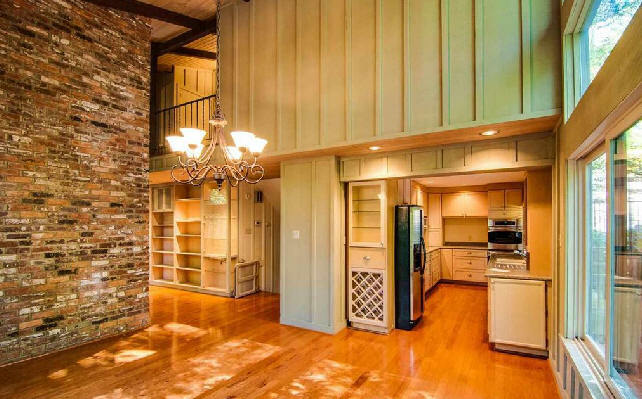 3100 square feet. 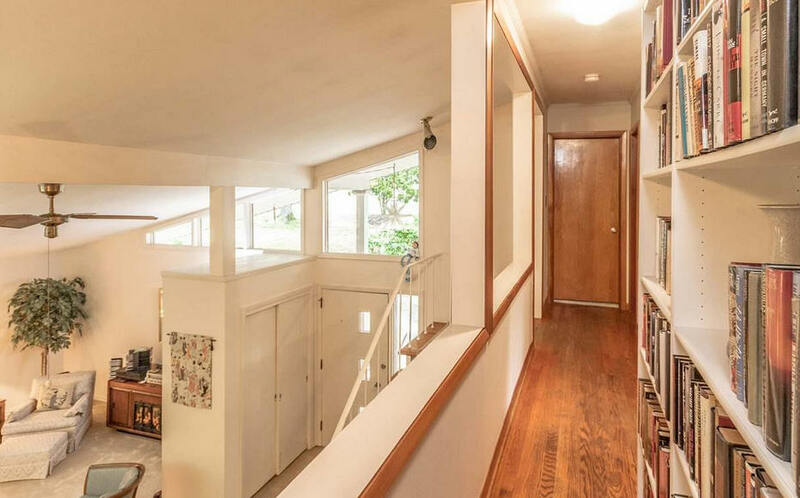 Although not Modernist in the traditional sense, this plain looking split-level was unique on the inside. Constance Foster significantly modified a magazine plan and got John Cates to build it for $22,000. Some subsequent owners recall it without fondness; the layout was chaotic and didn't make sense. It has been subsequently renovated and improved. 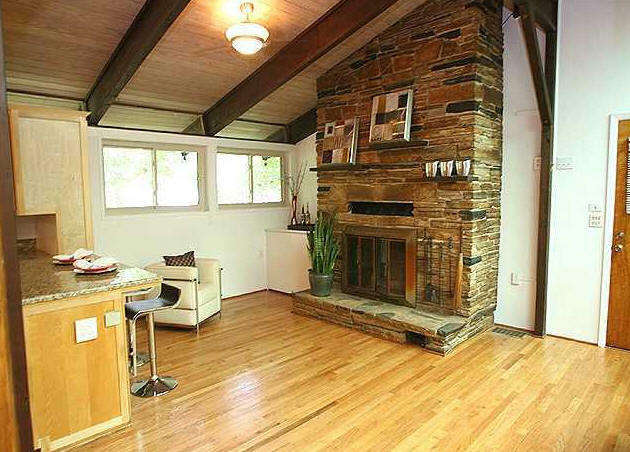 Sold in 1964 to Maurice and Marcia Hall. 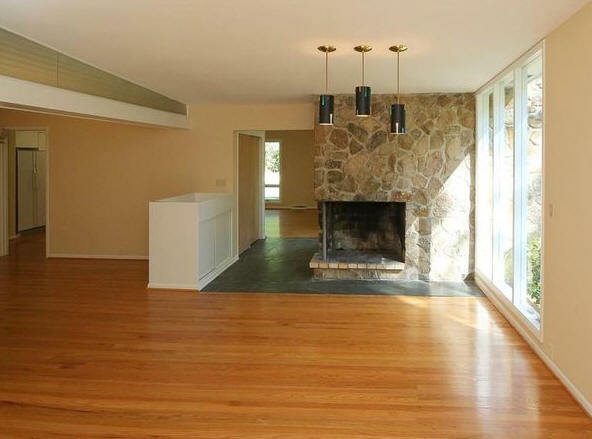 Sold in 1967 to William J. and Sally L. Powers. 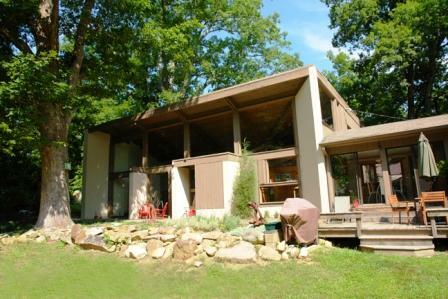 Sold in 1971 to Andrew McDowd (Mac) Secrest and Ann Secrest. Sold to Donald W. Johnson. Sold to Liselott Weininger Mathews. Sold to James Gray McAllister. Sold to Gordon R. Dragt. Sold in 1985 to John L. and Evelyn Monroe. 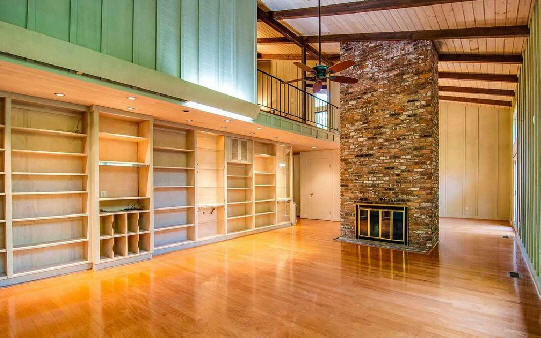 Sold in 1990 to Gregg D. and Carmela Kemp. 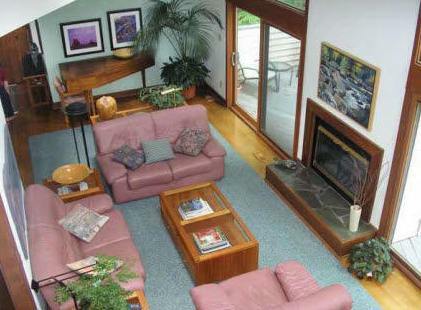 Sold in 1992 to Don Andrews and Amy Svoboda. Sold in 2005 to Michael and Sally Gray. Sold in 2006 to Charles and Christine Stanley. 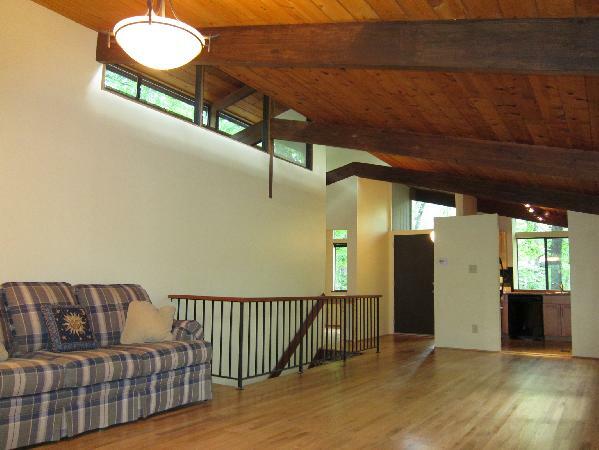 Sold in 2009 to Brian Laduc and Louise Williams. 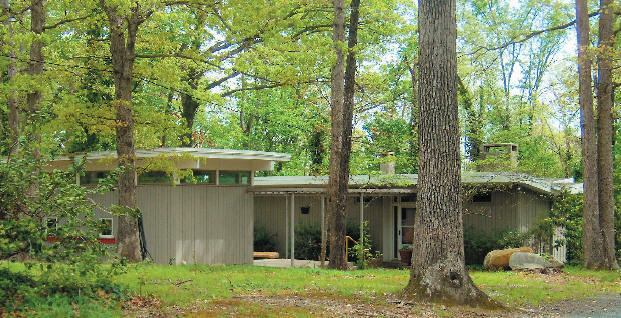 1961 - The Earle and Elaine M. Wallace House, 215 Marilyn Lane, Chapel Hill. Architect unknown; the design may have been from a plan book, according to their son, Scott. 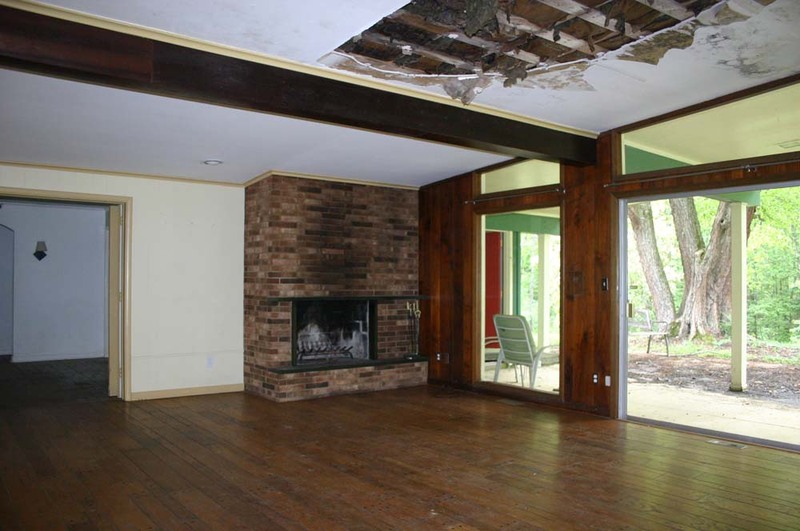 There was a fire in the 1980's that did extensive structural damage. 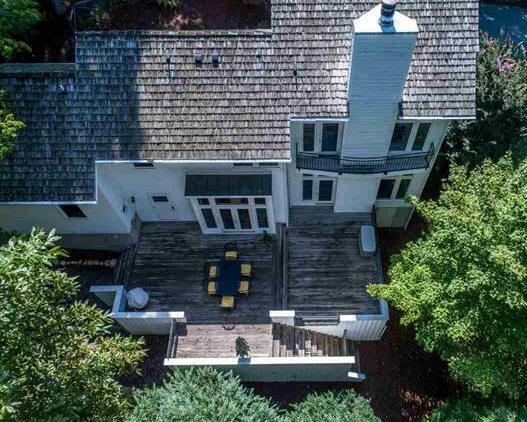 The house was rebuilt and sold in 1993 to Christopher S. and Denise M. Adams. Sold in 1996 to Holden Thorp. 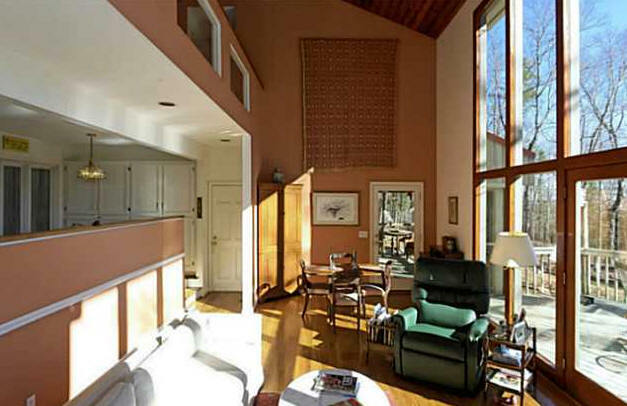 Sold in 1999 to Coalter Lathrop and Amy Santin. 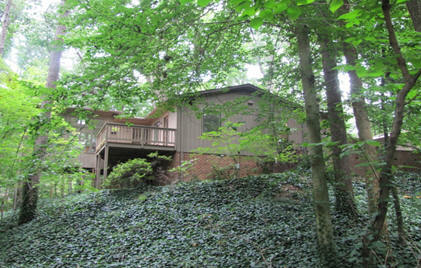 Sold in June 2010 to Keith Hayes and Bridget Hillyer. 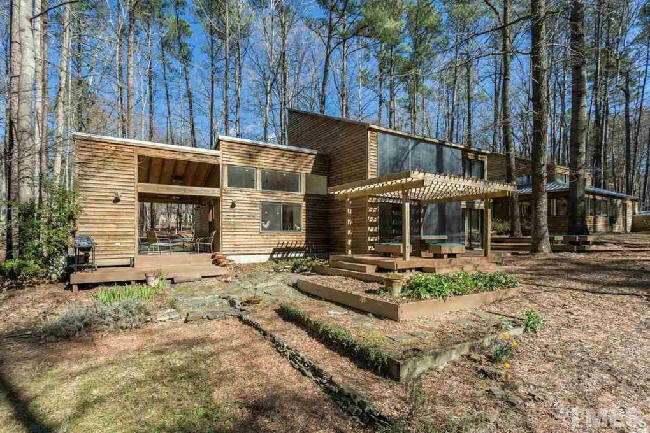 1962 - The Gilbert and Kathleen Berentzen Chase Residence, 2105 Damascus Church Road, Chapel Hill. 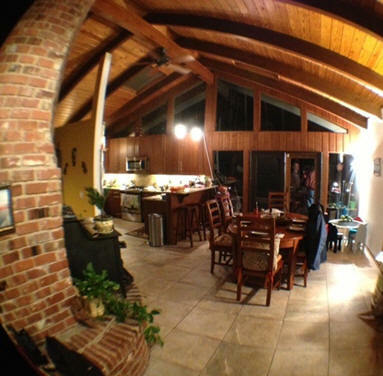 The architect was John Eldridge (Jack) DeCell III from Yazoo City MS and New Orleans LA. DeCell graduated from Yale in 1958 and was a Fulbright Scholar in Italy from 1960-62. The builder was Robert Oakes. Sold to James and Marylin Riddle. Sold to John Edmund Phillips. Sold to Mary Beth Powell. Sold in 2005 to Richard and Cyan Godfrey. Arthur Cogswell did an addition in 1972. 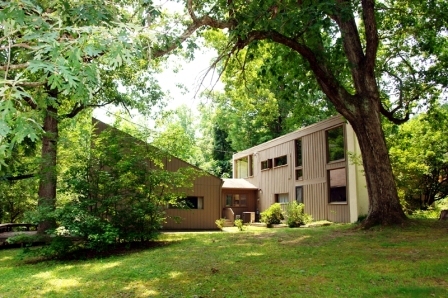 1962 - The Robert M. Lester Jr. and Margaret C. Lester House, 117 Bowden Road (aka SR 1946, Chapel Hill. 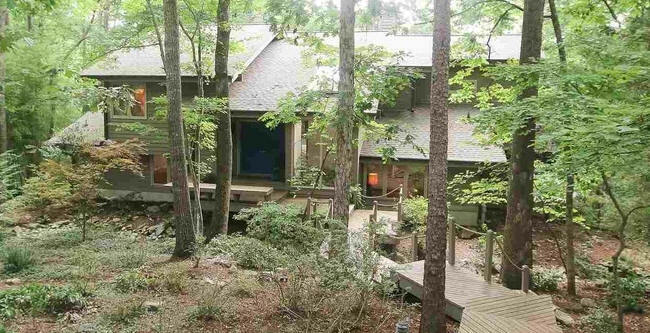 7.5 acres. Designed by Robert M. Lester, Jr. He asked a local architect to draw up his idea. Built by a local contractor. 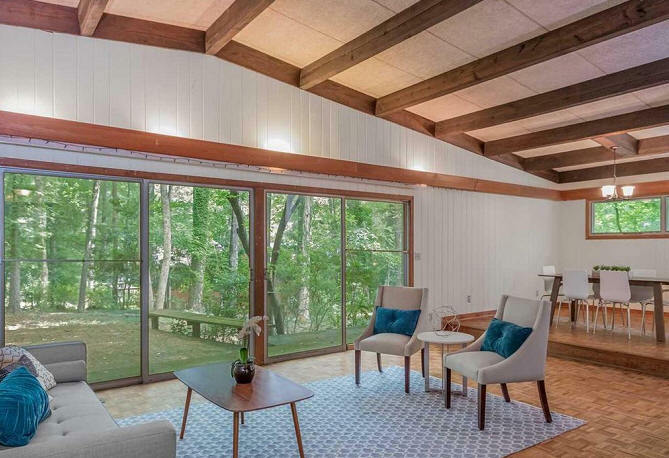 A large addition came later in 1962 including an entry foyer with half bath, study, and master suite on the south side of the house. 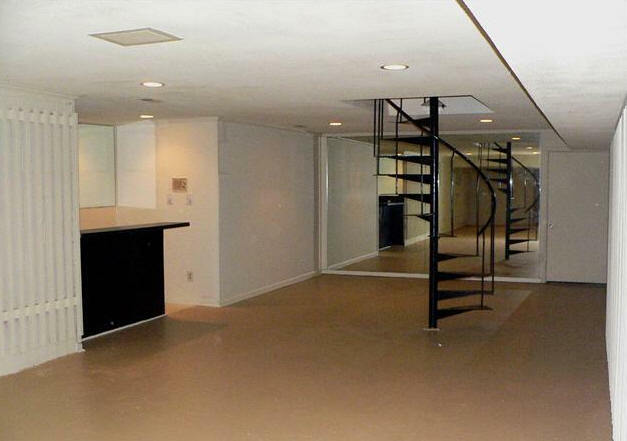 The basement, added with the addition, was intended to be a rec room. 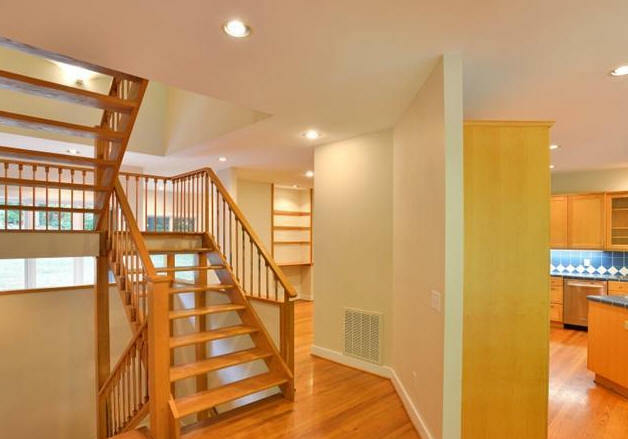 It included both an exterior stairwell and door and trap-door access from a closet inside the master suite. 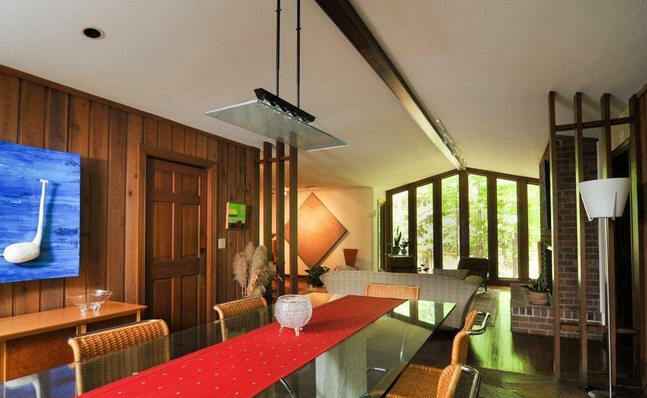 Sold in 1979 to Bernard Flatow. 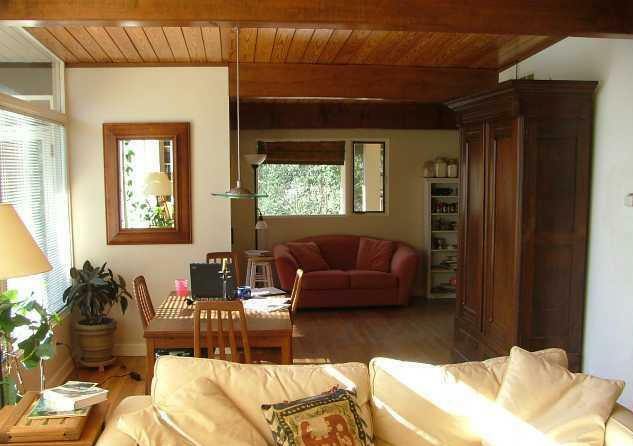 Sold in 1999 to Eugene and Susana Polisky. As shown in the lower photos it seriously deteriorated. 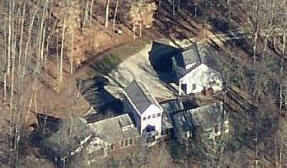 Foreclosed in early 2011, then sold in 2011 to Edward H. Kennedy. Sold in 2012 to Robert and C. Shuping. Top two photos by Brooks Lester. 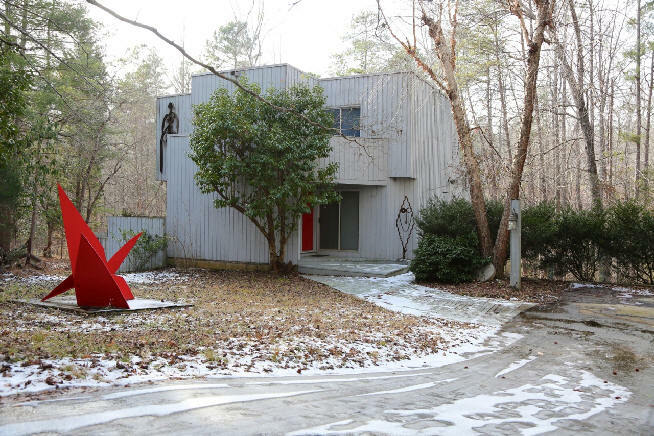 1962 - The Jonas and Alice Kessing House, 401 North Elliott Road, Chapel Hill. 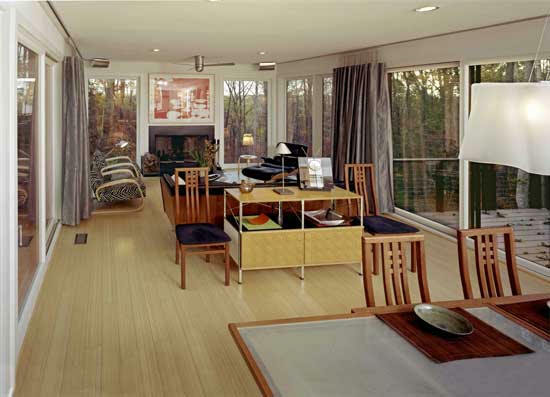 This was a prefab house designed by Richard Wright. 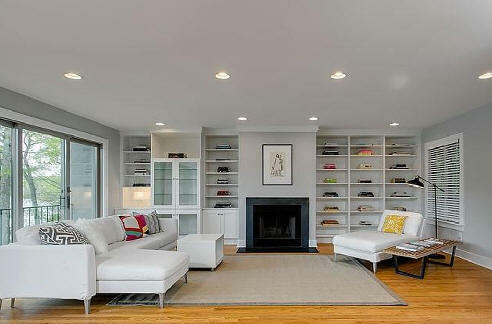 According to Alice Kessing, they hired Oliver Spainhour to put it together and add on a room. They added on again in 1964. Sold to Samuel Longiotti in 1973. Sold to Edward and Jean Lacombe in 1981. 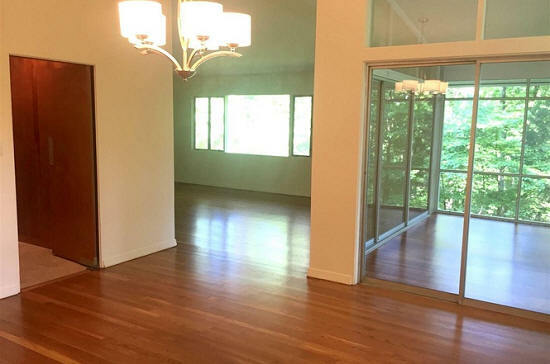 Sold in 2010 to Wai Lee Lui and Johannes M. Hoerler. 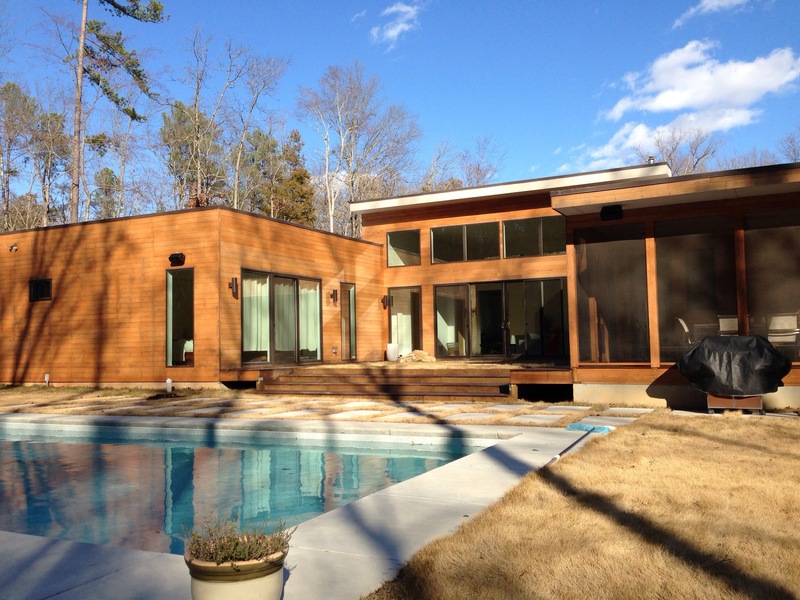 Renovation/addition in 2011 designed by Vinny Petrarca and built by David Ballard Construction. 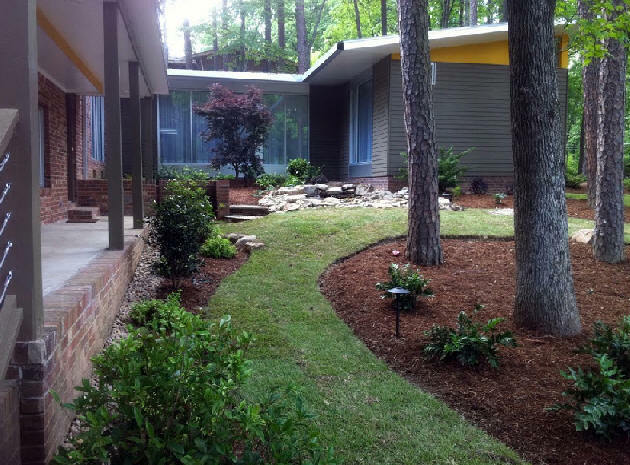 Landscaping by Francis Landscaping. 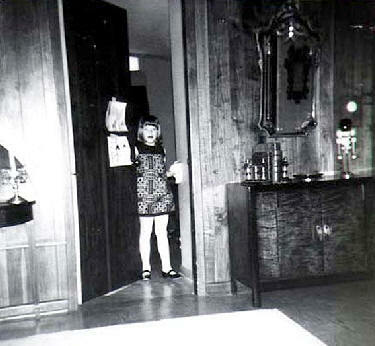 1962 - The Bill and Clarice Page House, 400 Lindsay Street, Carrboro. Built by Bill Page's uncle, Ed Mann. 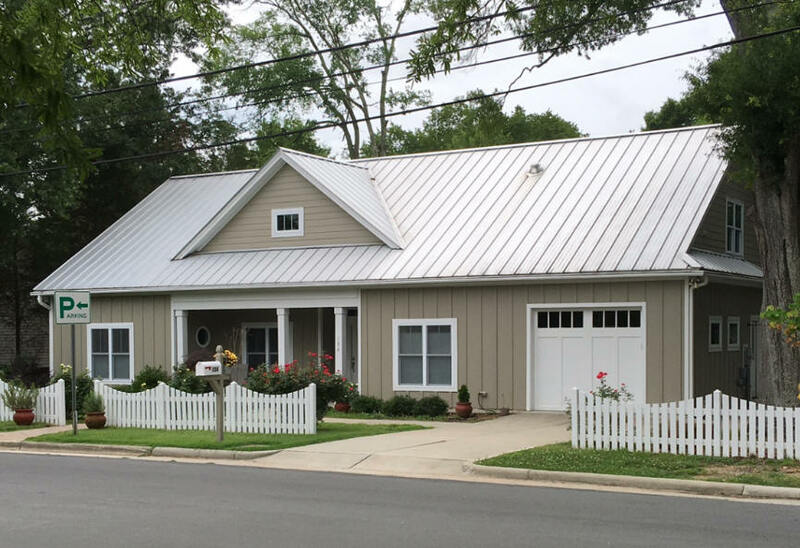 After a tree limb hit a car, Bill Page built another garage, second photo. 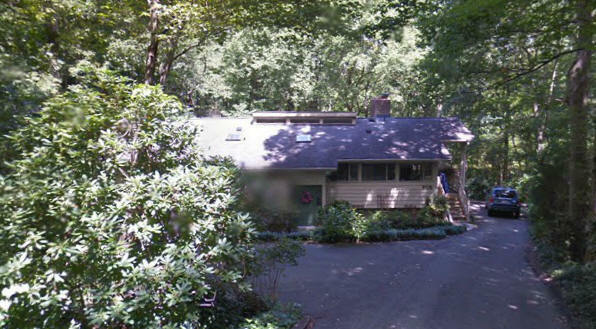 1962 - 2013 South Lakeshore Drive, Chapel Hill. Architect unknown. Sold in 2016 to the Lynne K. and Charles H. Hicks Revocable Trust. 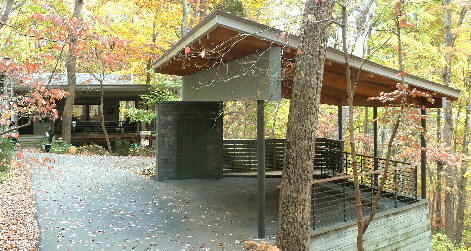 1962 - The Claude and Sara McClure House, 300 Lone Pine, Chapel Hill. 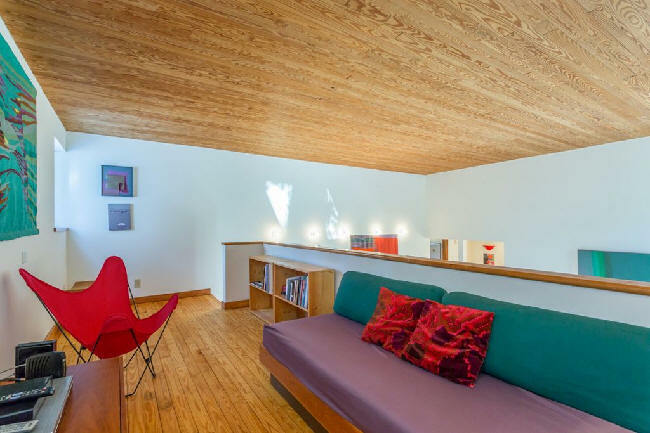 Designed by Palmquist and Wright. Deeded in 1991 to Sara McClure. Deeded in 1997 to Frances McClure. 1962 - 1008 Hillside Drive, Chapel Hill. Architect unknown. Sold in 2016 to Maria A. Guadalupe and Lino B. Guzman. 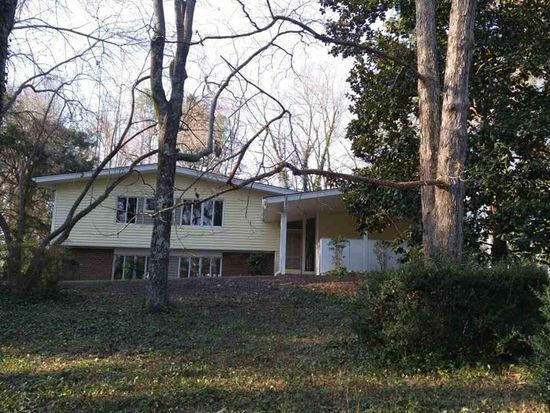 1964 - The Paul L. and Mary Ellen Jones Munson House, 407 Clayton Road, Chapel Hill. Designed by Carlyle John (Lyle) Stehman. 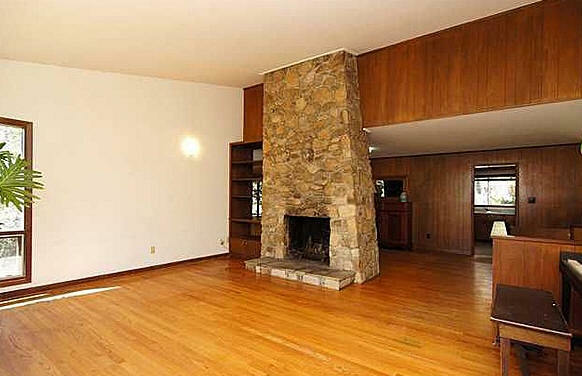 Sold in 1971 to Kenneth B. and Cecily Collins. Sold in 1972 to Paul T. Tompkins. 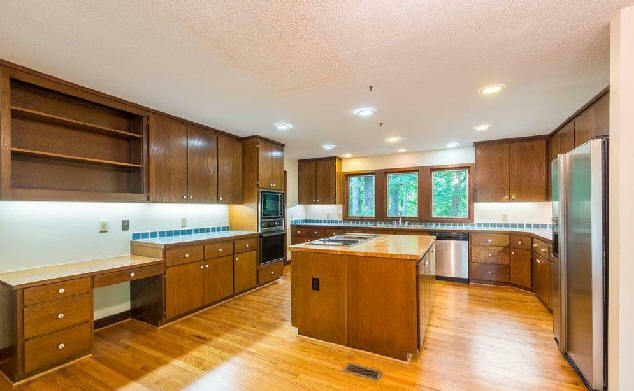 Sold in 1976 to Thomas L. Eisenhower. 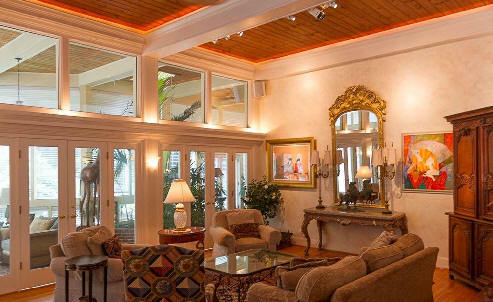 Sold in 1984 to Louis and Genevieve A. Jansen who still owned it as of 2012. Photo by Heather Wagner. 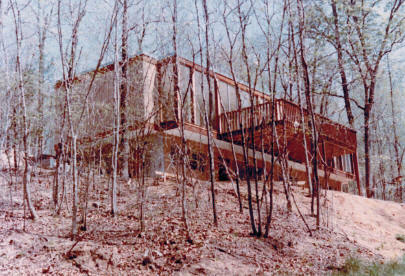 1964 - The Helen M. and Maurice M. Henkels, Jr. Residence, 2304 Honeysuckle Road, Chapel Hill. Architect unknown. 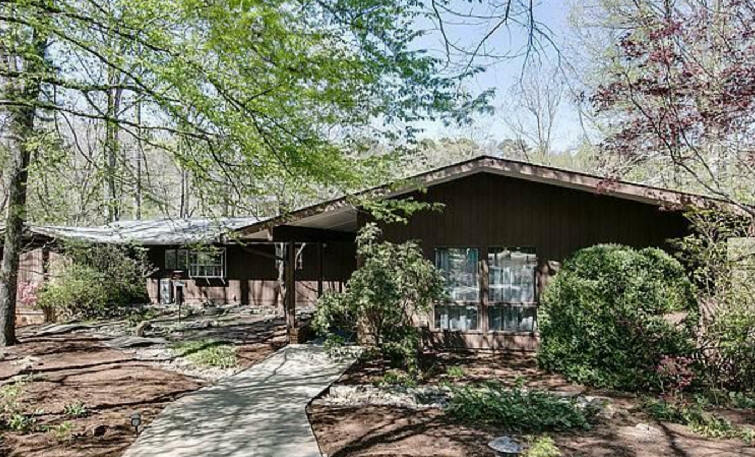 Sold in 1974 to Sarah and Frances F. Harrell. Sold in 1990 to Lucy A. Savits and David A. Savits. Sold in 2005 to Lucy A. Savitz. 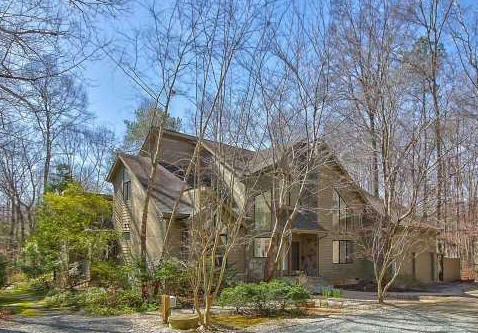 Sold in 2011 to Carol A. Prokop and R. Woodrow Setzer, Jr.
1964 - 1505 Halifax Road, Chapel Hill. Architect unknown. Sold in 1999. 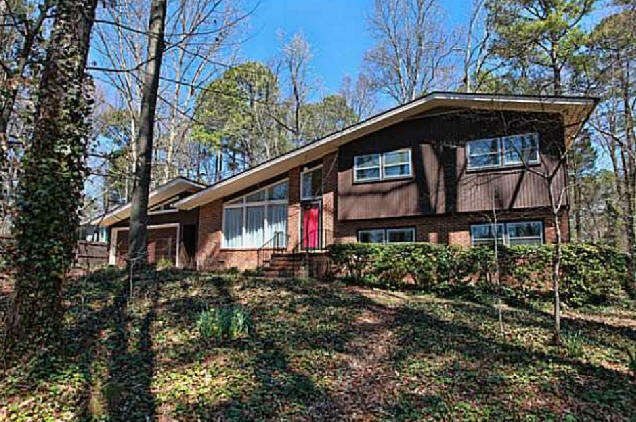 1965 - 600 Brookview Drive, Chapel Hill. Sold in 1990 to Robert C. English. 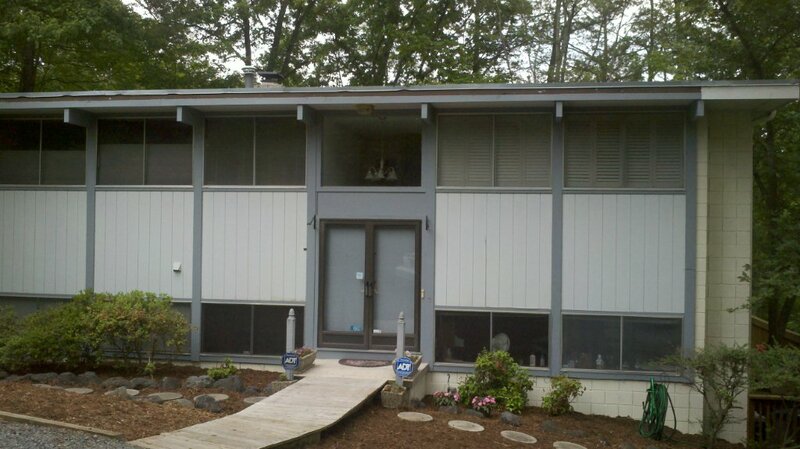 Sold to John and Jeanne Moran. Sold in 1999 to Sara Sommers and Randy Cubrilovic. 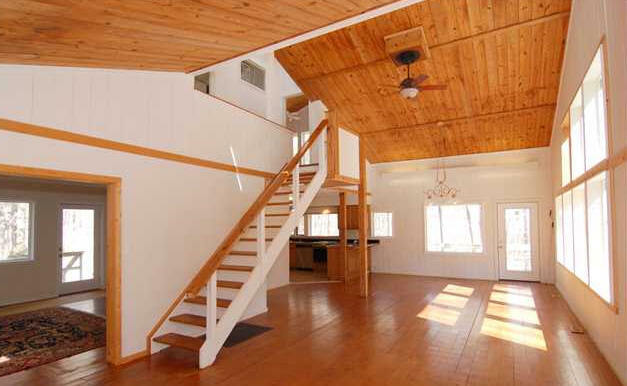 Sold in 2002 to Tara Pressley and Lars. F. Jarskog. Sold in 2008 to Gary and Ruth Little who still owned it as of 2015. 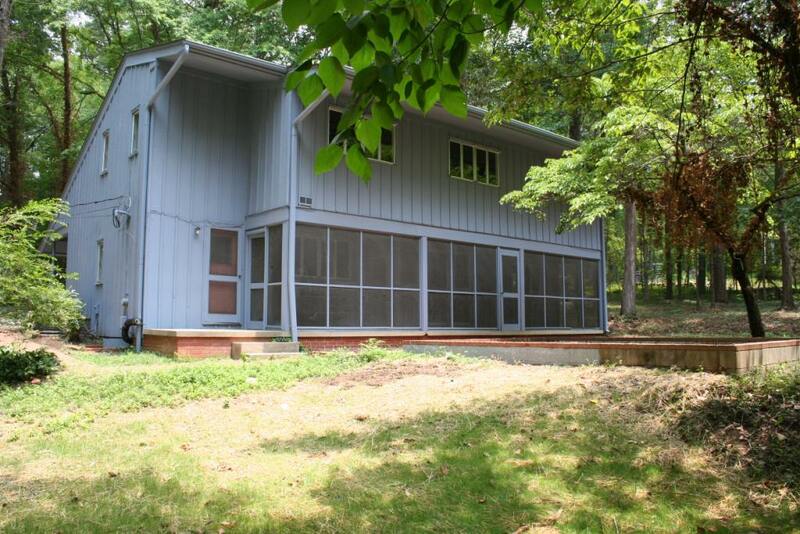 1965 - The Marianne S. Breslin House, 1704 Michaux Road, Chapel Hill. Commissioned 1964. Designed from a plan book written by Rudolph A. Matern. Built by Herman B. Lloyd. Photo by Jill Blackburn. Sold in 2018 to Ian E. Jackson. 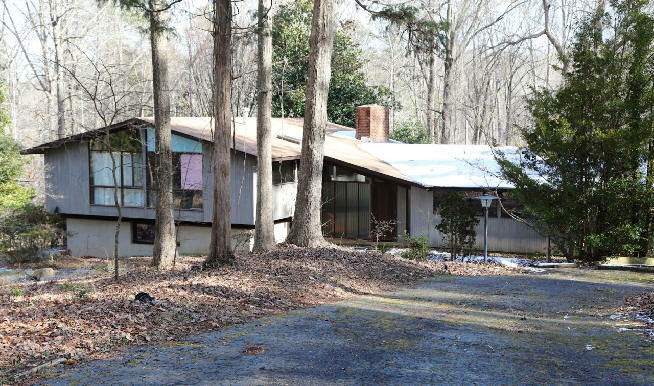 1965 - The Troy and Roberta Chandler Andrews House, 600 Bolin Brook Farm Road, Carrboro. 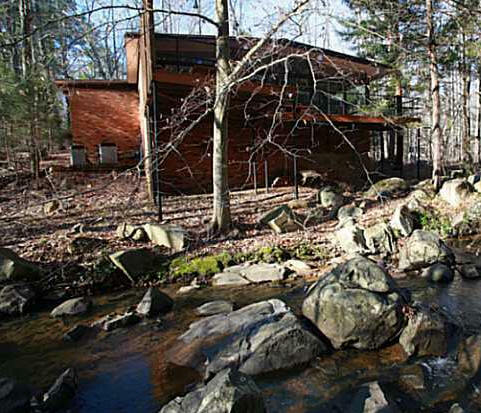 Designed by the Swiss architect Franc Sidler, student of Frank Lloyd Wright at Taliesin in the early 1950's. 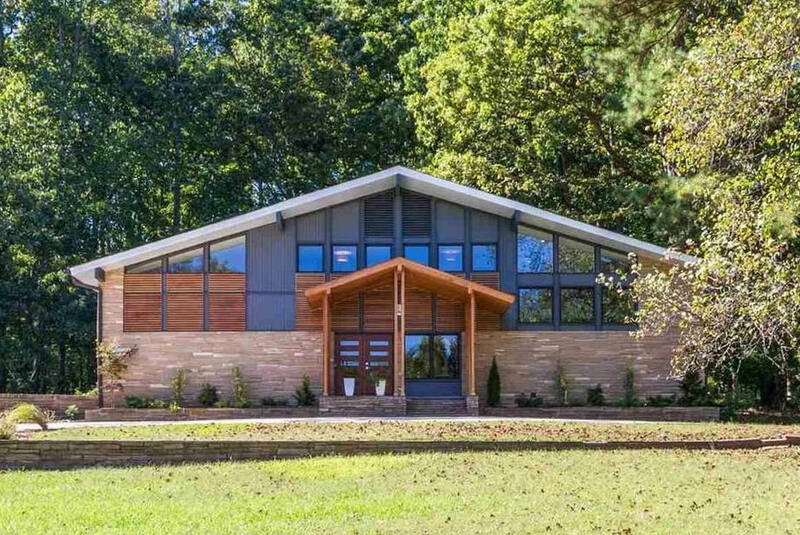 Sidler was not involved in its construction but he did attend the housewarming party along with several invited faculty from the NCSU School of Design. 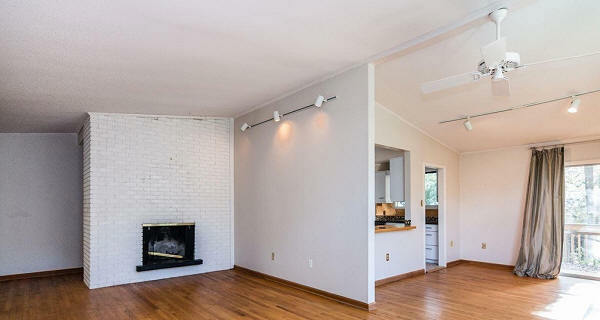 The walls of the house are made primarily of a light-colored lava (dacite felsite) which came from a local volcano that was active about 650 million years ago. 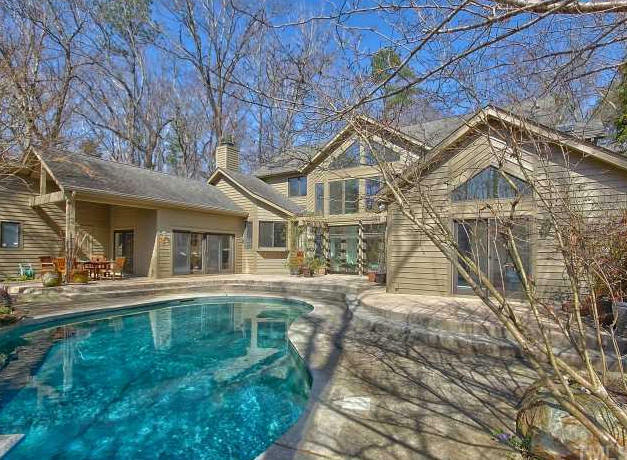 As of 2012 owned by their daughter, Jean Earnhardt, and her husband John. 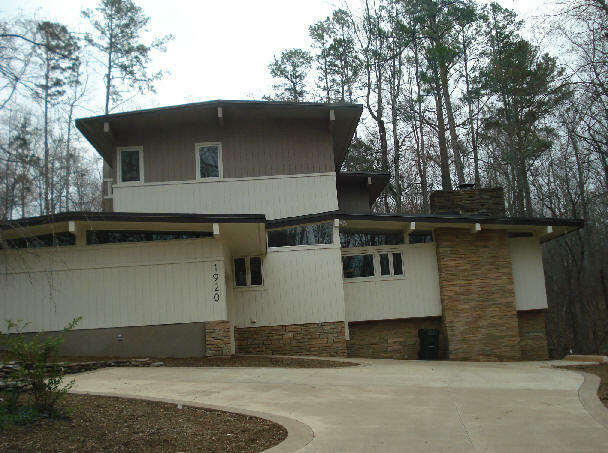 1965 - The Patricia and Paul J. Kropp House, 606 Concordia Court, Chapel Hill. Designed by James A. Alexander. Built by J. P. Goforth. Sold in 2013 to Beverley L. and Amos G. Tyndall. 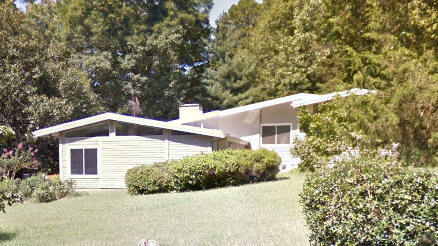 1965 - 115 Meadowbrook, Chapel Hill. Architect unknown. Sold in 2015 to Pallavi Sukhia and Virmani Singh. 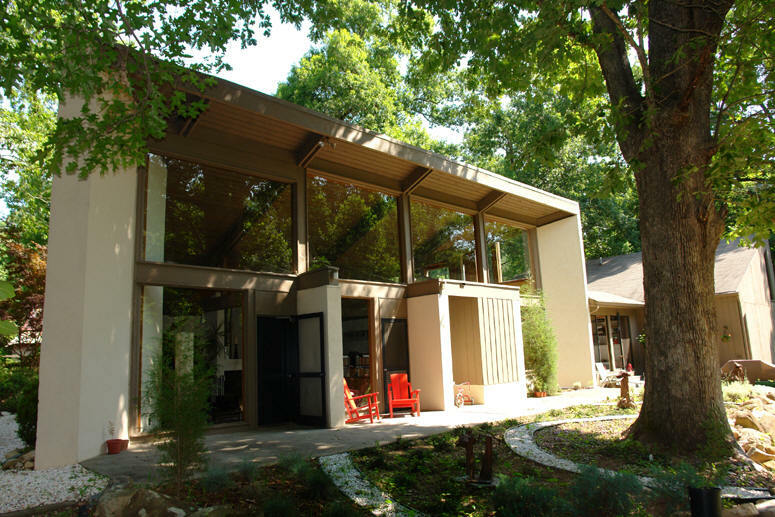 1965 - The Marie N. and Charles N. Reilly House, 2025 South Lakeshore Drive, Chapel Hill. Sold by heirs in 1982 to Barbara W. and Thomas F. Boat. Sold in 1993 to Jeffrey C. Richardson. 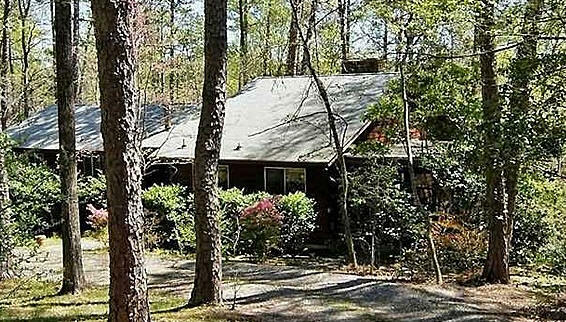 Sold in 1994 to Mary Lou Melville and Richard J. Gugelman. Sold in 2016 to Barbara N. and John K. Watkin. 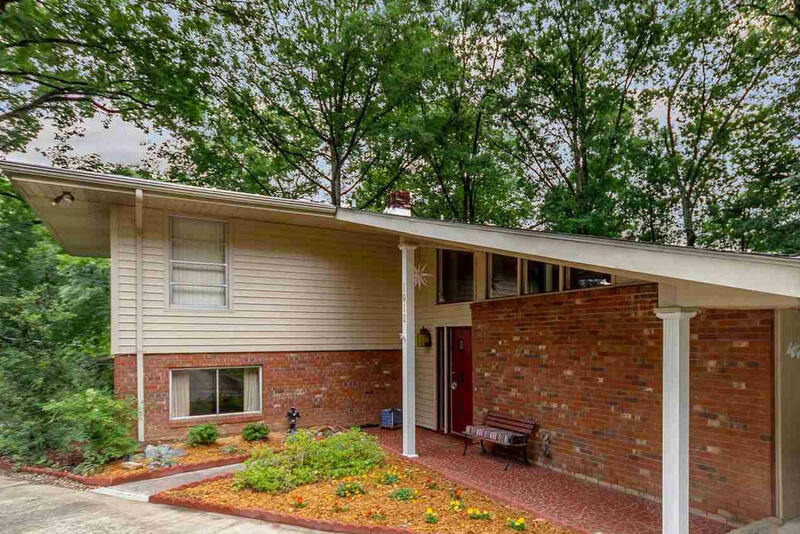 1965 - 67 Burris Place, Chapel Hill. Deeded in 1988 to Libby C. Lefkowitz. Sold in 1992 to Julian B. and John Rosenthal. 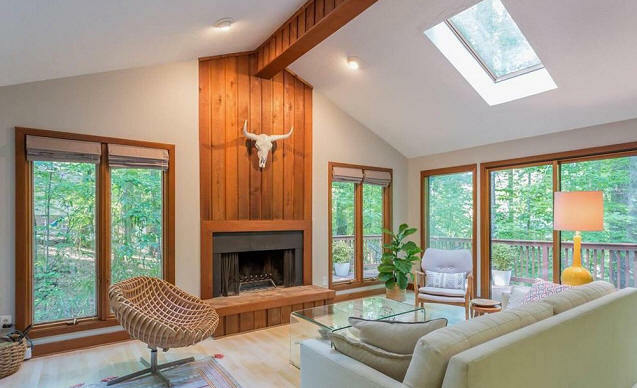 Sold in 2018 to Debra M. Zaret and Rodney D. Mclamb. 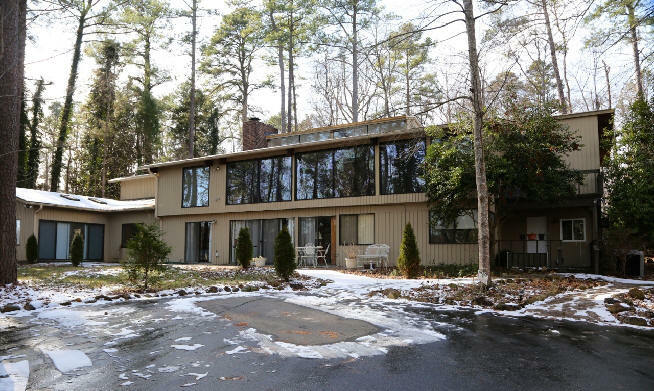 1966 - The J. Herbert (Herb) and Catherine Holland House, 1904 South Lakeshore Drive, Chapel Hill. Unknown architect. Built by J. P. Goforth. 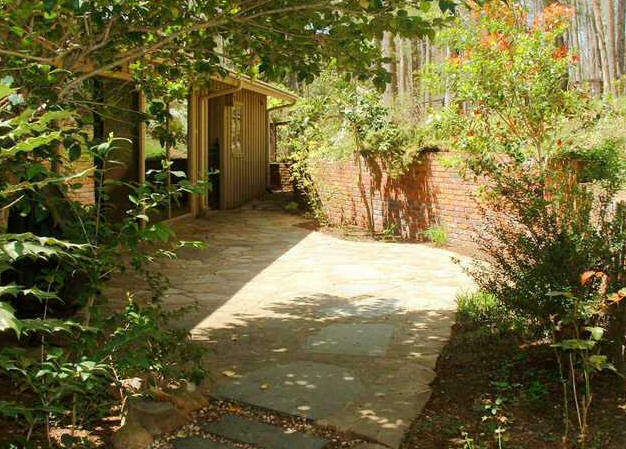 Sold in 1970 to Joseph J. and Jamescina Degraffenreidt, Jr. Sold in 2006 to Scott Dwyer. Exterior photo by Dail Dixon. Sold in 2012 to Katherine M. Norton and Fernando B. Salcedo. 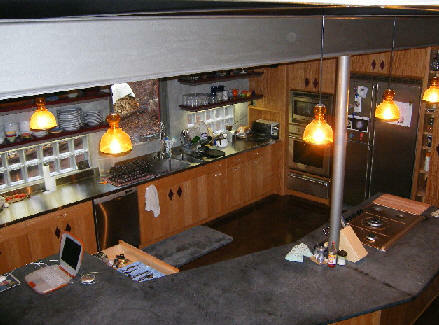 Kitchen renovations by Becky Shankle/Ecomodernism, bottom photo. Sold in 2015 to Eric Blair and Isabel Llorente as the Blair Llorente Trust. Sold in 2018 to Robertus Van Kempen and Maria Van Tilburg. 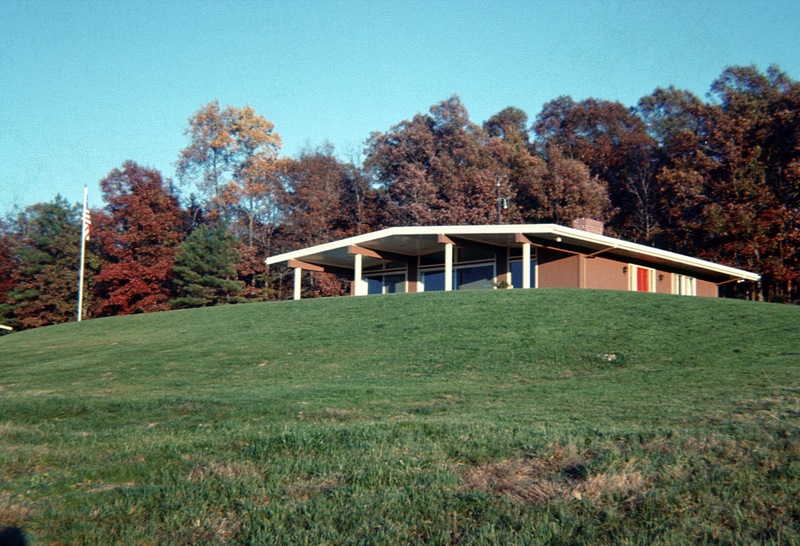 1966 - The John W. Scott Jr. House, 2308 Honeysuckle Road, Chapel Hill. 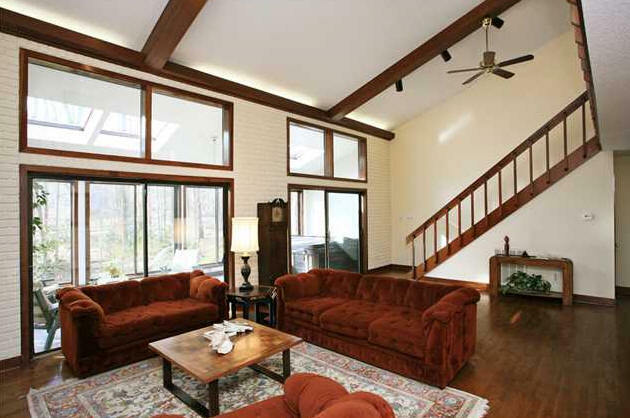 Sold in 1998 to Kimberly N. and Brian E. Nicoll. Sold in 2016 to Stephanie L. and Stephen R. Nally. 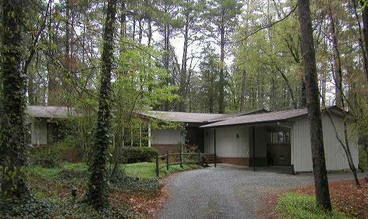 1967 - The Robert M. Stephenson Jr. House, 1726 Allard Road, Chapel Hill. Architect unknown. Built by J. P. Goforth. Sold to the Prazmas. Sold to the Maultsbys. Sold to the Wilsons. Sold to Carlos and Christina Santi. 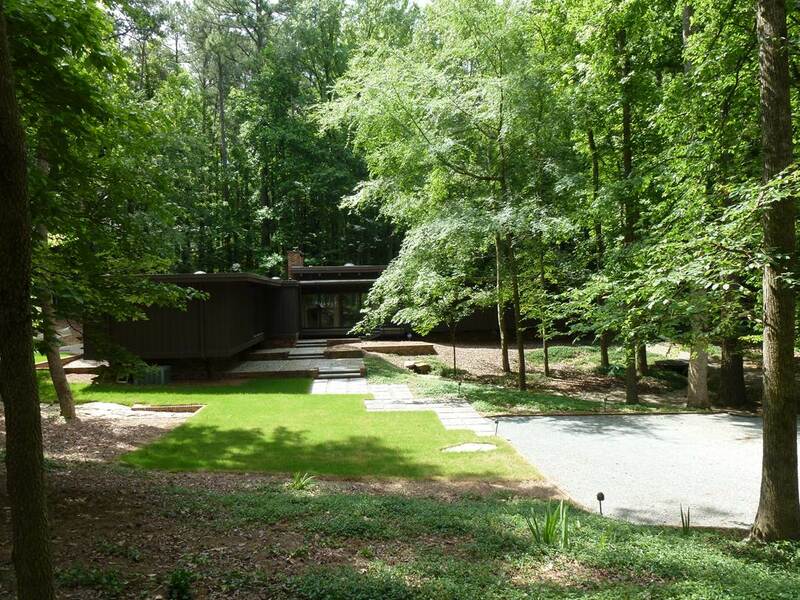 1967 - The Clifton P. and Clara Jones House, 550 Piney Mountain Road, Chapel Hill. Architect unknown. Sold in 1980 to Jack E. and Nora K. Reed. Sold in 1987 to David and Terry Snyder. Sold in 1989 to Gary J. and Elizabeth Pielak. 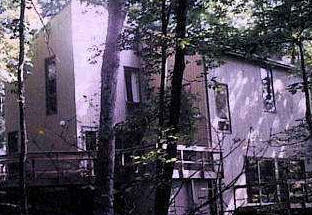 Sold in 1993 to Bryan and Lilith Shane. Sold in 1998 to Santos and Mary Alverez. 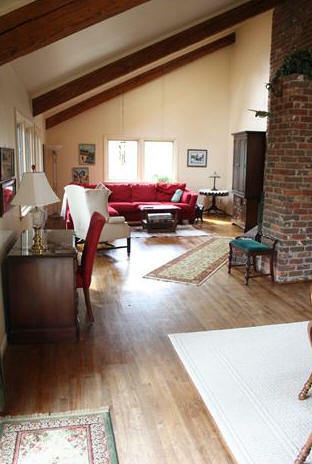 Sold in 2007 to Anne S. Lawrence and Sheridan Bell. Sold in 2008 to Jeffrey Dewitte. 1967 - 1709 Curtis Road, Chapel Hill. Architect unknown. Built by J. P. Goforth. Photo by Heather Wagner. 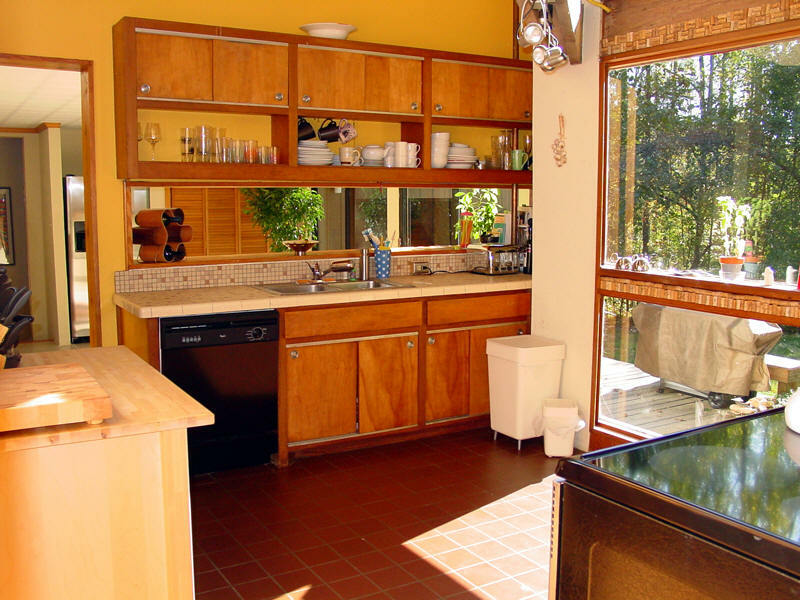 Sold in 1971 to Joseph Rowand. 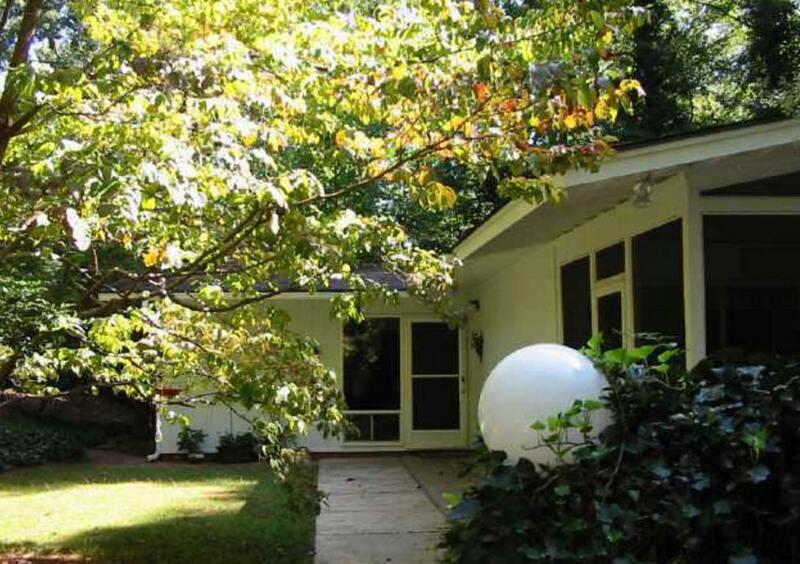 Sold in 1986 to Clifford A. Parrish Jr. Sold in 2010 to George Douglas Wicker. Sold in 2012 to Elin O'Hara Slavick and David B. Richardson. 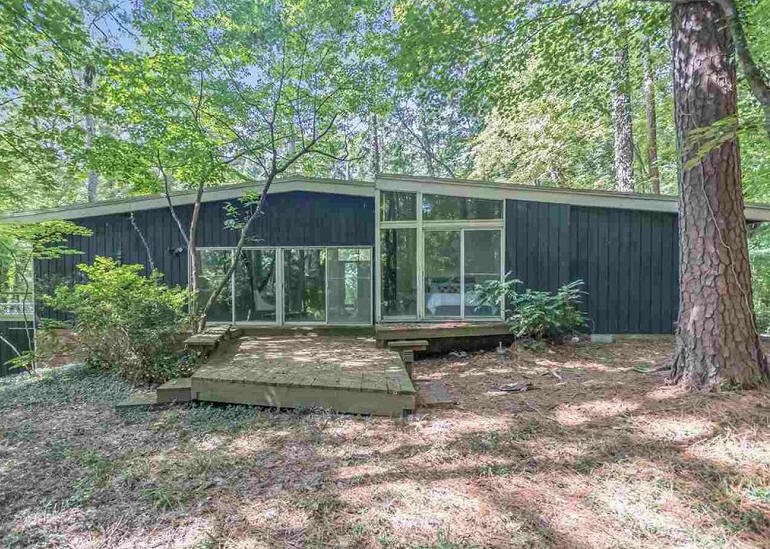 1967 - 404 Morgan Creek Road, Chapel Hill, NC. Designed by Richard B. Pollman of Home Planners Inc, a plan book publisher. This is model N1126 without the garage. Sold in 2016 to Atarazia LLC. 1968 - The Frances Brantly Goodwin House, 406 Lyons Road, Chapel Hill. 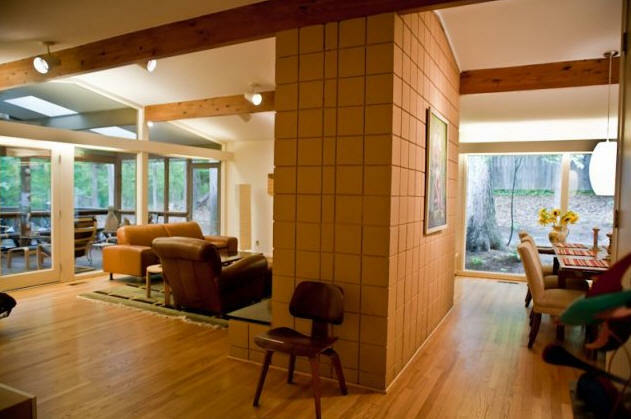 Goodwin moved to NC from Santa Fe NM where she lived in a house designed by Frank Welch, noted Texas Modernist architect. Taking ideas from that house, she created this house with additional ideas from a plan book. 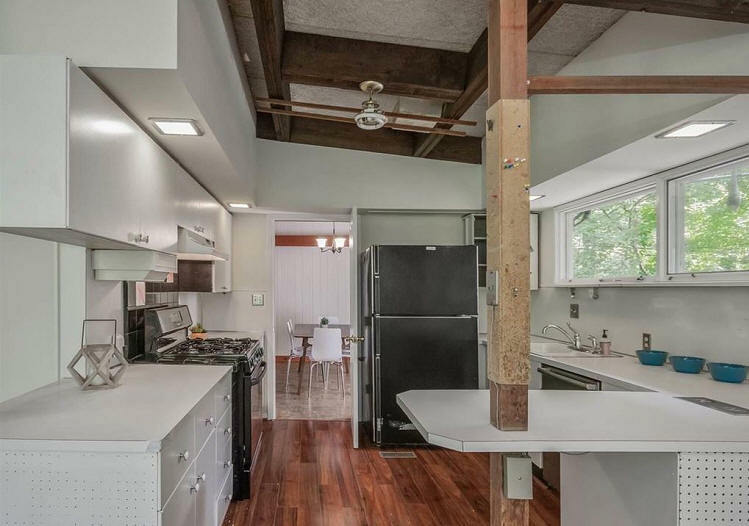 Originally 1900 square feet. 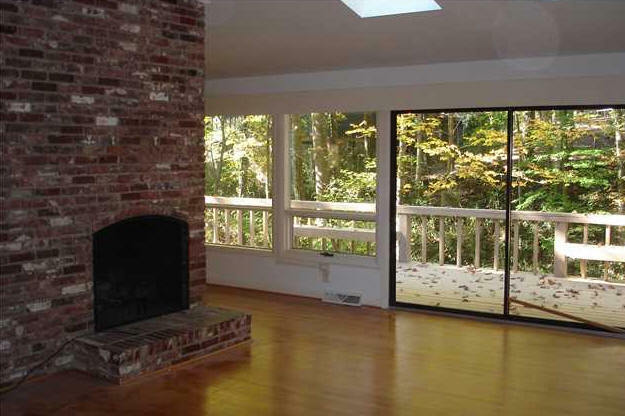 Carolina Builders Corporation provided and installed the original Pella windows. 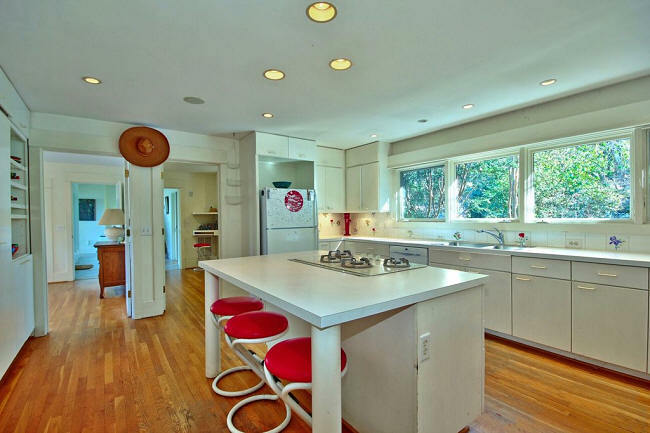 Sold in 1972 to Lorin and Sue Campbell. In 1976, the Campbells divorced and house went to Sue Campbell. Sold to Janet Kagan who still owned it as of 2012. 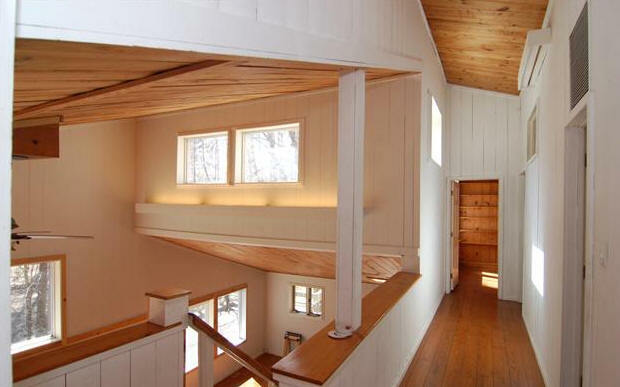 Ellen Weinstein designed an addition, bottom photo. 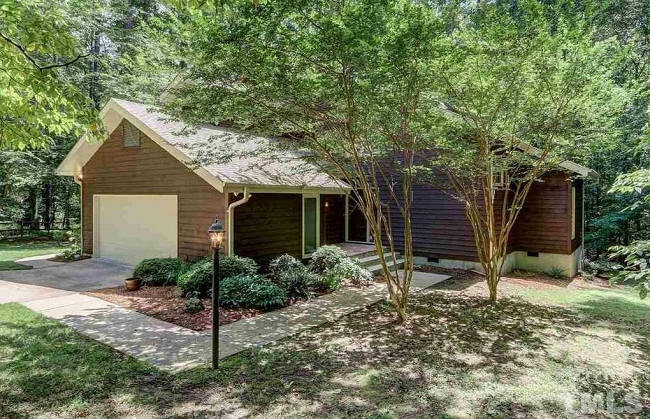 1968 - The Heidi G. Chapman House, 7 Bartram Drive, Chapel Hill. Built by J. P. Goforth. Architect unknown. Sold in 2012 to Renee A. and Peter Bosman. 1968 - 1431 Poinsett Drive, Chapel Hill. Architect unknown. Sold to Cornelia Maurer. Photo by Duffy Healey. 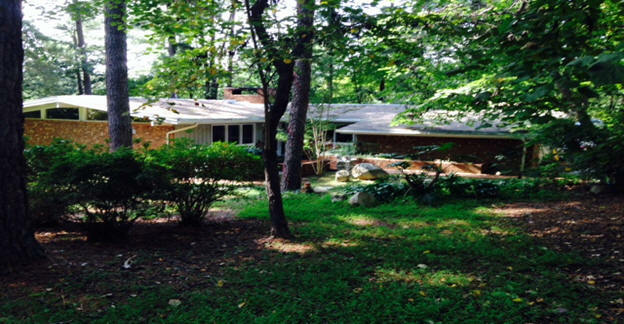 1968 - The Victor P. and Doris Bowles House, 1712 Michaux Road, Chapel Hill. Custom design and build by C. S. Whitt. Sold to Jim Pearce in 1999. Photo by Jim Pearce. 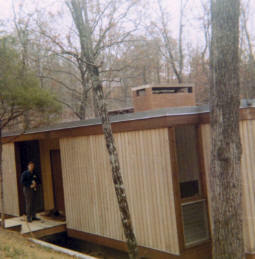 1968 - The Caroline B. and Wilmer St. Clair Cody House, 421 Ridgecrest, Chapel Hill. 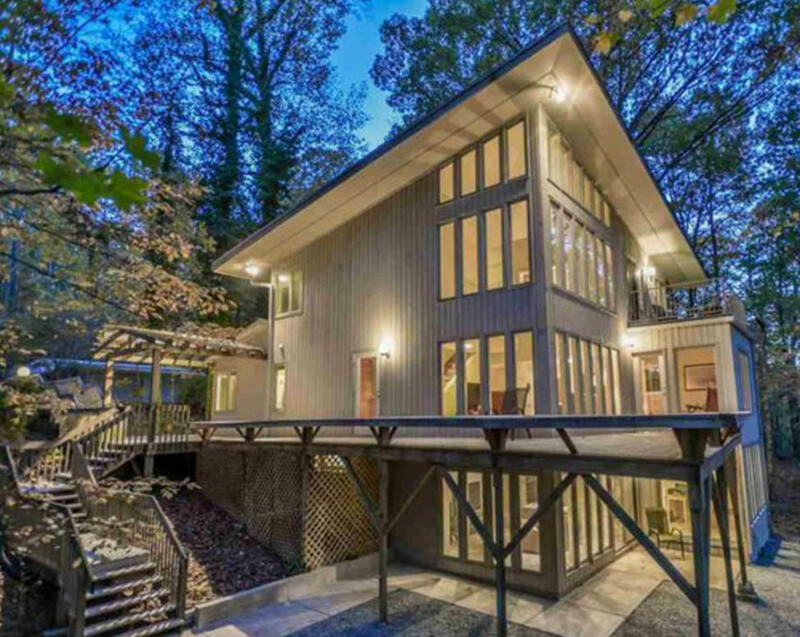 Told the lot was "unbuildable" the couple was inspired by a house designed by Baltimore architect Charles H. Richter, magazine article photo above. E. J. 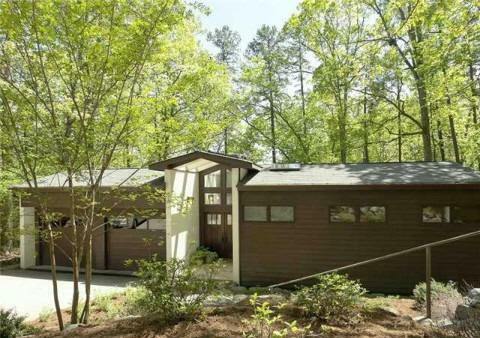 (Peg) Owens, a developer in Chapel Hill, had one of his draftsman interpret the plans. Ed Mann built the house. 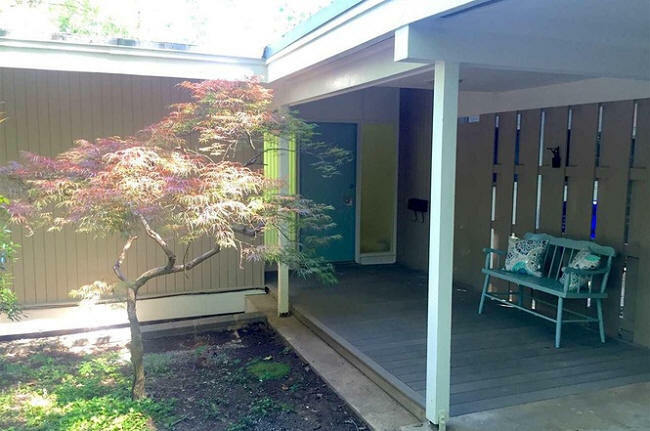 Over the years, other owners gabled the flat roof, eliminated windows, put an addition on the right side, and essentially eradicated the Modernist design, bottom photo. 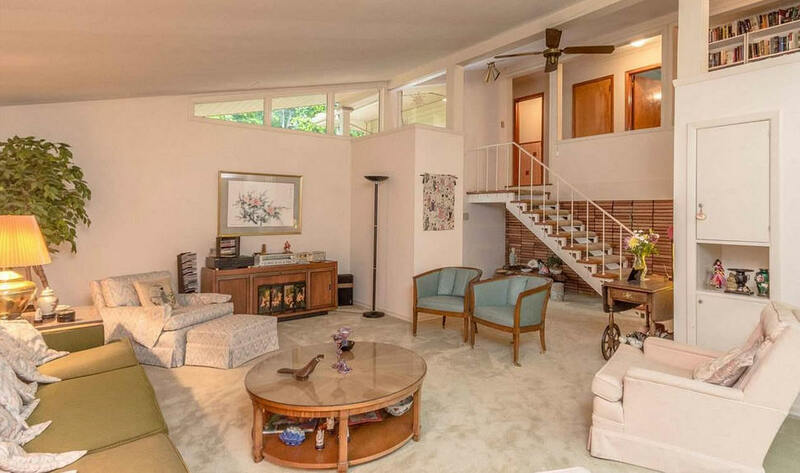 Sold in 1972 to Jim and Diane Lea. Sold in 1979 to Aaron and Ethel Gold. Sold in 1980 to Avram and Karen Gold. Sold in 1983 to Konrad and Hannelore Jarausch. 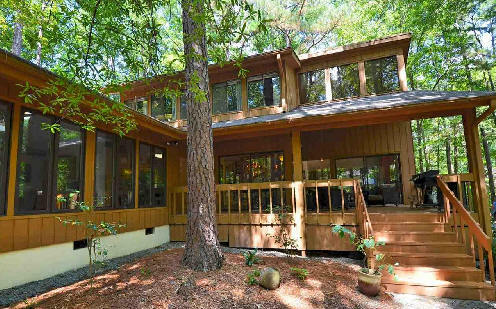 1968 - 2131 North Lakeshore Drive, Chapel Hill. Architect unknown. Sold in 2017 to Lily Farel and Spence Hanemann. 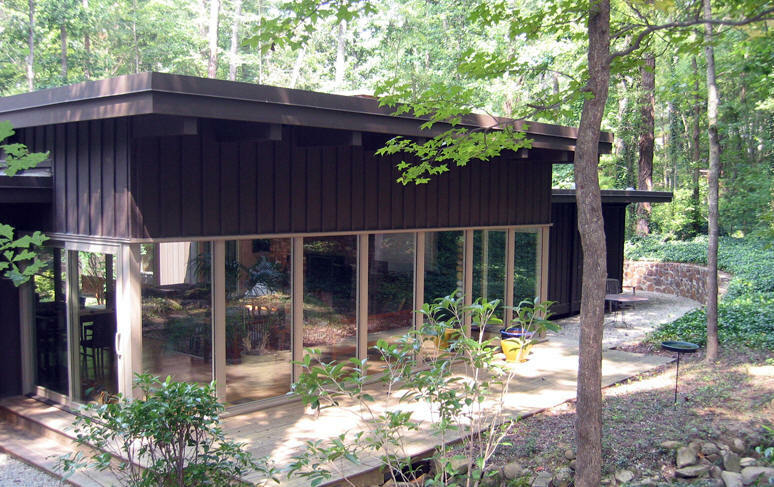 1969 - The Ladnor and Shirley Geissinger House, 1105 Old Lystra Road, Chapel Hill. Built by JP Goforth. 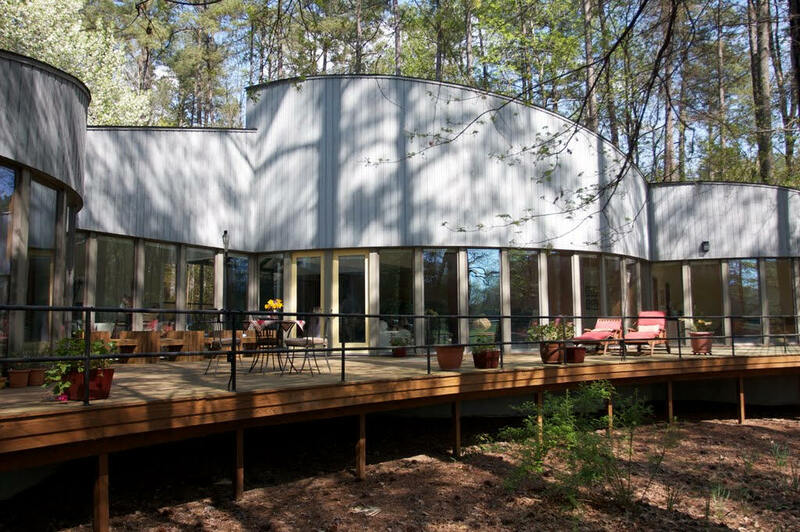 Designed by the Geissingers and a draftsman named Bisbing in Chapel Hill. 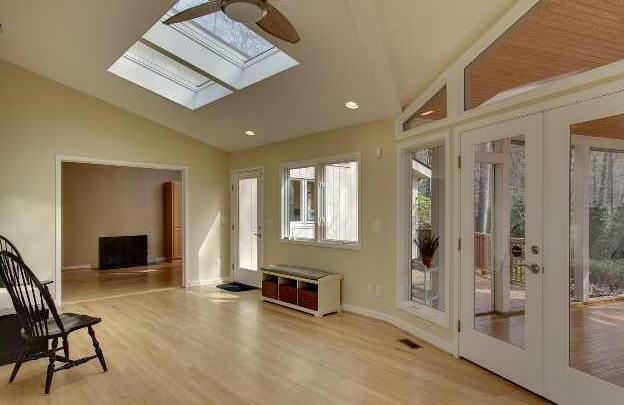 Sunroom added in 1994 and below it a storage area, walk in closet and bathroom designed by Steven Gaddis. Still owned by the Geissingers as of 2018. 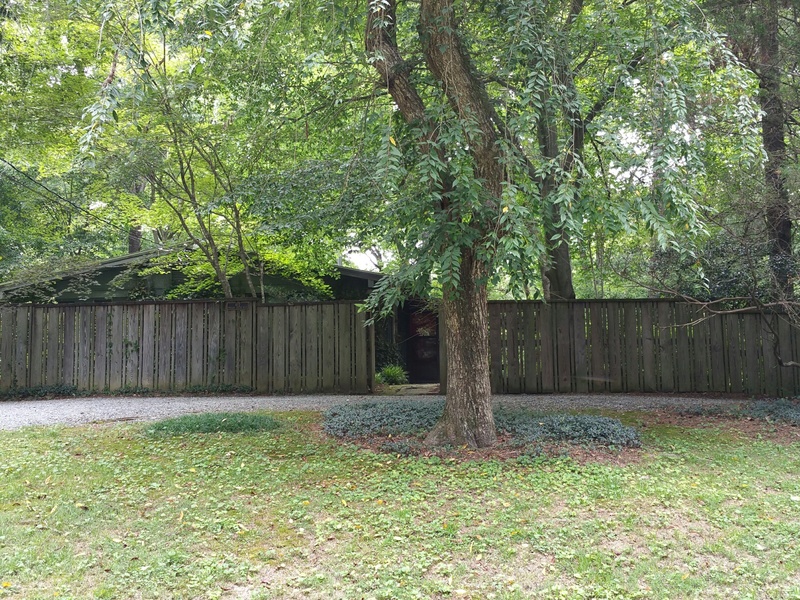 1969 - The Robert Byrd House, 404 North Elliott Road, Chapel Hill. Built from mail order plans by J. P. Goforth. Sold to Patricia Bryan. Sold to Stephen Huddart. Sold to Lisa Tust. For rent in 2014. Color photo by Lucy Pittman. 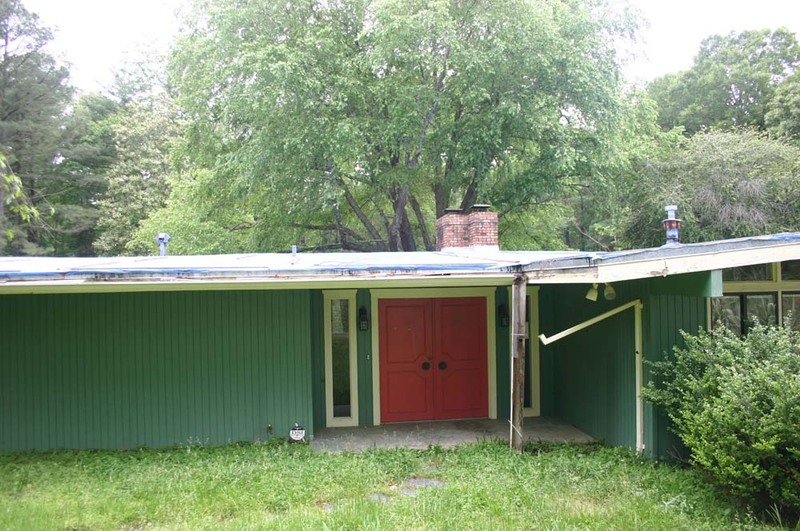 1969 - The Ellen A. and John H. Hoggard House, 1709 Audubon Road, Chapel Hill. Architect unknown. 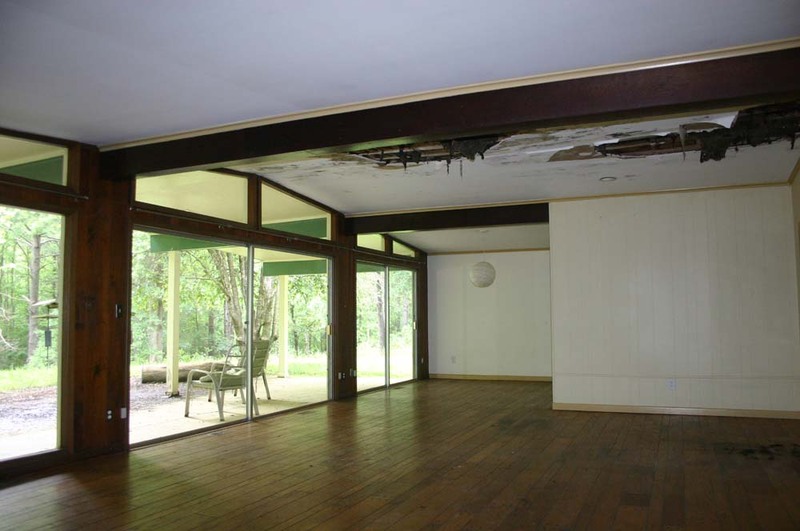 Sold in 1972 to Bess P. and George B. Autry. Sold in 2001 to Carol A. and David M. Price. Sold in 2017 to Janice Wang and Herman Pontzer. 1969 - 629 Sugarberry Road, Chapel Hill. Architect unknown. Built by JP Goforth, according to 628 Kensington owner Radu Rosu. Sold to Bruce and Betty Crumpton. Sold in 2010 to Gary T. Henry and Pamela Sack. 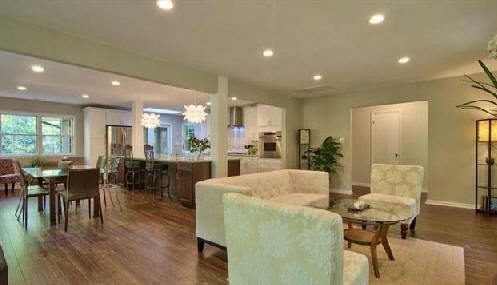 Sold in 2013 to Daniel and Linda Janssen. 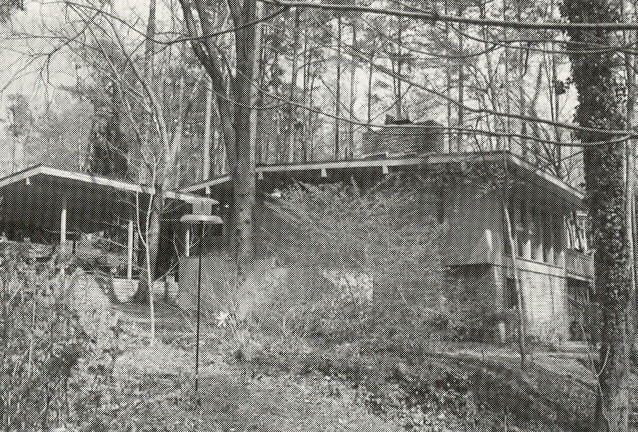 1969 - The Paul and Sylvia Hubbard House, 1710 Audubon Road, Chapel Hill. 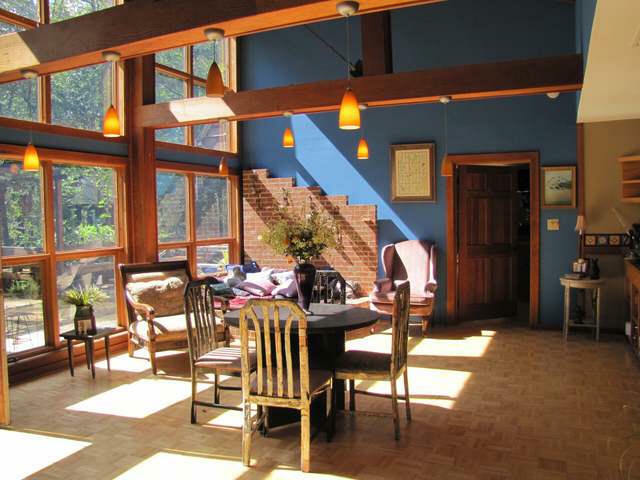 Based on a design by L. M. Brunier & Associates of Portland OR with extensive modifications by the Hubbards. Built by J. P. Goforth. Photos by Jill Ridky-Blackburn and Jim Pearce. Sold in 2014 to Katherine L. Mottola and Robert S. Taylor. 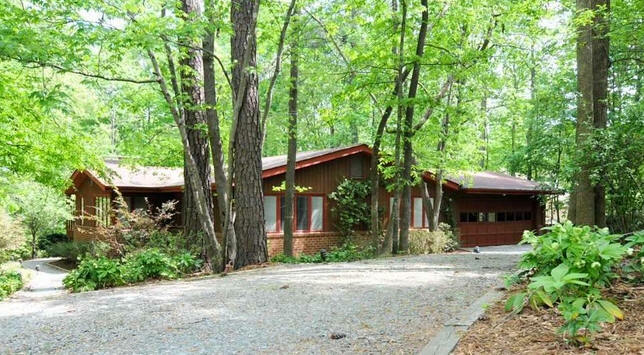 1969 - The Beryl C. and Robert J. M. Horton House, 601 Lakeshore Lane, Chapel Hill. Built from mail order plans. 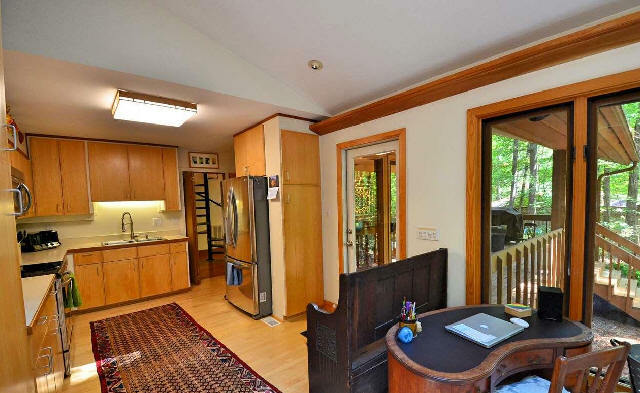 Later, the kitchen was expanded towards the street along with adding a screen porch. 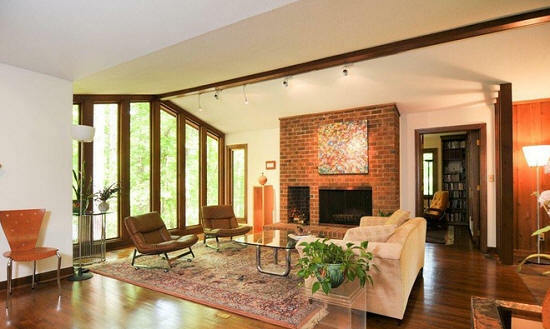 Sold in 1989 to Kenneth G. Jens and Betty Nye Gordon. 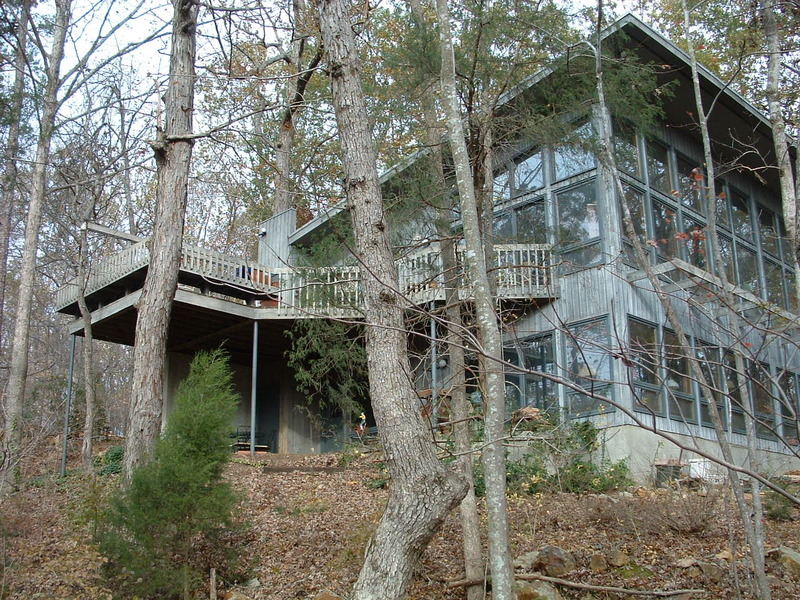 Sold in 1998 to Donald R. & Susan W. Brewer. Sold in 2013 to Maureen H. and John G. Ward. Sold in 2016 to Emily C. and Stephen D. Moorefield. 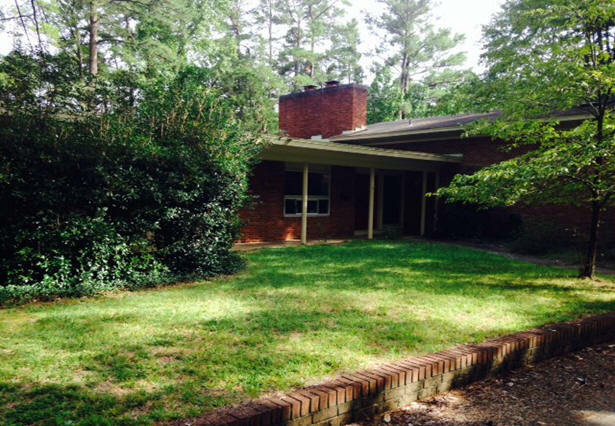 1969 - The Raymond P. and Betty P. White, Jr. House, 1506 Velma, Chapel Hill. Architect unknown. Built by J. P. Goforth. Sold in 2011 to Bernard D. Rhein Family Trust. Sold later in 2011 to Barbara and Eugene McDonald. Renovated in 2013 by Bill Waddell, built by Leon Meyers. 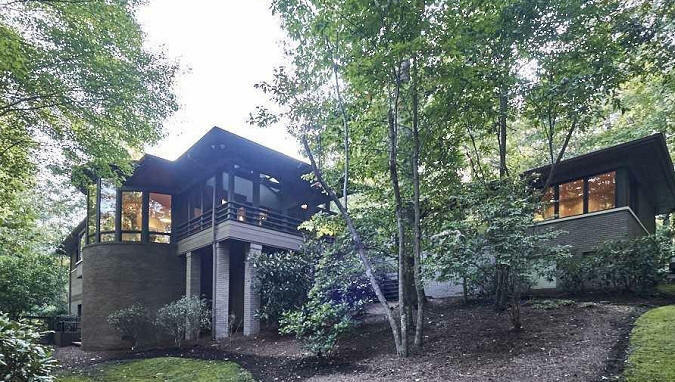 1969 - The Maurice and Joan Bursey House, 837 Shady Lawn Road, Chapel Hill. Built by J. P. Goforth. Johnny Morris was associated with the project. Sold to Eric Munsat. 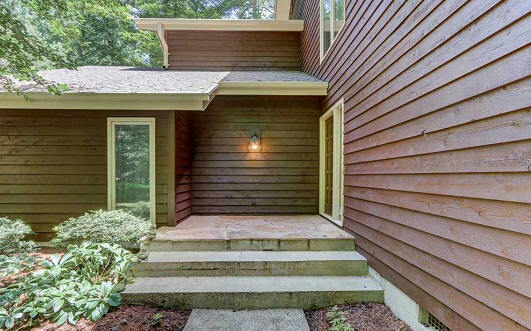 Identical to 1400 Ravenhurst in Raleigh. 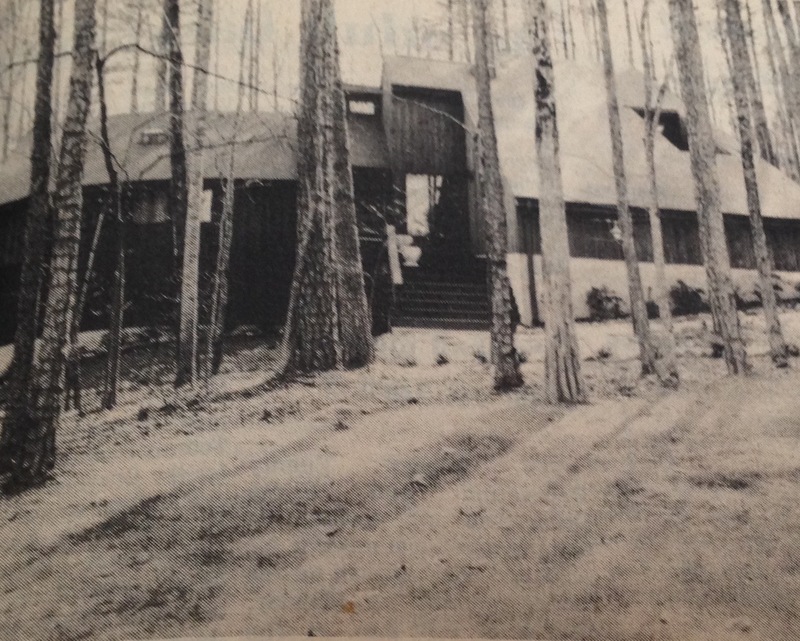 Around 1969 - The Hopper House, 1708 Michaux Road, Chapel Hill. Architect and builder unknown. Sold to George D. Hughes and Elizabeth Hughes. Sold to Elizabeth Hughes. Sold in 2008 to Harry and Karin Waelti Cross. Sold in 2009 to Karin Waelti. Sold in 2010 to Vincent A. Brown and Ajantha Subramanian. Sold in 2012 to James Sinnott and Ranya Hahn. 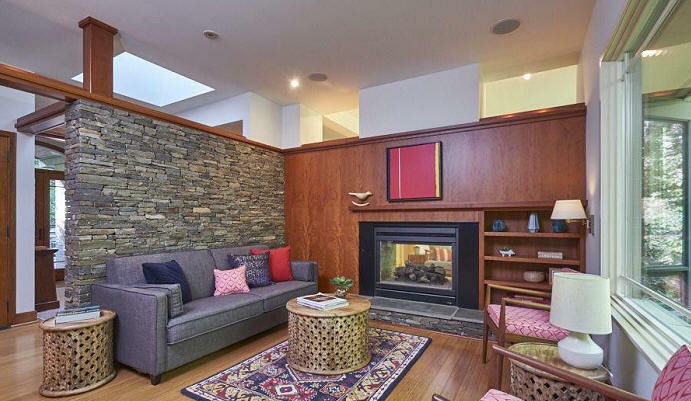 Unique to this home is its construction around a centerpiece fireplace. Photo by Ranya Hahn. 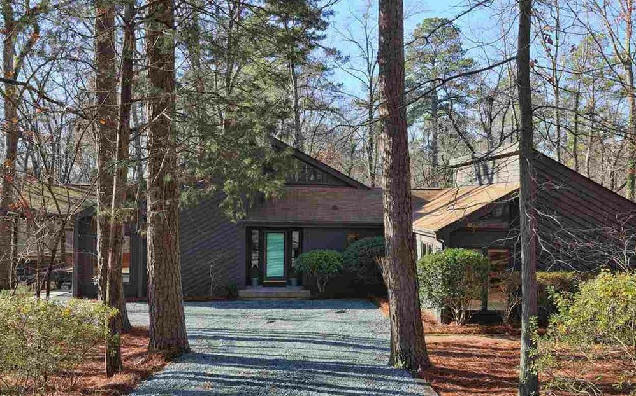 1970 - 406 Lakeshore Lane, Chapel Hill. 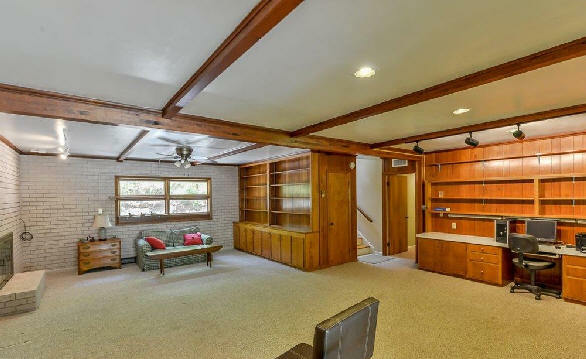 Sold in 1970 to Mary W.D. and Rollie Tillman Jr. Sold in 1996 to Dianne H.and Frank H. Christensen. Deeded 2011 to Frank H. Christensen. For sale in 2016. 1970 - 1707 Curtis Road, Chapel Hill. Architect unknown. Abandoned and foreclosed. For sale in 2017. 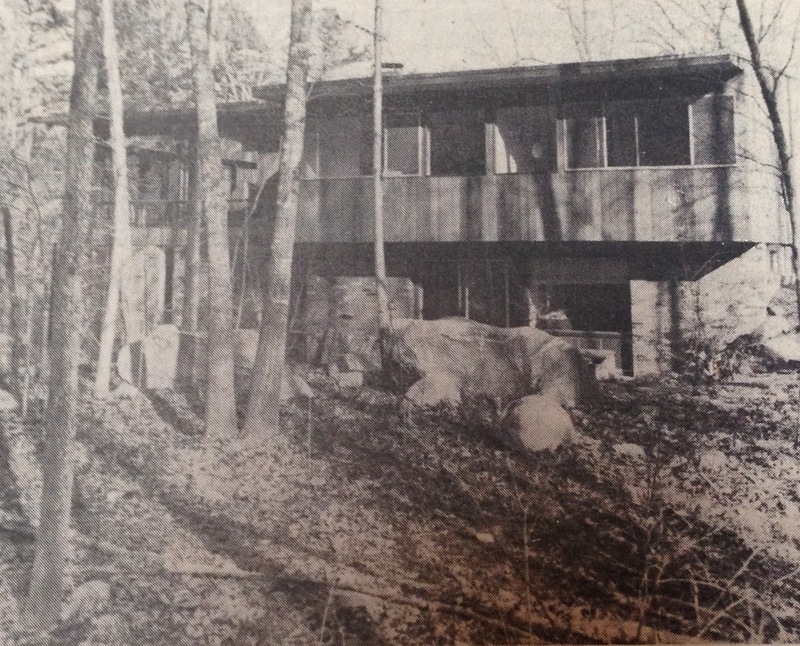 1970 - The Charles Herbert (Herb) and Elizabeth (Betty) W. Ellis House, 411 Lakeshore Lane, Chapel Hill. Designed by Herb Ellis, a senior engineer at IBM. 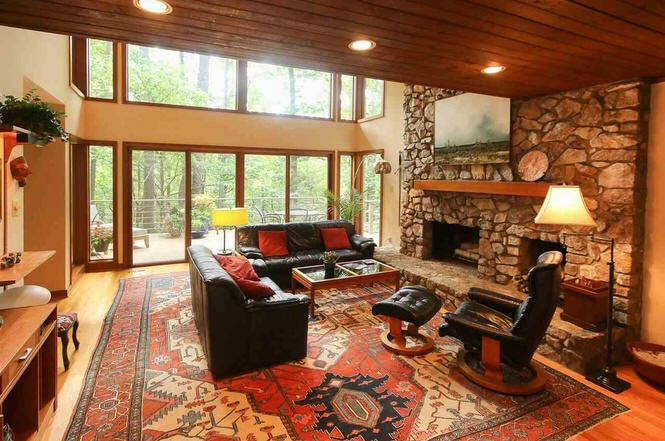 Sold in 1983 to Eliot Roy Weintraub and Margaret Edwards Weintraub. According to Roy Weintraub, "Herb seemed to have been in charge of design; indeed, he made the building his work. He was one of those engineers who are always in error but never in doubt. I know for instance that he purchased the bricks from a destroyed warehouse in Greensboro and the wood from a farmhouse that was being torn down. It took him a few years to accumulate that kind of stuff. It was designed around the swimming pool since Betty had a degenerating spine and spent her time lying down. But the house was a wonder. 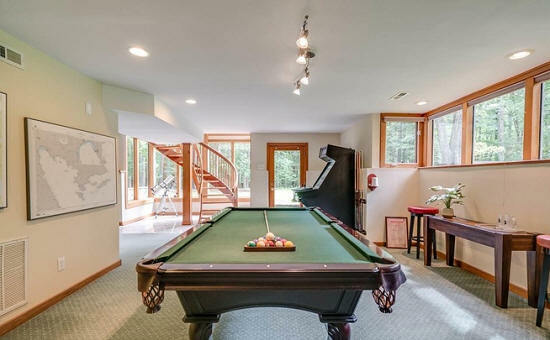 From the Rube Goldberg plumbing system, which no plumber could fix, to the structural defects of a flat roof, to the absence of an entrance to the house except through the carport and swimming pool, to the crazy-making kitchen which was divided into essentially two rooms, to the fact that every bathroom had a door exit to the pool. 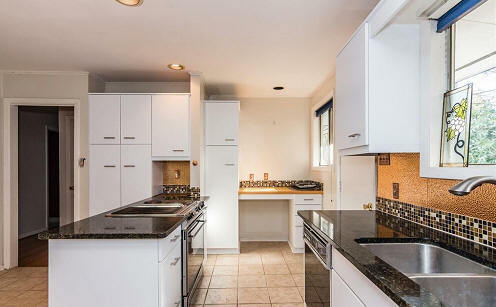 The kitchen has since been remodeled. Sold in 1989 to Anthony B. and Marsha S. O'Hare. 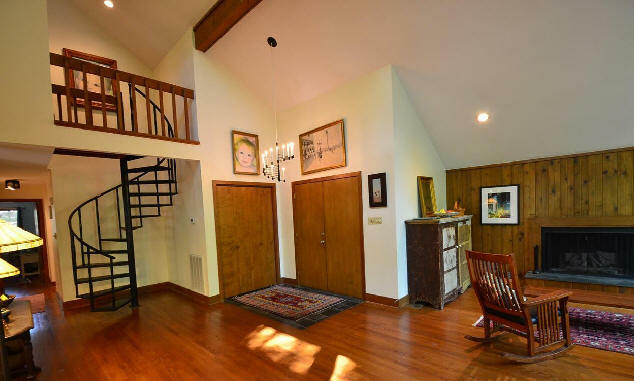 Sold in 1997 to Katherine Coleman Ballew and J. Hunter Ballew. 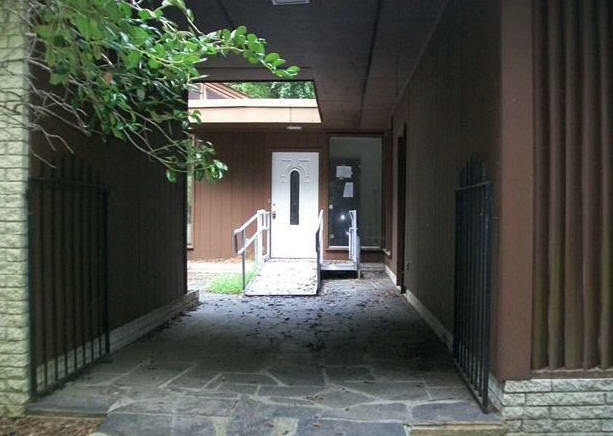 Sold in 2006 to Emily Moseley and Robert J. Esther. 1970 - 810 Kenmore Road, Chapel Hill. Architect unknown. Sold in 2005. Sold in 2016 to Daniel Yeam and Mytrang Nguyen. 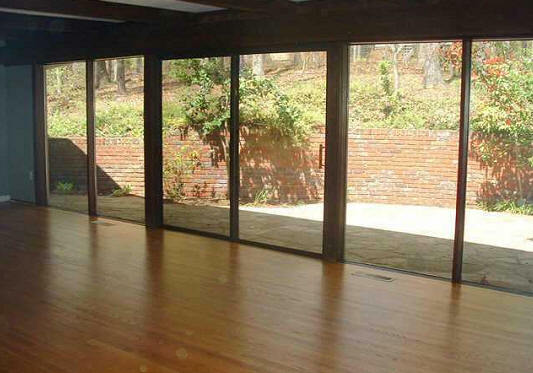 1970 - The Walter and Gretchen E. Locher House, 1713 Audubon Road, Chapel Hill. 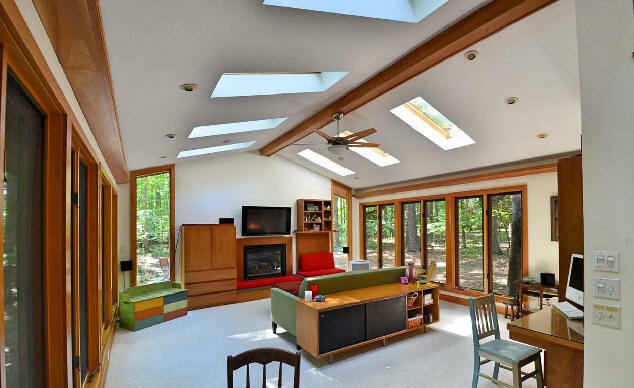 Designed by Richard B. Pollman of Home Planners Inc, a plan book publisher. 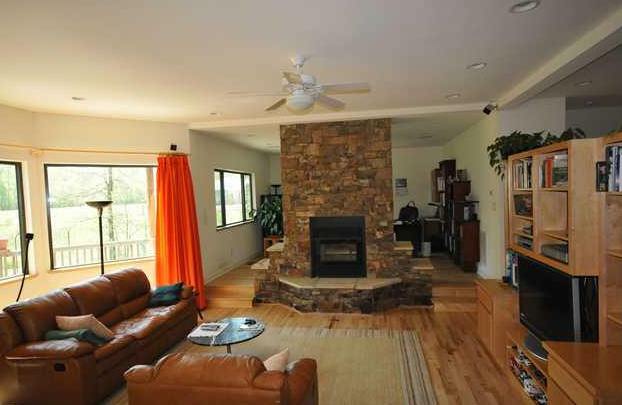 This is model N1126 without the centrally located fireplace. Built by J. P. Goforth. 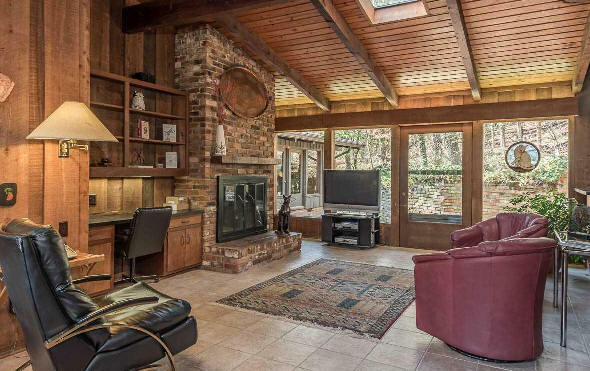 Sold in 1983 to Michael J. Rosenberg and Ellen Ruina. 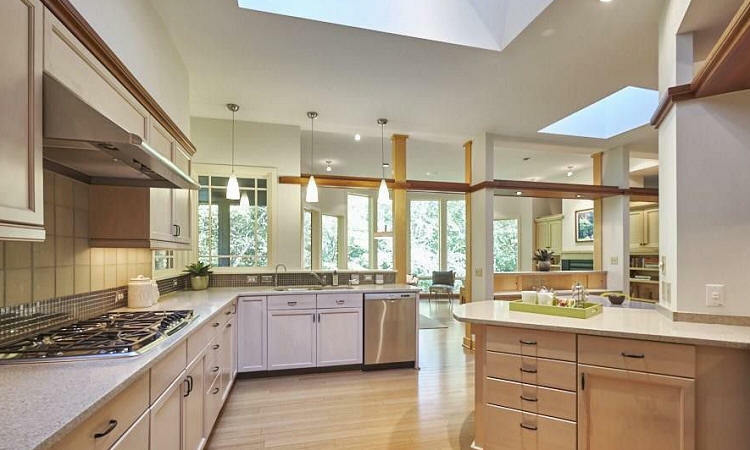 Sold in 2001 to James and Joan Seifert Rose who still owned it as of 2012. Photo by Heather Wagner. 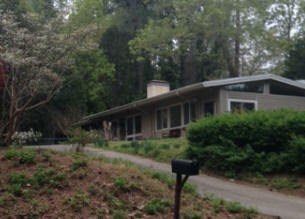 1970 - The Lester and Betty Ball House, 1707 Audubon Road, Chapel Hill. Probably built by J. P. Goforth. 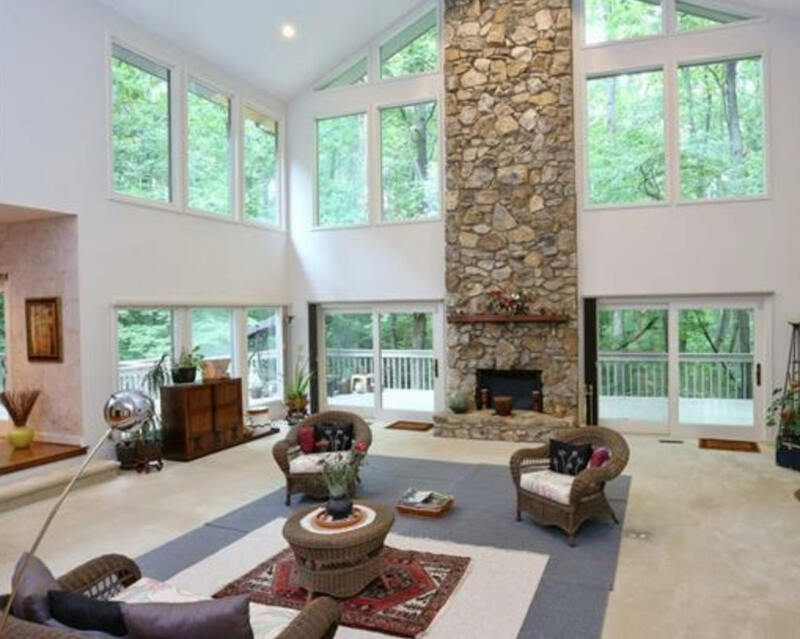 Designed by architect Thomas O’Shea of Raleigh in 1968. The Balls divorced; Betty Ball stayed in the house and later married Richard Cocke. Sold to Bill and Terry Delanty. 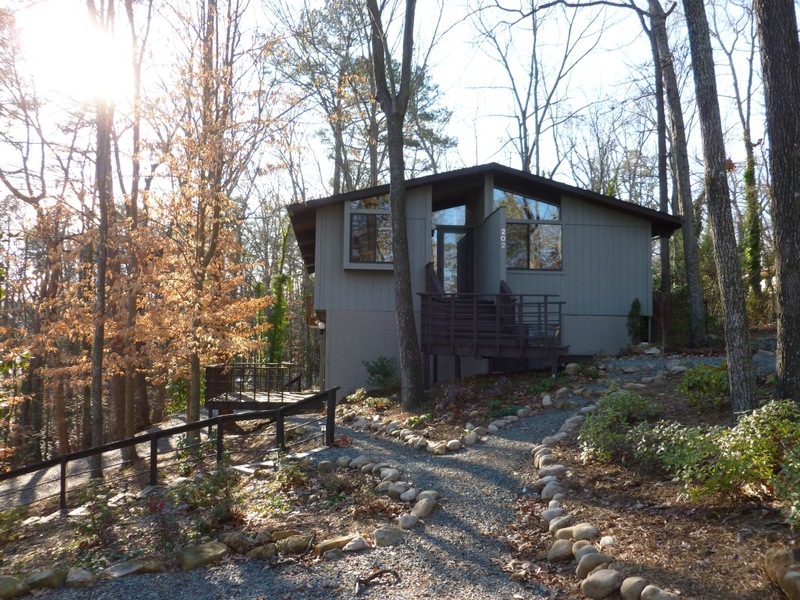 Sold to Michael Johnson and Nancy Esterbrooks. 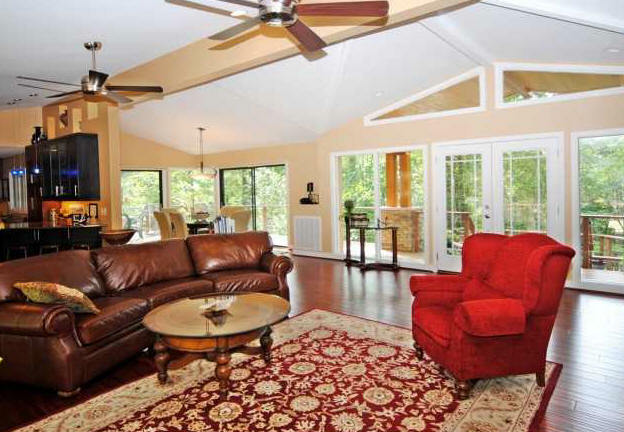 Sold to Gail Gillespie and Dwight Rogers. Photo by Chase Hanes. 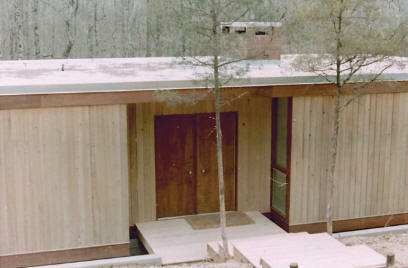 1970 - The Kenneth F. Bott Jr. House, 624 Sugarberry Road, Chapel Hill. Designed and built by Bruce Crumpton of Spence Lester and Crumpton. Sold in 2013 to Judson Bowman. 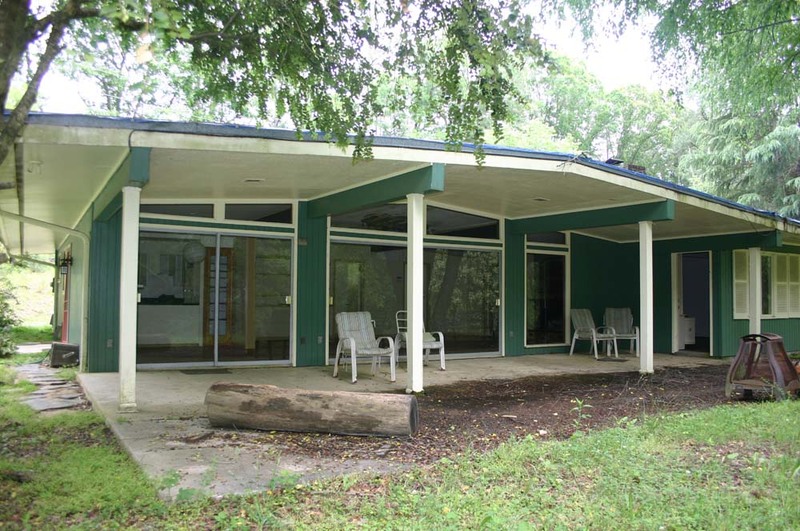 1970 - The Edward Johnson House, 6000 Buckhorn Road, Hillsborough. Designed and built by Bomar Construction. 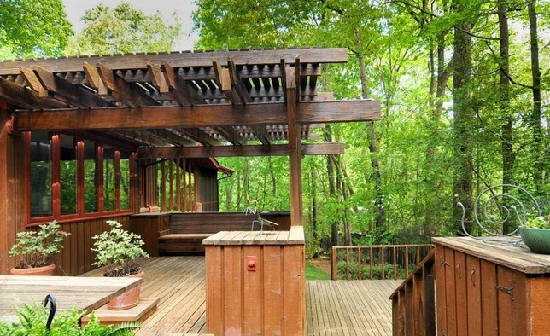 Similar to a Deck House. As of 2013 still owned by Edward Johnson. 1970 - 1419 Gray Bluff Trail, Chapel Hill. Architect unknown. Sold to Robert D. Vance. Photo by Duffy Healey. 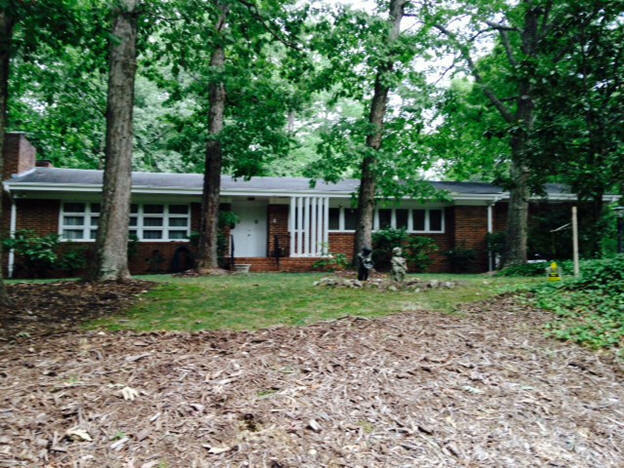 1970 - 603 Rock Creek Road, Chapel Hill. Architect unknown. Built by J. P. Goforth. Sold in 2016 to Arun Krishnamurthy and Shivani Bansal. 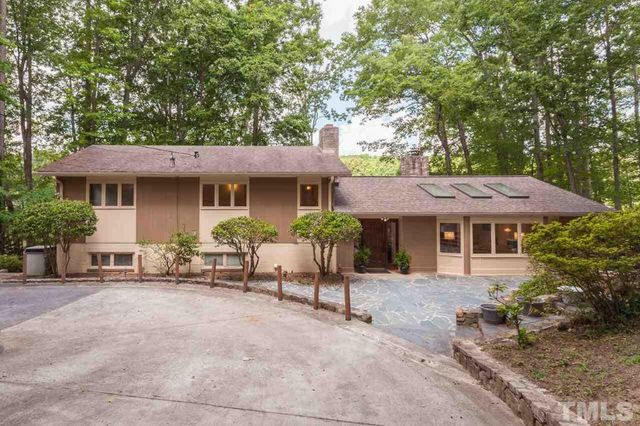 1970 - 674 Brookview Drive, Chapel Hill. Architect unknown. Built by J. P. Goforth. Sold in 1987 to Genevieve W. Cotter and Charles E.Potter. Sold in 2017 to Eunsil Yim and Jaemuygn Kim. 1971 - The Irvine R. Hagadorn House, 405 Lyons Road, Chapel Hill. 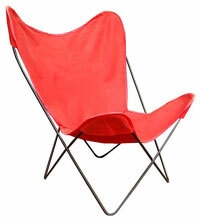 Designed by Richard Pollman and Irving Palmquist. Built by J. P. Goforth. Sold in 1976 to Patrick Dolan. Sold in the late 1980’s to the Blackburn family. An addition in 1990 was done in consultation with Ellen Weinstein. Photo by Jill Blackburn. 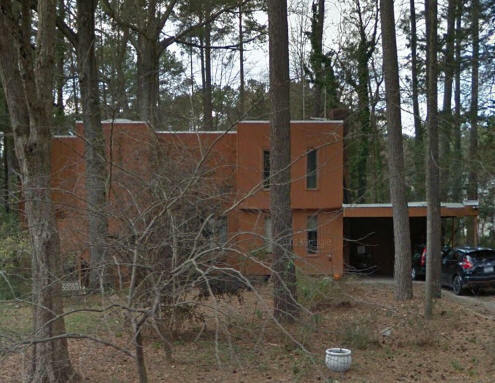 1971 - The Henry and Elizabeth Watkins House, 2520 Falls Drive, Chapel Hill. 1723 sf. Architect unknown. Built by Don Ward. Sold in 2005 to Owen Franklin and Charles Cobine. 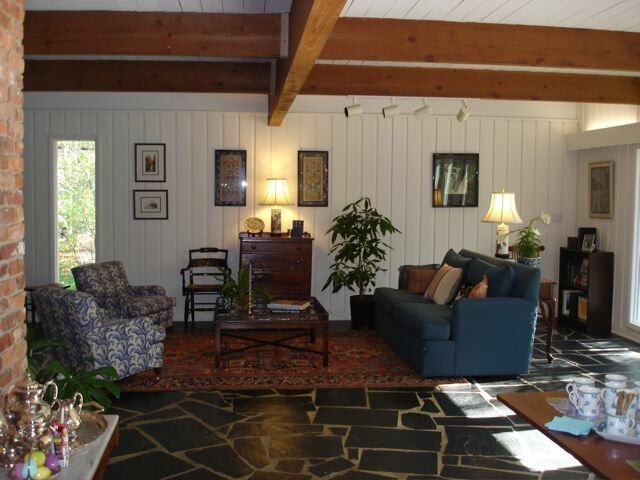 Sold in 2007 to Michael and Laurie Kronenberg. 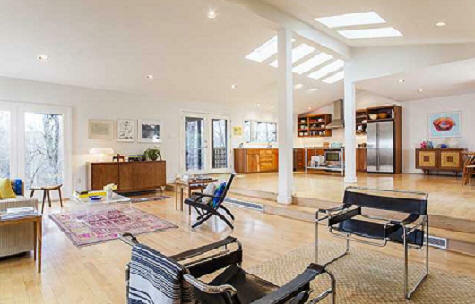 Sold in 2010 to Mark and Constanza Radcliffe. 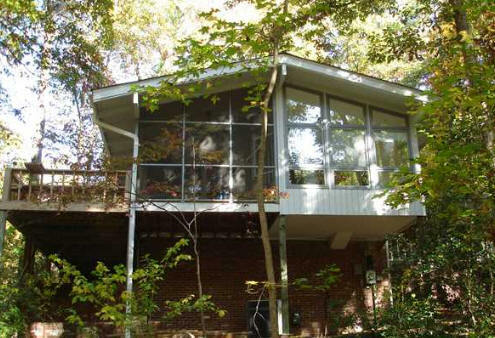 1971 - The George and Ann Lathrop House, 606 Greenwood Road, Chapel Hill. 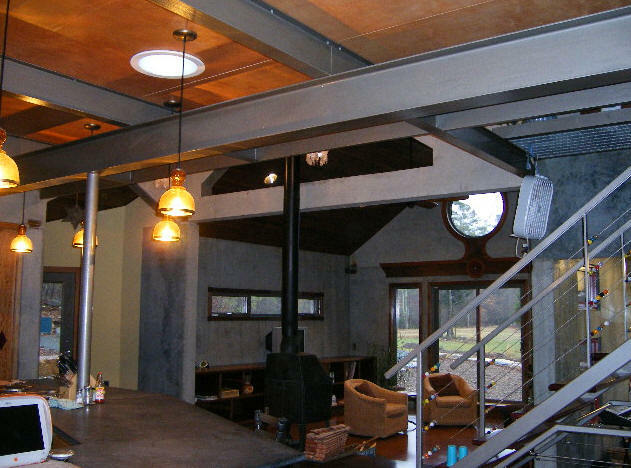 Designed and built by Bomar Construction. This was the first house built by Bomar. 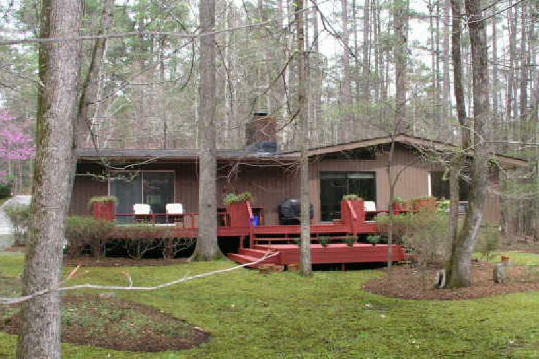 Sold in 1996 to Priscilla L. and John Manley Dennison who still owned it as of 2012. 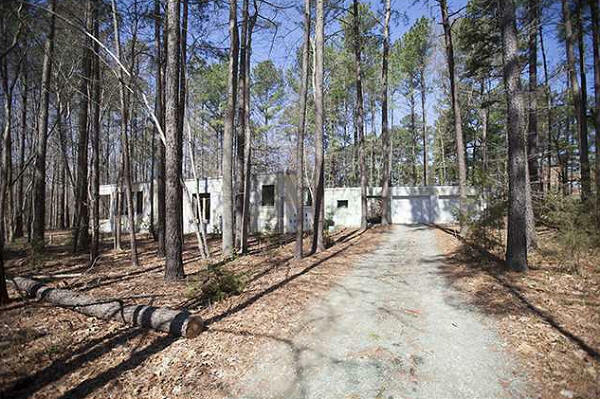 1971 - The Gwen Cooke Loudermilk House, 2 Chatham Lane, Chapel Hill. Architect unknown. Built by J. P. Goforth. 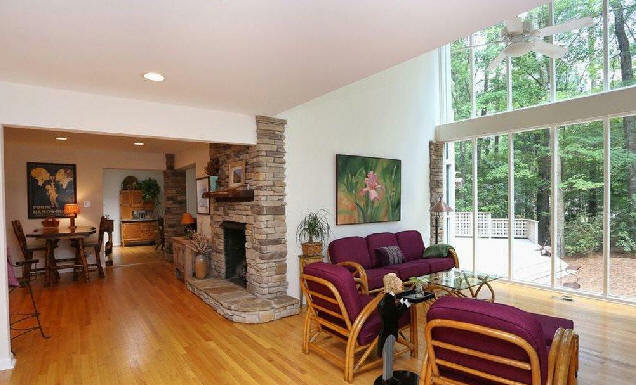 Sold in 1999 to Margaret Creasy Ciardella. 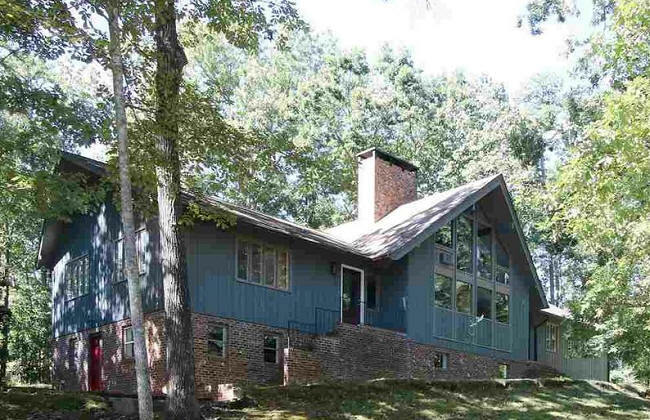 Sold in 2001 to Christie Blackburn and Darlene Nicgorski. Sold in 2013 to Xiaoshu and Yiwen Wang. 1971 - The Glenn D. Corley House, 216 May Court, Chapel Hill. 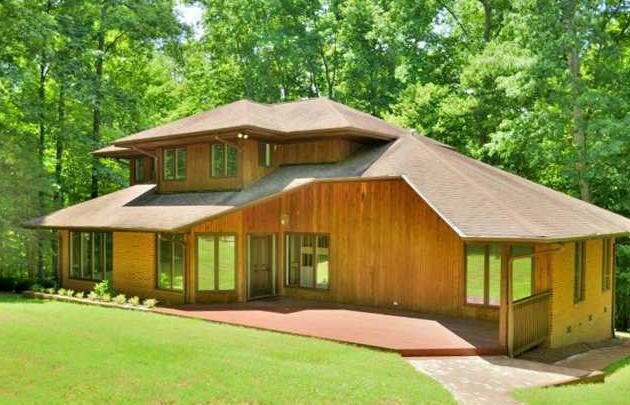 Designed by architect Glenn D. Corley. 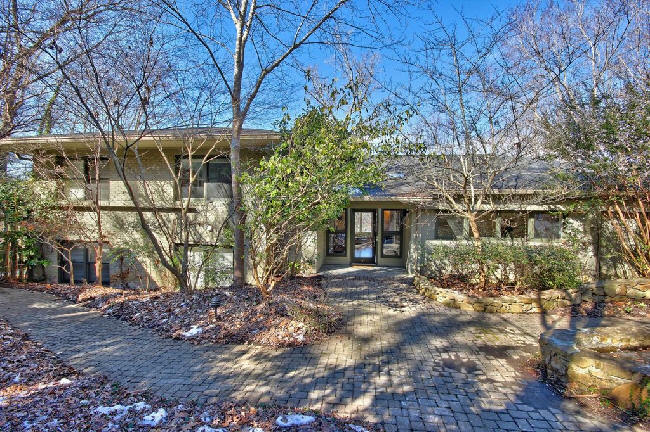 Sold in 1978 to J. William Blue, Jr. Sold in 1985 to Michael J. and Denise M. Larson. 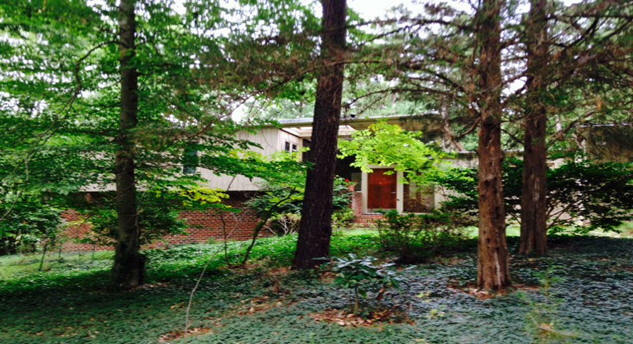 Sold in 1993 to Kenneth J. Horton, Jr. Sold in 2002 to Hannah Jane Shealy. 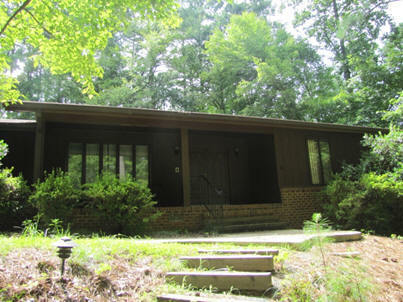 1971 - The Robert B. Cornwell House, 1722 Allard Road, Chapel Hill. Architect and builder unknown. Sold in 1985 to Wesley and Gail Cox. Sold in 1997 to Ronald and Katherine Falk. 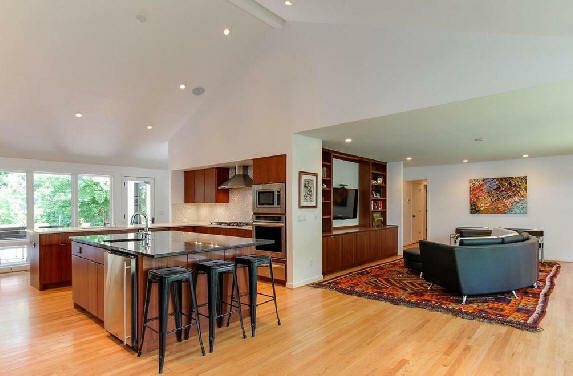 Sold in 2012 to Scott and Candace Kelly. Photo by Carin Walsh. 1971 - 2408 Honeysuckle Road, Chapel Hill. Sold in 2016 to Anna P. Pena. 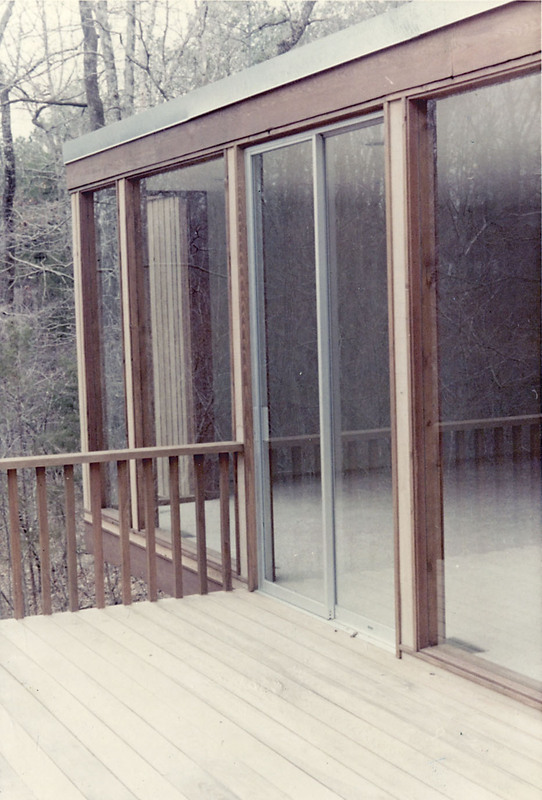 1972 - 309 Shelton Street, Carrboro. Flat roof with cinder block walls. Architect unknown. 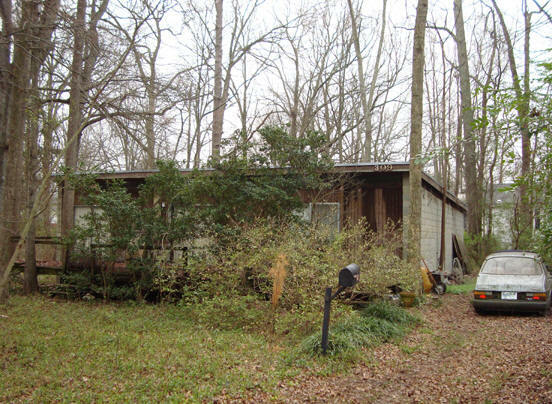 Sold in 1973 to Willaire Inc. Sold in 1988 to Elsie Gooch. Sold in 1994 to Susan Rodemeir who still owned it as of 2012. Photo by Julie Hollenbeck. 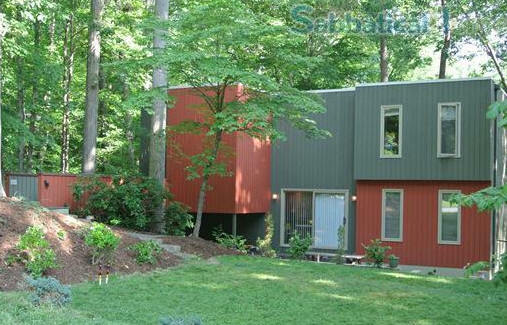 1972 - The Sang and Estu Choi House, 1714 Michaux Road, Chapel Hill. Architect unknown. Built by J. P. Goforth. Photo by Jill Blackburn. 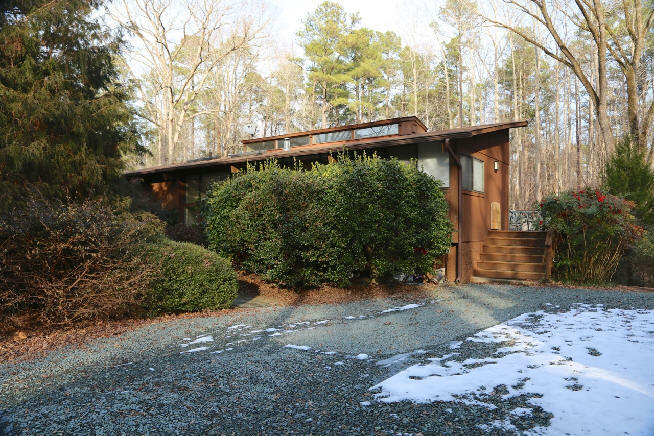 1972 - The Jeanette and David Falk House, 1711 Allard Road, Chapel Hill. Designed and built by J. P. Goforth. 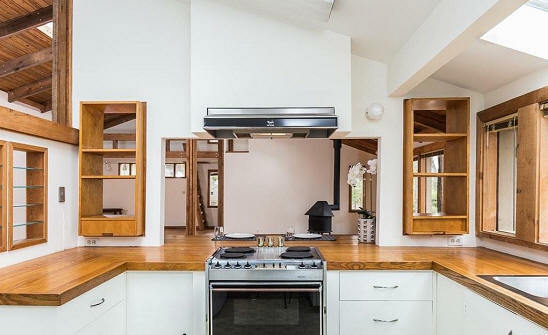 Styled to look like a Deck House. 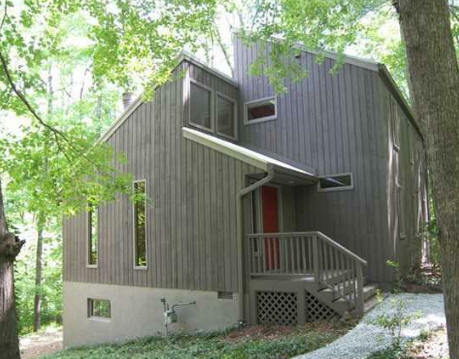 Sold in 2004 to Dan and Becky Broun. Photo by Jill Blackburn. 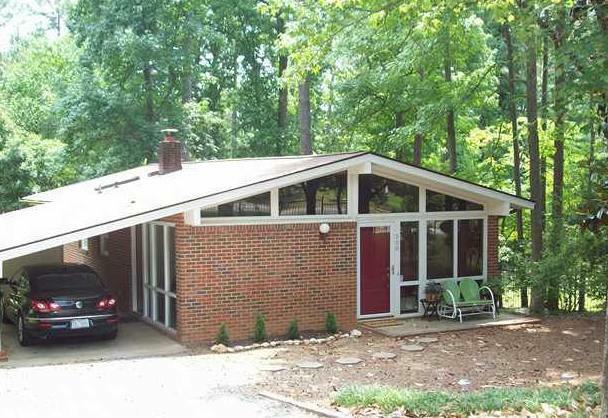 1972 - The Barclay and Elizabeth Martin House, 1439 Poinsetta Drive, Chapel Hill. 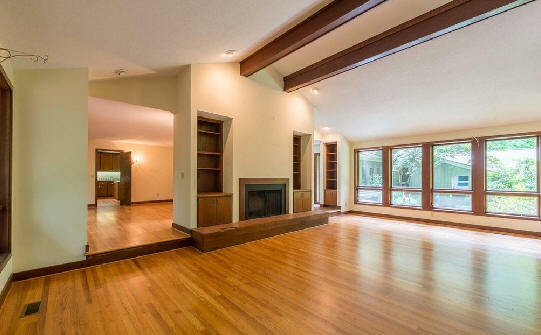 2496 sf. Designed and built by Bomar Construction. As of 2013 owned by Helen and Allan Lehman. Photos by Duffy Healey. 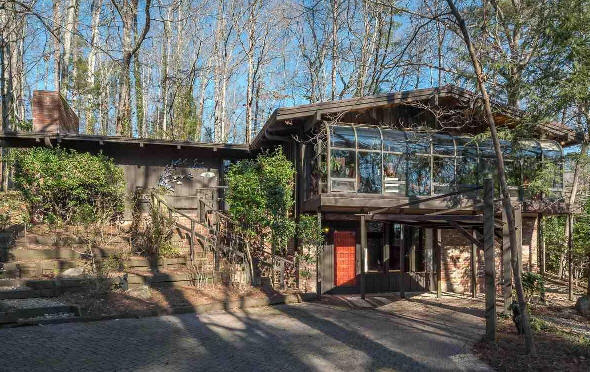 1972 - The Gisela B. and Robert P. Kusy House, 113 Cynthia Drive, Chapel Hill. Transferred in 2008 to Gisela Kusy. Sold in 2014 to Yuechuan Yuan and Wenyuan Xiong. 1972 - 901 Kings Mill Road, Chapel Hill. Architect unknown. Sold to Douglas A. Drossman. Photo by Duffy Healey. 1973 - 2204 Winterberry Drive, Chapel Hill. Architect unknown. 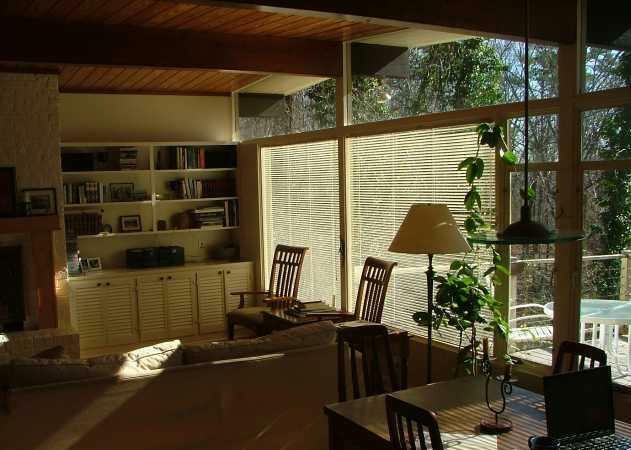 Sold in 1980 to Carl and Elizabeth Strawser. 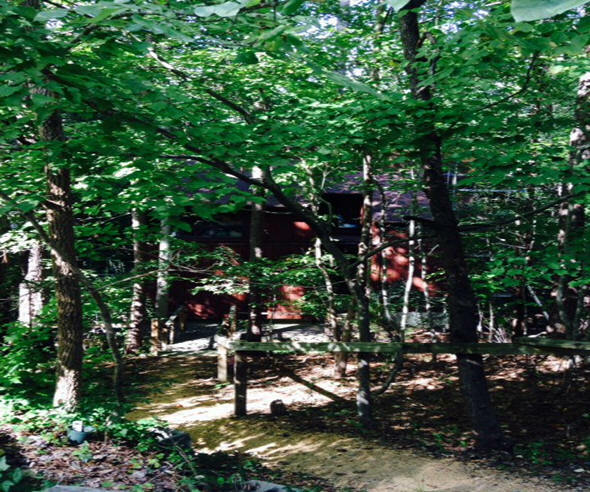 Sold later in 1980 to Joe F. Matthews Jr. Sold in 1982 to Martin and Diane Latta. 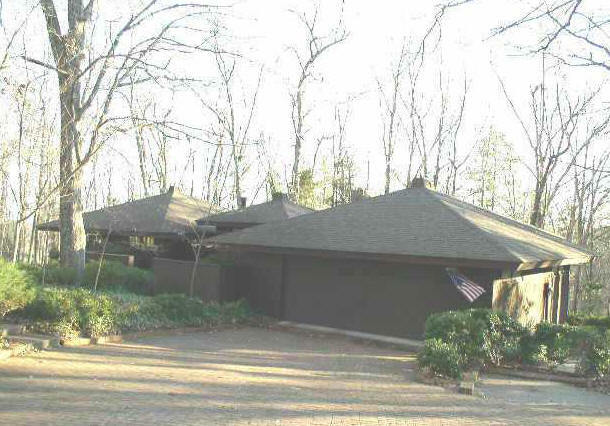 Sold in 1985 to Joe F. Matthews Jr. Sold in 1991 to Joe and Diane Matthews. 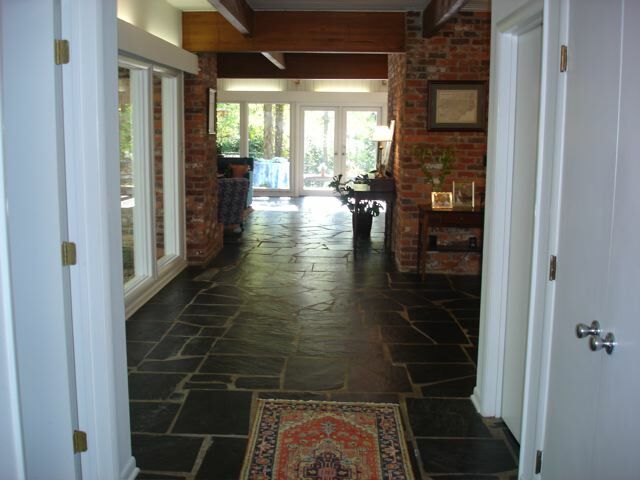 Sold in 2000 to David and Cathy Giffen. 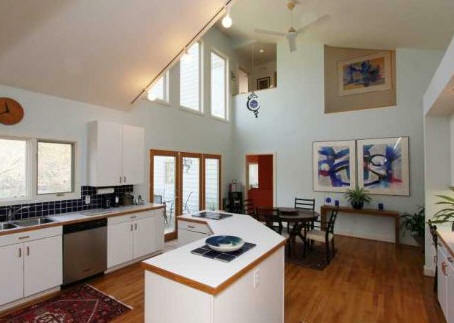 Sold in 2006 to Michael and Kathleen Gleason. Sold in 2013 to Oldin and Monica Mihalcescu. Sold in 2016 to Philip and Ann Weber. 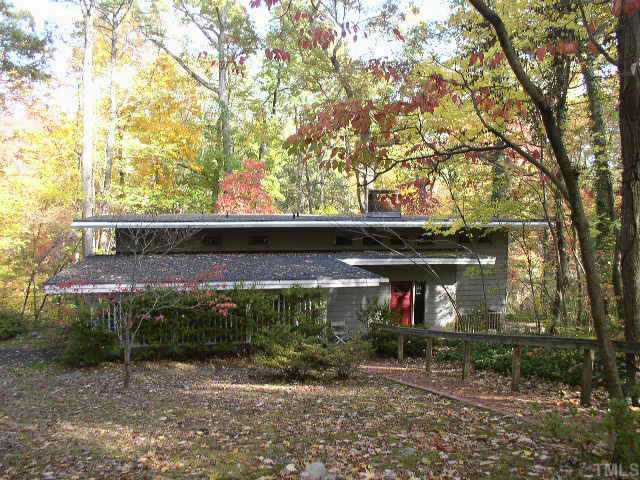 1973 - The John William and Nova Jeanne Gastineau House, 409 Lyons Road, Chapel Hill. 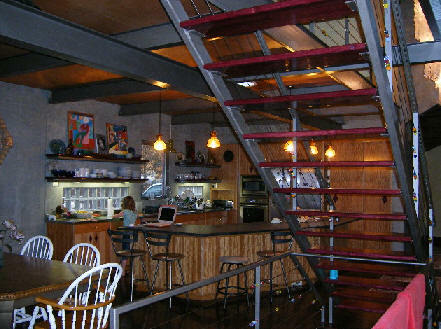 Designed by architect Merle Dixon. Built by Dennis Howell. Morris King was the Landscape Architect. Still owned by the Gastineaus as of 2013. Photo by Chase Hanes. 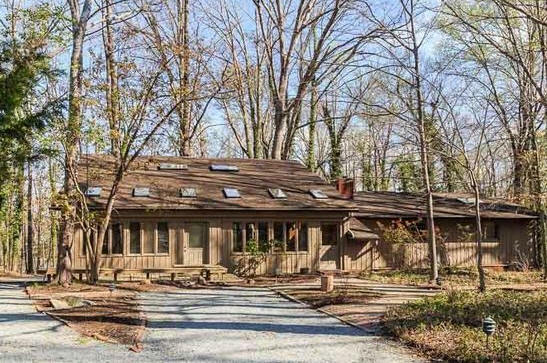 1973 - The Eugenia Conway House, 1720 Allard Road, Chapel Hill. Architect unknown. Built by J. P. Goforth. Photo by Jill Blackburn. As of 2011, still owned by Conway. 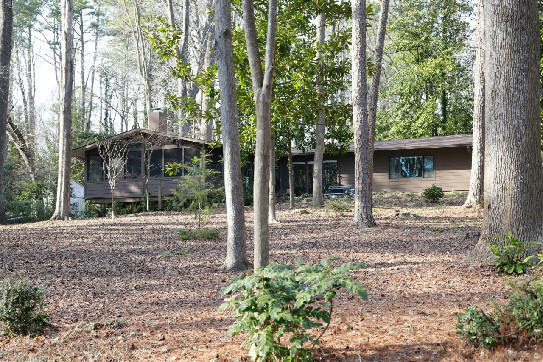 1974 - The John J. and Kathleen Gallagher House, 401 Lakeshore Lane, Chapel Hill. Architect unknown. Sold in 1984 to William and Nancy Hook. 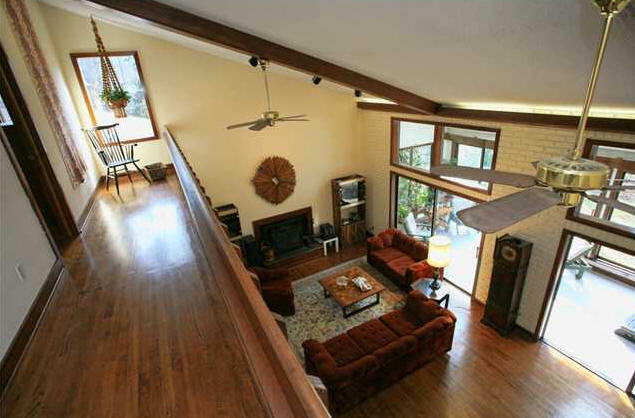 Sold in 2004 to Joel D. Farren and Darcy Berger. 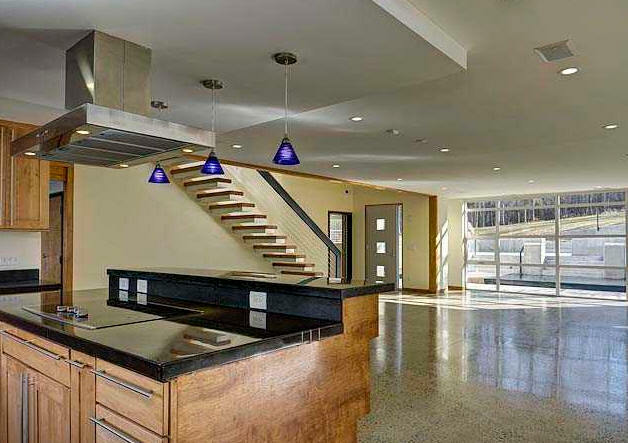 Renovated in 2005 by architect Jay Fulkerson. 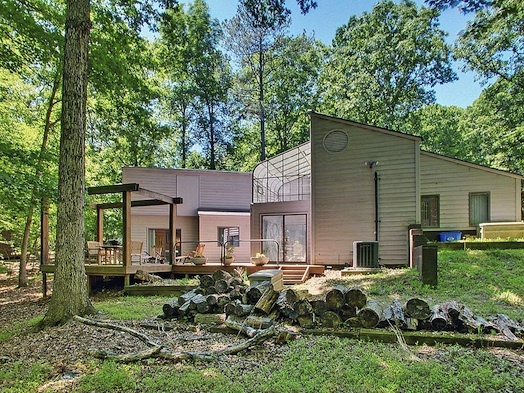 Sold in 2008 to Jeffrey and Sonya Fischer. 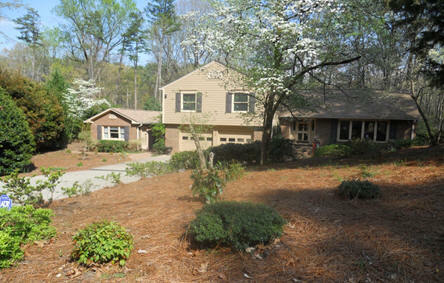 Sold in 2011 to William and Valerie Copeland. Sold in 2017 to Susanna Caviglia and Nicolas Brunel. 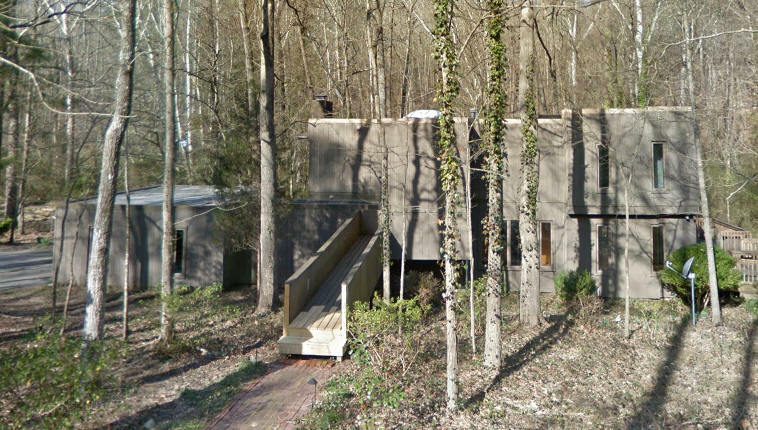 1974 - The Joseph and Marie Lovera House, 637 Kensington Drive, Chapel Hill NC. Architect unknown. 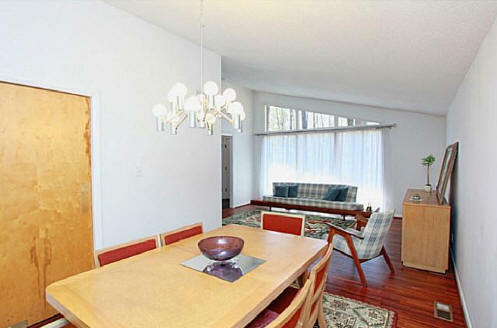 Sold in 1980 to Homequity Inc. Sold in 1989 to John P. and Martine Yolande Eckblad. Sold in 2004 to Randall J. and Rosalia G. Blanco. 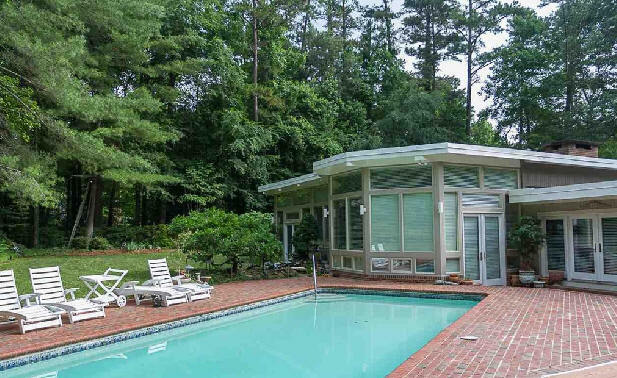 1974 - The William R. and Sarah Proffit House, 620 Rock Creek Road, Chapel Hill NC. 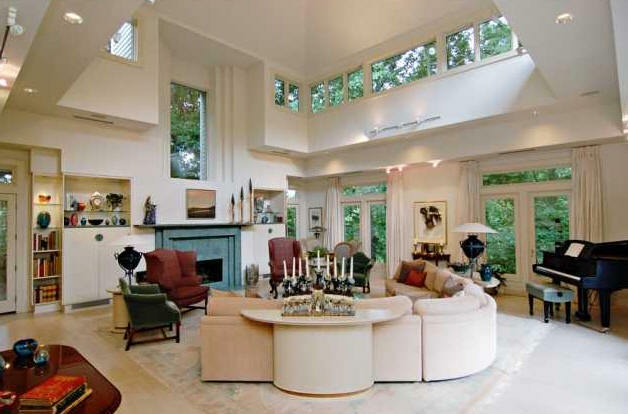 Designed by KY architect Richard B. Isenhour. 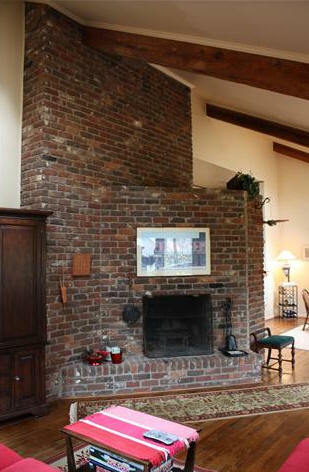 Sold in 2009 to Brian and Helen B. Buckley. Sold in 2012 to David and Leigh Dasher. 1974 - 1436 Poinsett Drive, Chapel Hill. Architect unknown. Sold to Anne S. Wynne. Sold in 1999 to Kenneth M. Gorforkle who still owned it as of 2014. Photo by Duffy Healey. 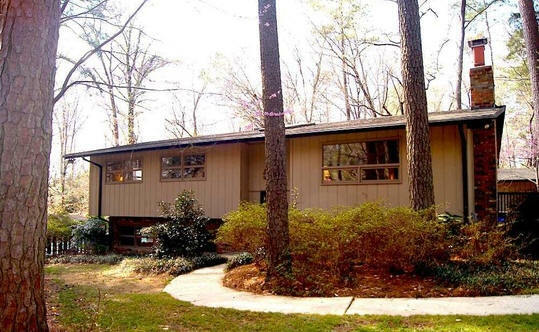 1974 - The Bob Bryan House, 206 Davie Lane, Chapel Hill. 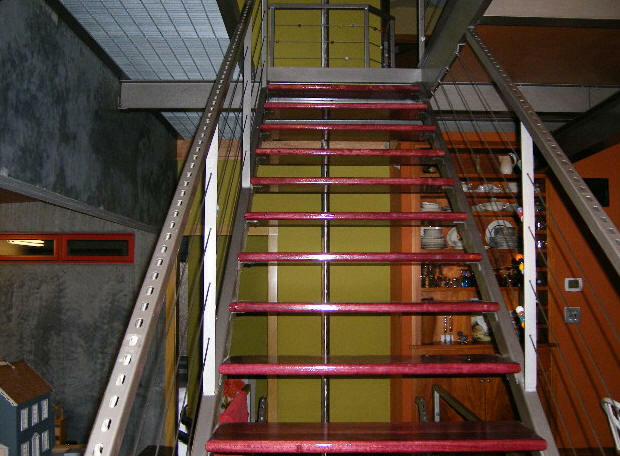 Designed and built by Bryan, who was a realtor. 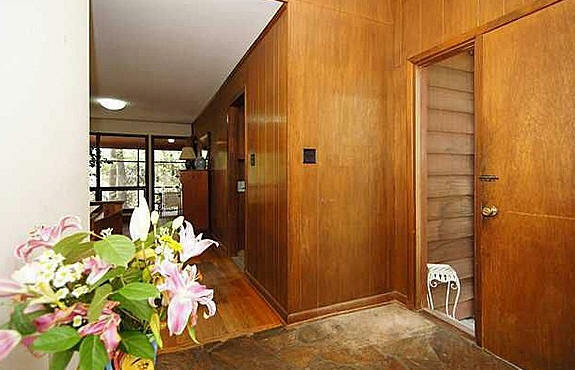 Sold in 1976 to Marge and Bill Cowan. Sold in 2007 to Barrington Hill. 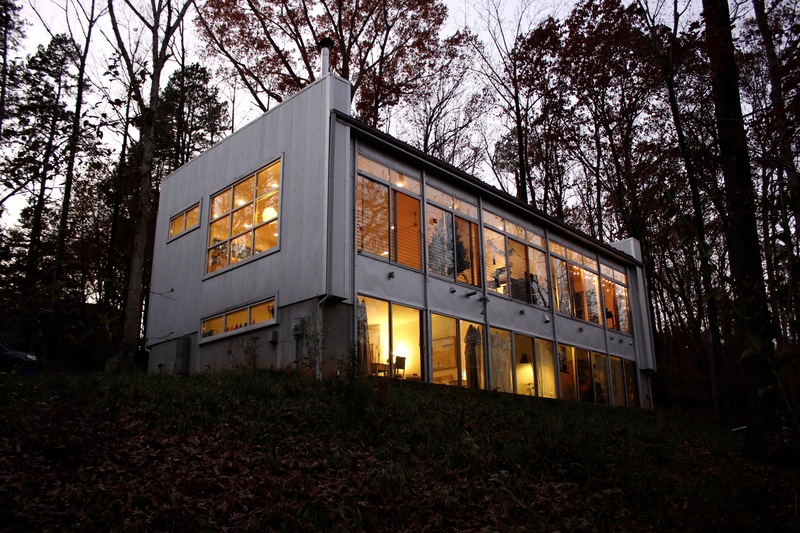 Renovated by Jay Fulkerson. Second photo by Heather Wagner. 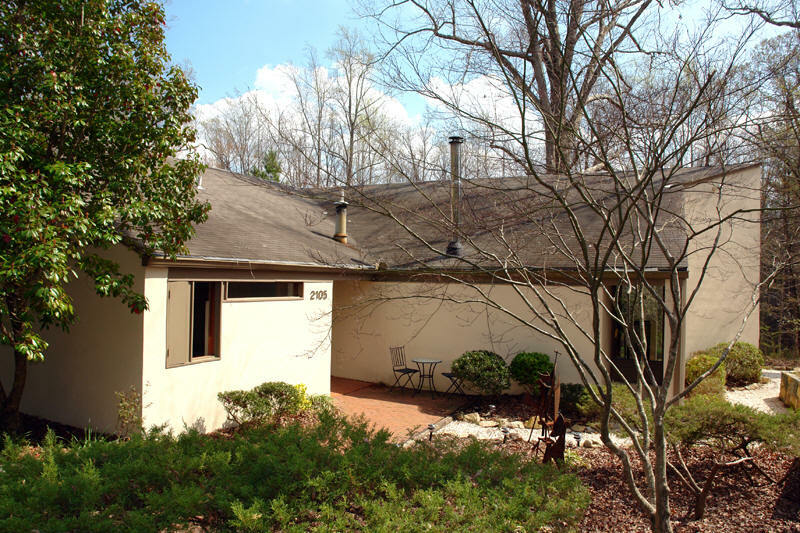 1974 - The Jan and Aletta Boeke House, 613 Kensington Drive, Chapel Hill. 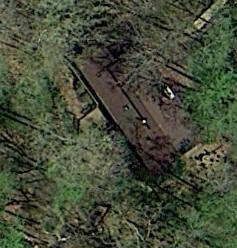 Architect unknown by all parties - it was probably a Deck or plan book house. 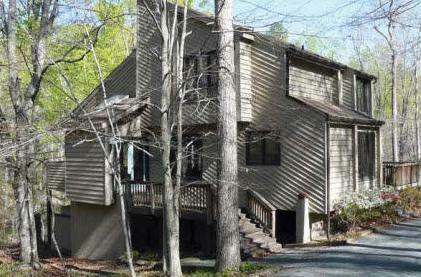 Sold in 1992 to Robert and Vivian V. Plonsey. The Plonseys added onto the house and repositioned the front steps. 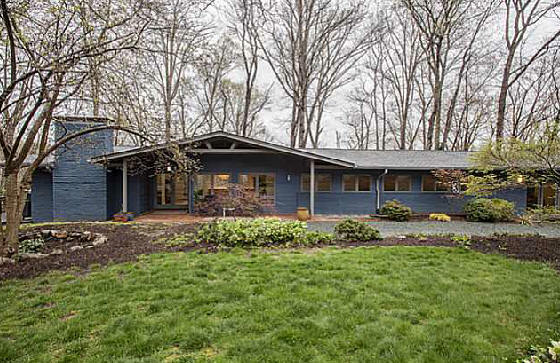 Sold in 2001 to David W. and Elizabeth Hays, Jr. Sold in 2003 to Geoffrey Harpham and Joan Barasovska. Photo by Heather Wagner. 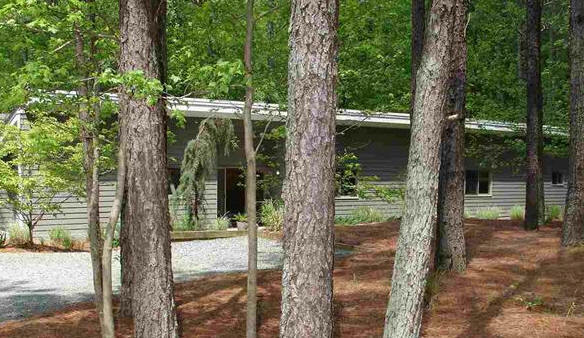 Sold in 2016 to Susan Hester and Sarah Douglass. 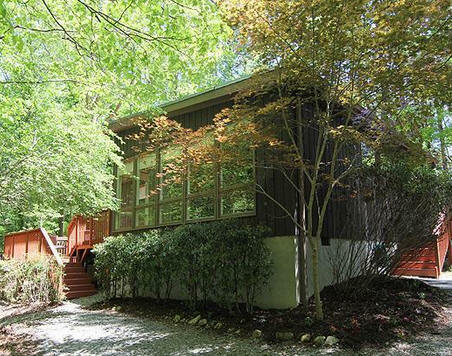 1974 - The Frederick and Carol Russ House, 7522 Kennebec, Chapel Hill. Architect unknown. Built by J. P. Goforth. 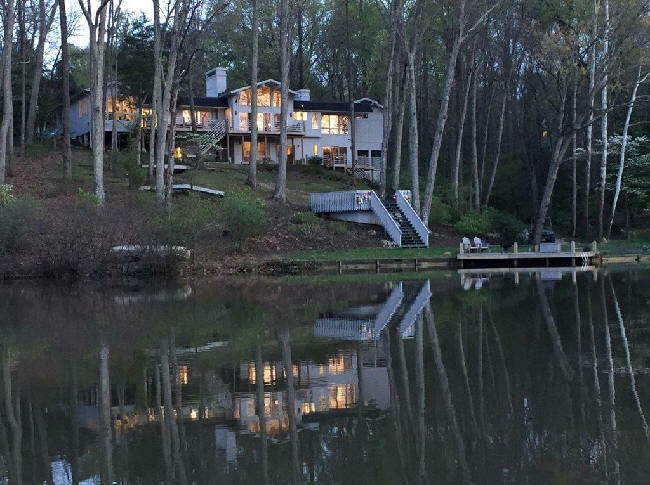 Sold in 1996 to Gary and Elizabeth Smith, who still own it as of 2015. 1974 - 2549 Owens Court, Chapel Hill. Built by J. P. Goforth. Architect unknown. Sold in 2013 to Katherine A. Stefko. Sold in 2015 to Jasmine Chehrazi. 1974 - 110 Farrington Drive, Chapel Hill. Designed by Walter Pierce. Sold in 2017 to Shiney and Michael D. Deel. 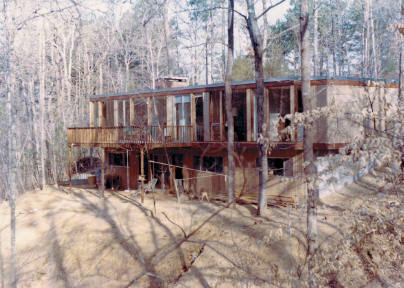 1975 - The Susan and H. Mark Daley Jr. House, 2411 Honeysuckle Road, Chapel Hill. Architect unknown. Built by J. P. Goforth. 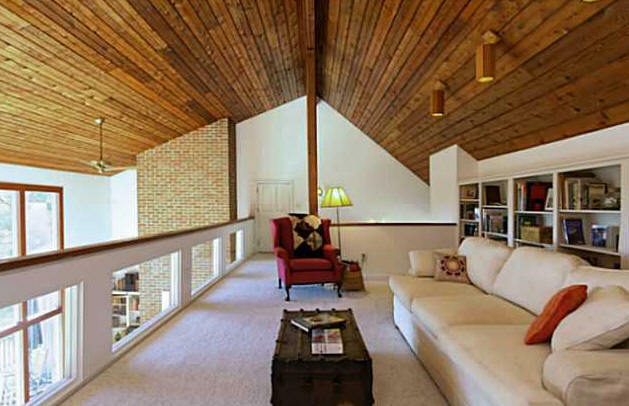 Sold in 1976 to Doris P. and James H. Shumaker. 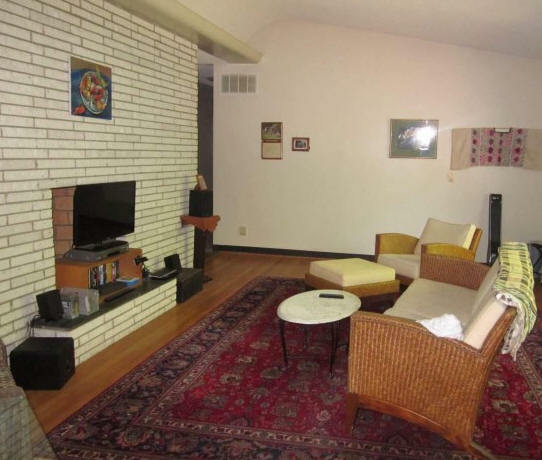 Sold in 1980 to David E. and Bonnie M. Boaz. Lucy Carol Davisdid renovations in the 1980's and 1990's. 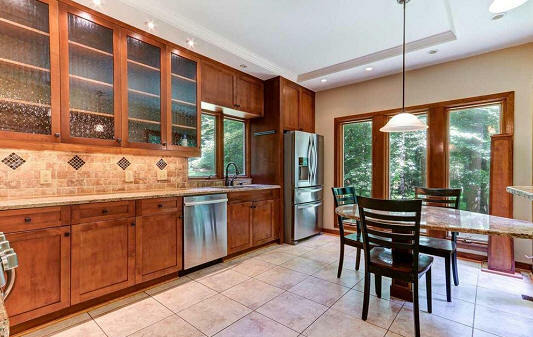 Sold in 2013 to Jennifer and Eric B. Vuillermet. 1975 - 233 Forest Hill Road, Chapel Hill. Architect unknown. Built by J. P. Goforth. Sold in 1983 to Maurice and A. Marie Graves. 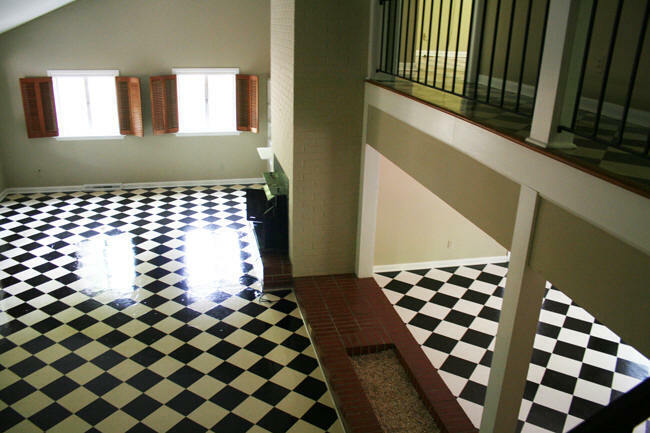 Sold in 1991 to Edgar and Susan Marston. Sold in 1995 to Elaine C. O. Burgwyn. 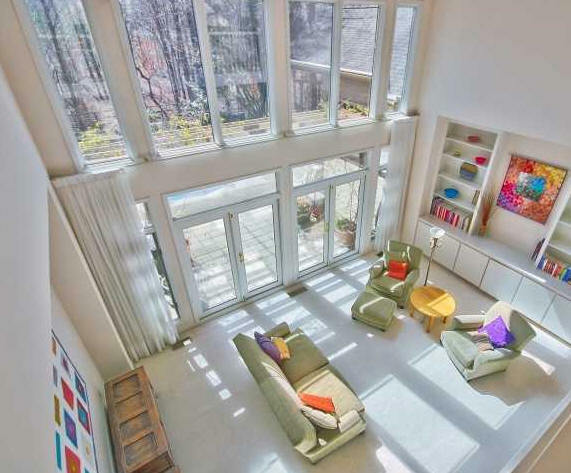 Sold in 1998 to Daniel Rosin and Scott Wojnovich. 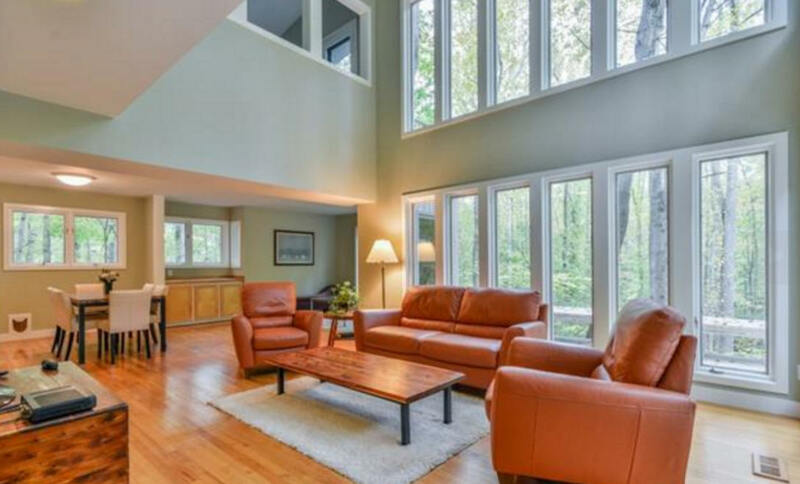 Sold in 2002 to Scott Wojnovich and Lisa Orringer. 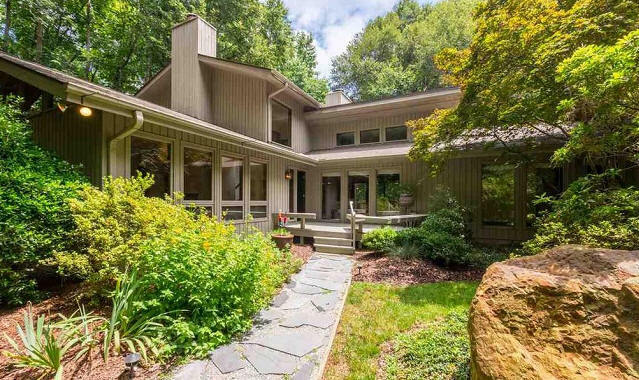 Sold in 2005 to Phillip and Robin Motley Jr. Sold in 2015 to Caitlan MacKinnon-Patterson and Thomas Dangelo. 1975 - 291 Lystra Estates Road, Chapel Hill. Architect unknown. Built by J. P. Goforth. Sold in 2006 to Rebecca M. and Brent A. Mckee. 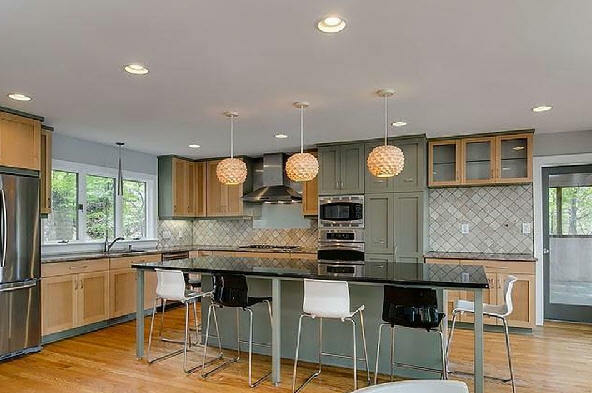 Kitchen renovation by Georgia Bizios. Sold in 2016 to Paula L. and Brian H. Leonard. 1975 - 1423 Gray Bluff Trail, Chapel Hill. Architect unknown. Sold to Louise Zjawin Francke. Sold in 1998 to Craig M. McKay who still owned it as of 2014. Photo by Duffy Healey. 1975 - 641 Wellington Drive, Chapel Hill. Built by J. P. Goforth. Sold in 2017 to Mark Gersovitz. 1975 - 628 Kensington, Chapel Hill. Architect unknown. Built by JP Goforth, according to owner Radu Rosu. 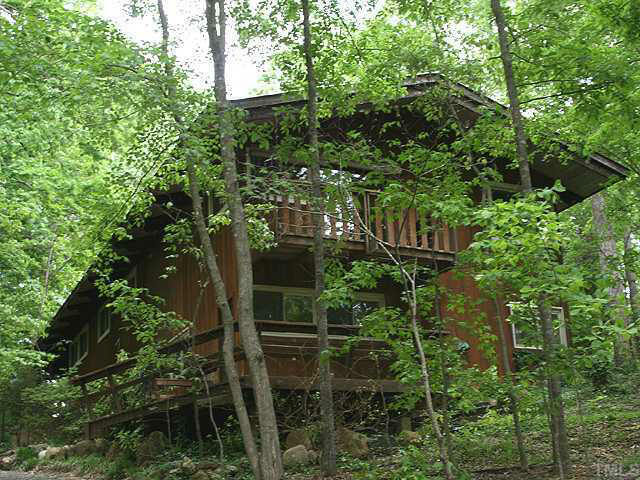 Sold to Eben F. and Nancy Tilly Jr. Deeded to Nancy Tilly. Sold in 2006 to Radu Rosu. Available for rent. 1976 - 1427 Gray Bluff Trail, Chapel Hill. Architect unknown. Sold to William Elzie Bolen. Photo by Duffy Healey. 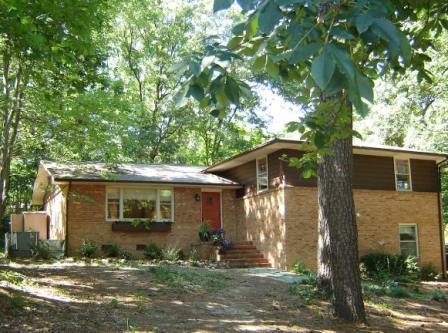 1976 - The Thomas and Laurie (Annie) Freeman House, 232 Knollwood, Chapel Hill. Designed and built by Thomas Freeman. 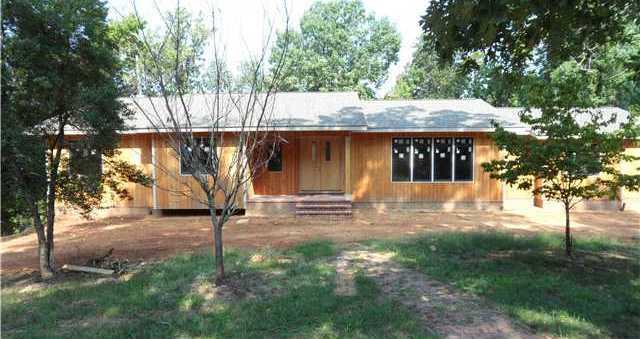 Sold in 2009 to Bryan W. and Laura L. Matthews. 1976 - 1421 Gray Bluff Trail, Chapel Hill. Architect unknown. Sold to William E. Rupp. Sold in 2004 to Carol Oleson who still owned it as of 2014. Photo by Duffy Healey. 1977 - The Vivian Lovell House, 104 Wolf's Trail, Chapel Hill. Architect unknown. Sold to Lani Cartier. She had the plans but they had no date or architect's name. 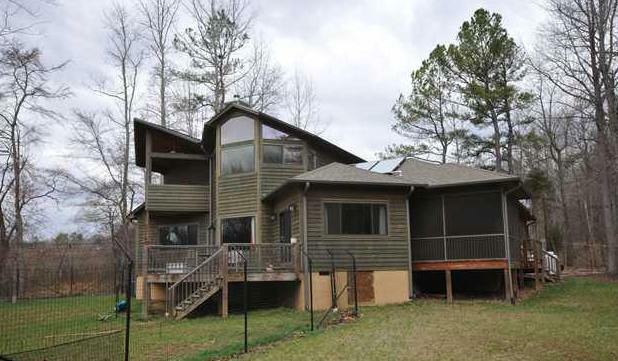 Sold in 2011 to Emily and Michael Triplett. 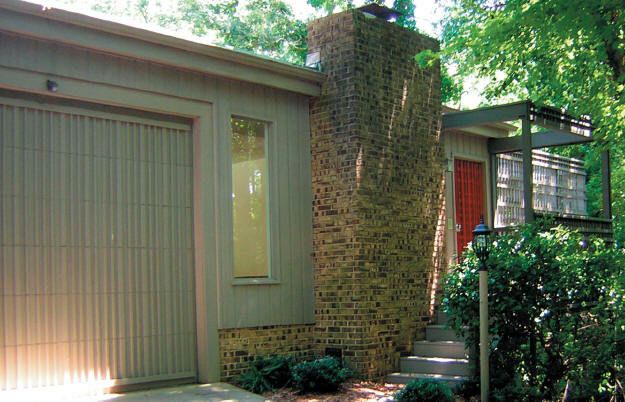 1977 - The Don W. and Joann Powell Residence, 102 Porter Place, Chapel Hill. Architect unknown. Built by J. P. Goforth. Sold in 1992 to Ronald Peter Strauss who still owned it as of 2012. 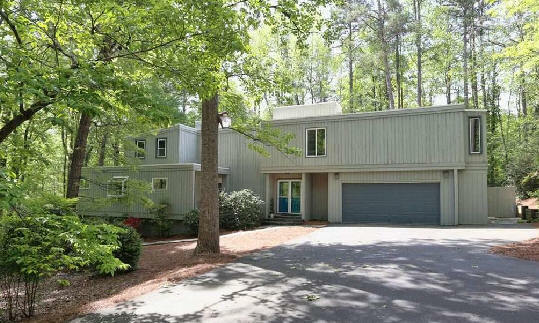 1977 - 509 Lakeshore Lane, Chapel Hill. Architect unknown. Built by J. P. Goforth. 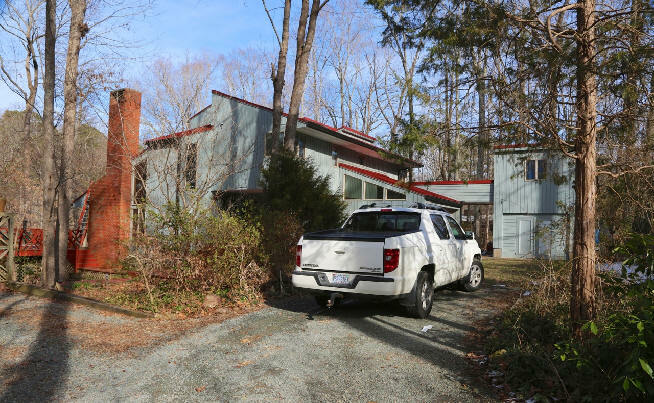 Sold in 2017 to Emily and David Frazelle. 1977 - 329 Azalea Drive, Chapel Hill. Architect unknown. Sold to John P. Dimos. Photo by Duffy Healey. 1977 - 1423 Poinsett Drive, Chapel Hill. Sold to David L. Straight. Photo by Duffy Healey. 1977 - 2508 Foxwood, Chapel Hill. Architect unknown. Built by JP Goforth, according to 628 Kensington owner Radu Rosu. Sold to Leon and Abraham Kiersenbaum. 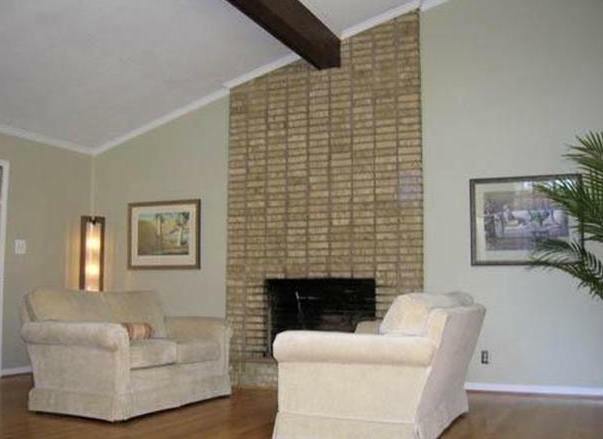 Sold in 1980 to Philip and Linda Carl. 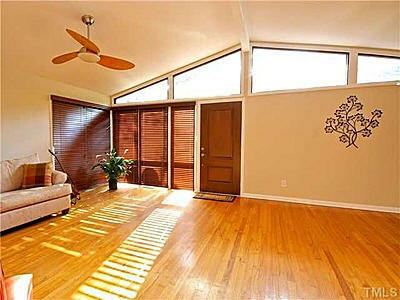 Sold in 2000 to Jeffrey Johnson and Olga Deyneka. 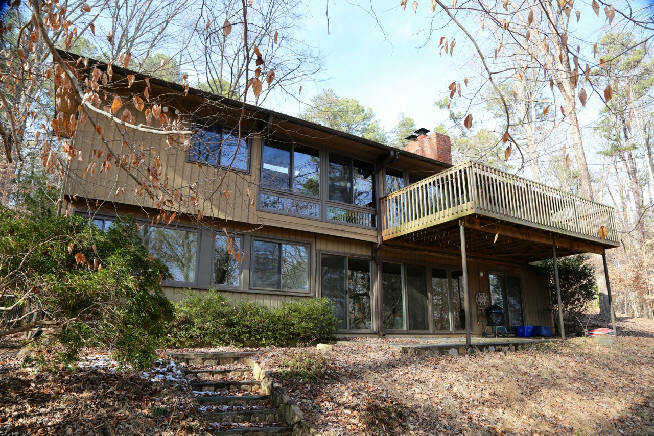 1978 - The Gerald and Adele Mittelstadt House, 107 Springhill Forest Road, Chapel Hill. Designed and built by Bomar Construction. Sold to Elizabeth Akiba in 1995. Sold in 2006 to Andrea J. Ross. Photo by Duffy Healey. 1978 - The John W. and Pamela Drake House, 108 Porter Place, Chapel Hill. 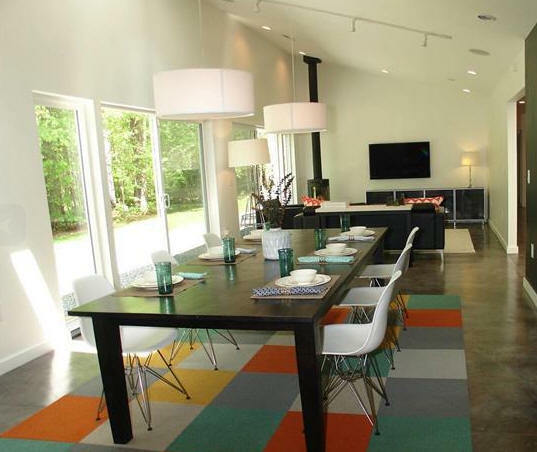 Designed by Ralph Lasater of Lasater/Blakely. For sale for the first time in 2017. 1978 - 162 Lake Ellen Drive, Chapel Hill. Architect unknown. Built by J.P. Goforth. Sold in 1984 to James D. Bader. Sold in 2013 to Jennifer T. Anderson. Sold in 2017 to Ronit Fraiman. 1979 - 1911 Billabong Lane, Chapel Hill. 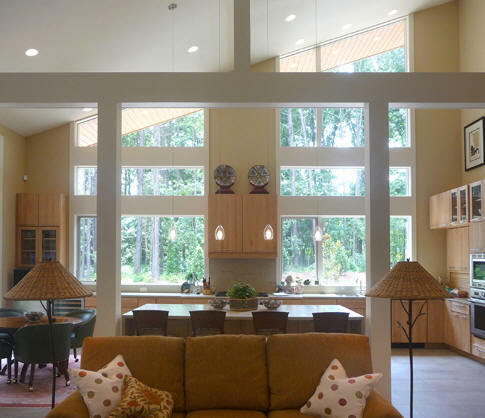 Built by Bob Giddings of Design Spec. 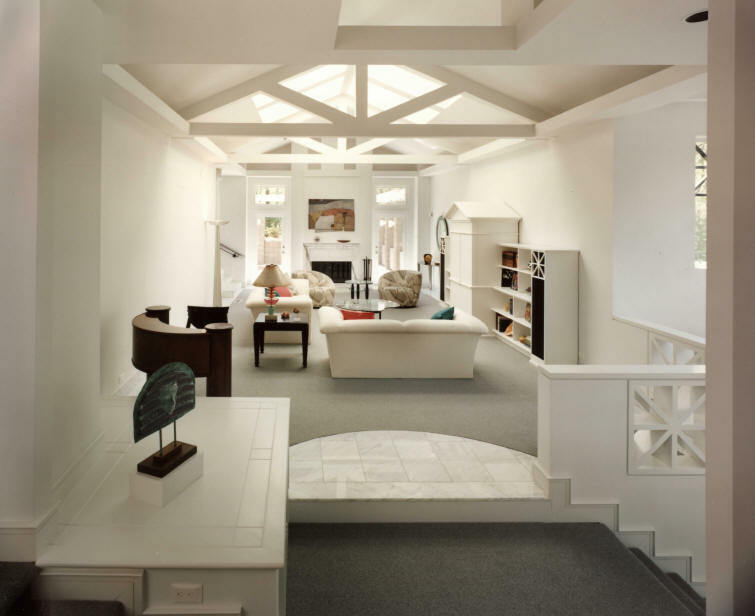 In 1992, Warner Hausler of Design Spec added on the library, dining room, bathroom and upstairs bedroom/office. 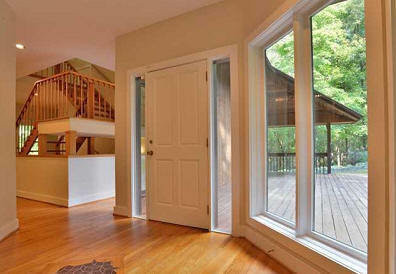 At that same time the master bedroom, kitchen and entry foyer were enlarged. Sold in 2017 to Rishma Shah. 1979 - The Carole L. Crumley House, 1921 Billabong Lane, Chapel Hill. 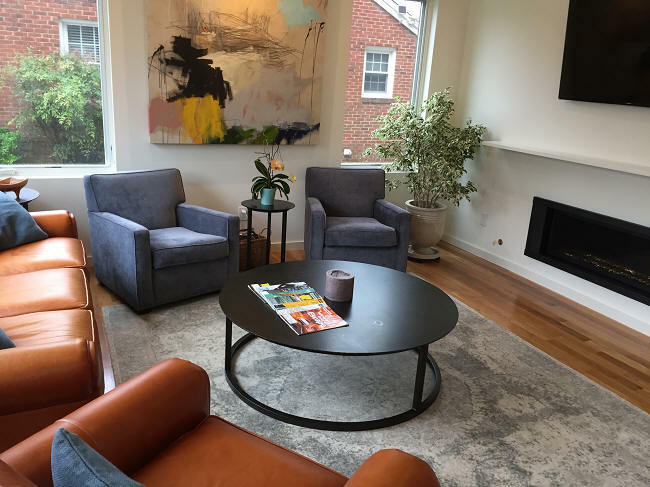 Designed by Bob Giddings of Designworks Sold in 2017 to Suzanne Mclees. 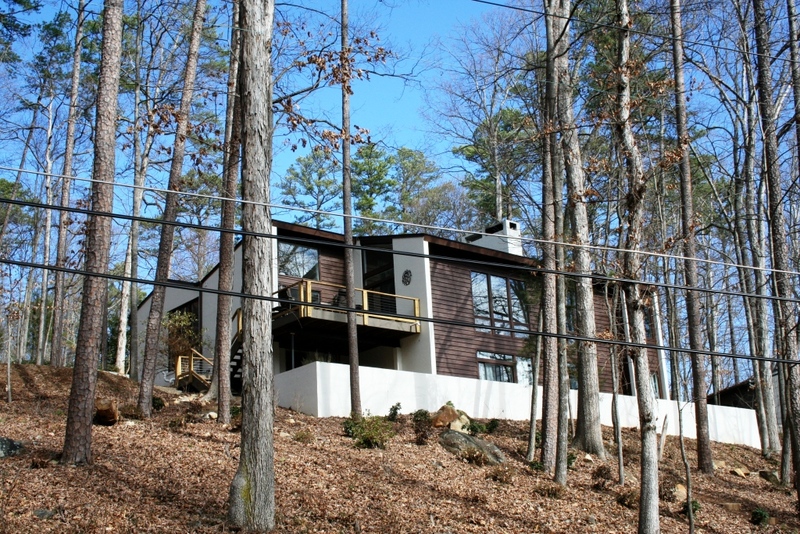 1980 - The Cliff and Linda Butler Residence, 867 Cedar Fork Trail, Chapel Hill. Designed by the owner. Working drawings byJohn Couch of J. P. Goforth's Security Building Company's design department. 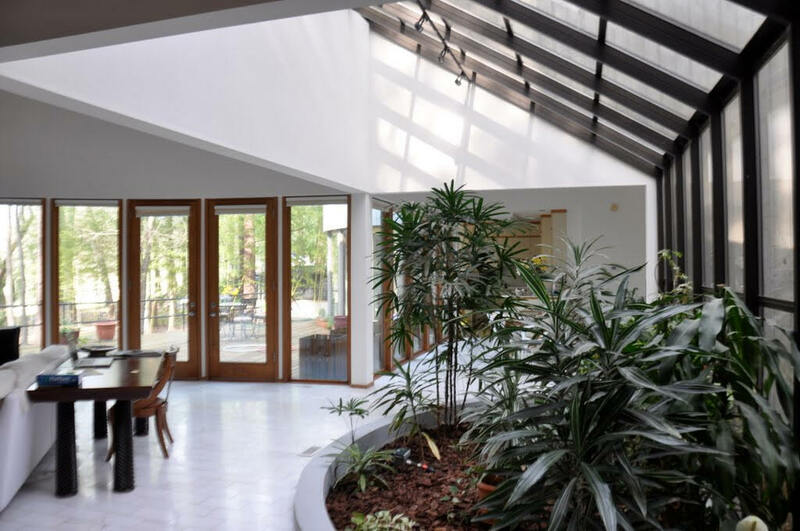 Leon Meyers built the house, also while working for Security Building Company. 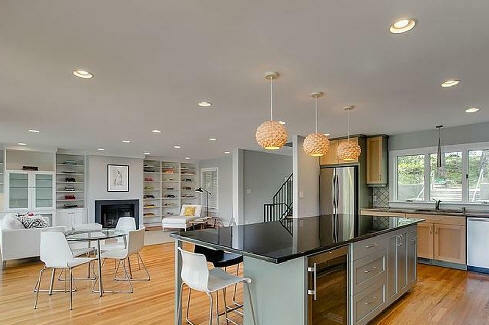 Dail Dixondid a kitchen renovation and addition in 2004, built by Meyers who by then long had his own construction firm. Photos by Leon Meyers. As of 2014 still owned by the Butlers. 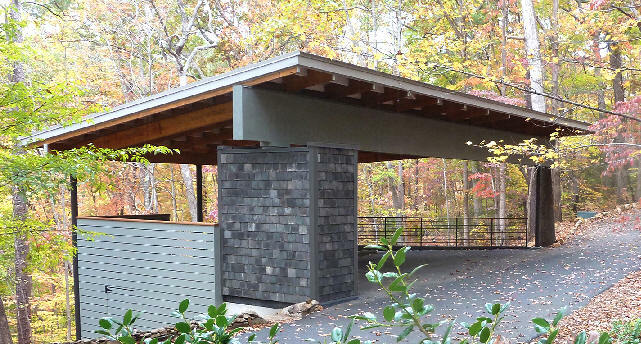 Garage addition in 2014 designed by Dail Dixon, built by Leon Meyers, bottom photos. 1980 - The David Godschalk House, 202 Davie Lane, Chapel Hill. 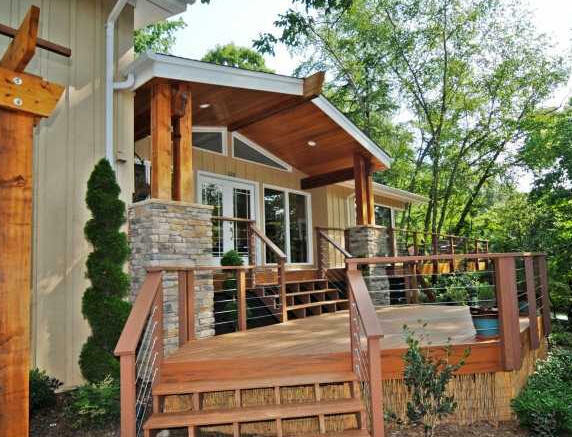 This is a well-executed copy of a Deck House, designed and built by Bob Bacon of Bomar Construction. 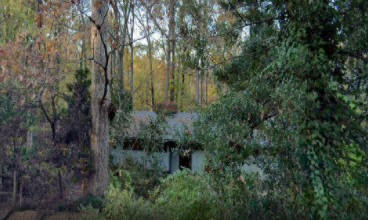 Originally set up for Godschalk's mother-in-law, she moved out after a year and the house became a rental for decades. 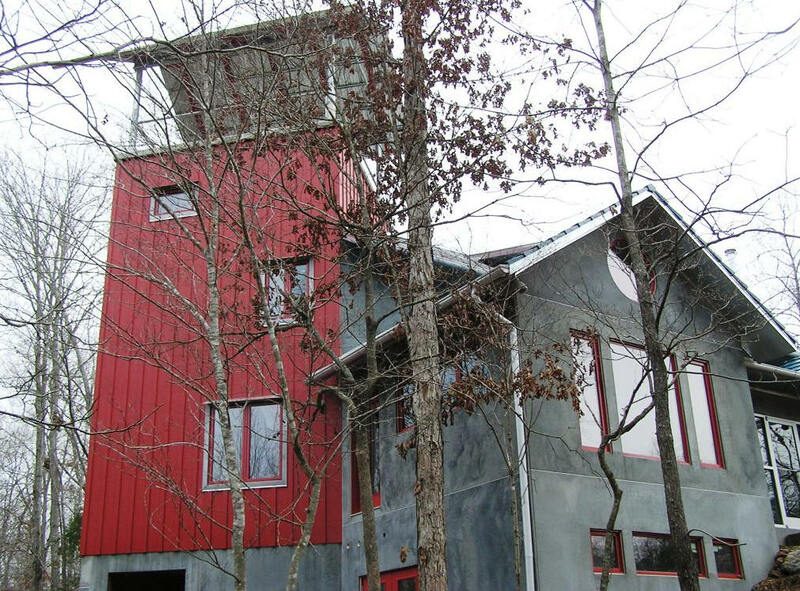 Sold in 2008 to Clay and Betty Whitehead, who lived there while their new house nearby was under construction. 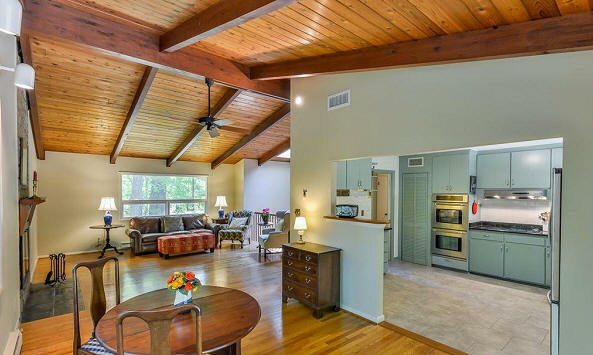 They reroofed and put in new HVAC, extensively remodeled the interior and kitchen, created a master suite, and added a carport and deck above it. Rented for a few years. Sold in 2014 to Elizabeth Engelhardt. 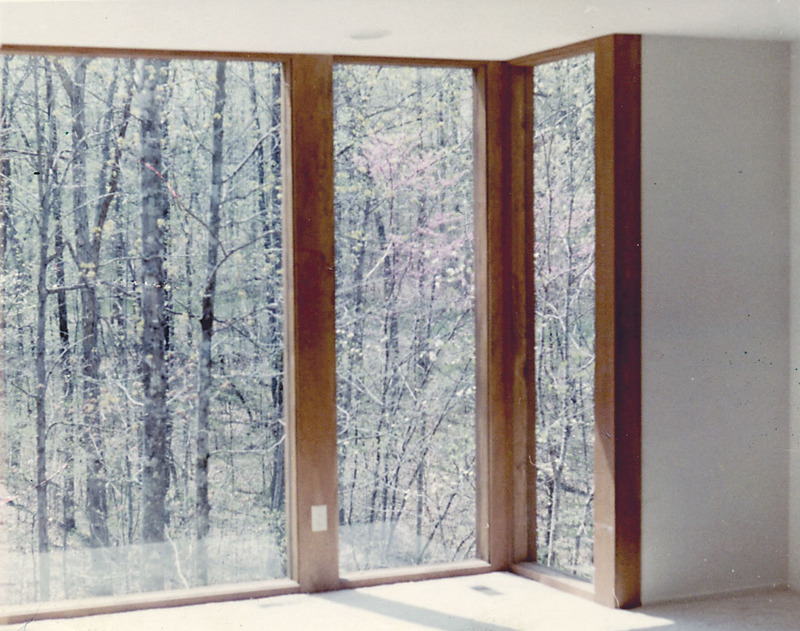 1980 - The Sarah F. Lindsey House, 108 Calumet Court, Carrboro. 1592 sf. Designed by John Lindsey for his mother. Sold in 1991 to Kathleen Thompson. 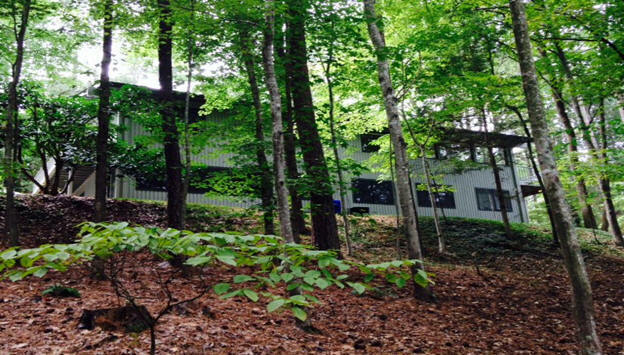 Sold in 2013 to Laura Ann Miller and Michael David McDonald. 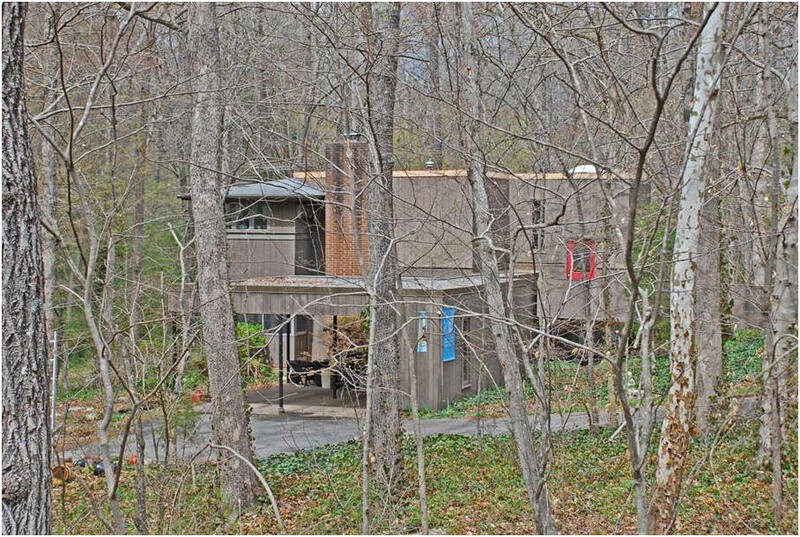 1981 - The William Nealy and Holland Wallace House, 4912 Boulder Run, Hillsborough. 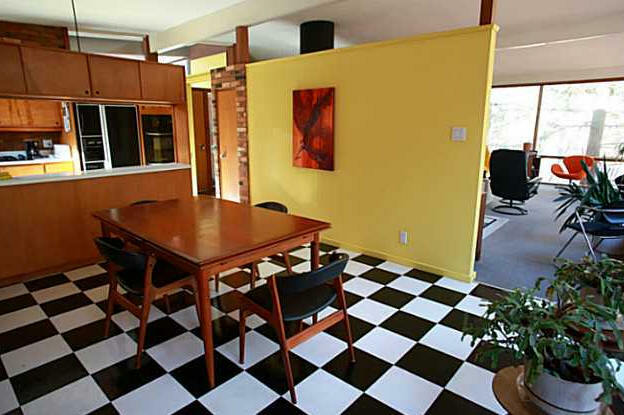 Designed by architect Ronald L. (Ron) Mace. 17 acres. Sold in 2010 to Steven Dock. 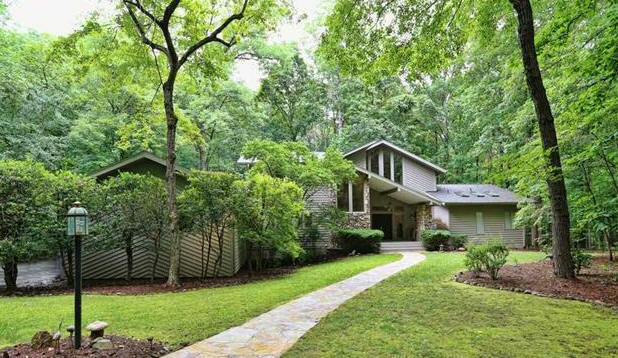 1981 - The Alan E. and Mary Lynn Taylor Rimer Residence, 609 Lakeshore Lane, Chapel Hill. Architect unknown. 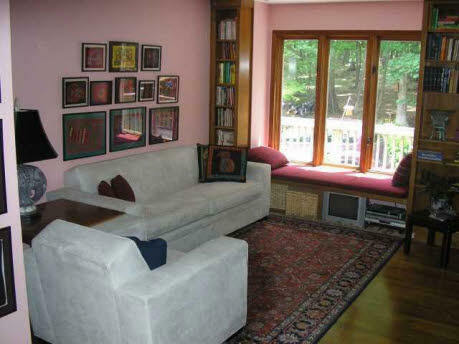 Sold in 1996 to Gart D. and Anne T. Davis. 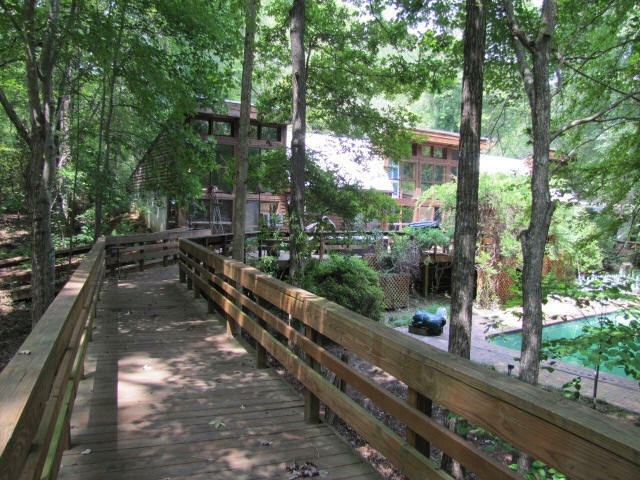 Sold in 2004 to Carrie W. and Thomas C. Perkins. 1981 - 1425 Grey Bluff Trail, Chapel Hill. Architect unknown. 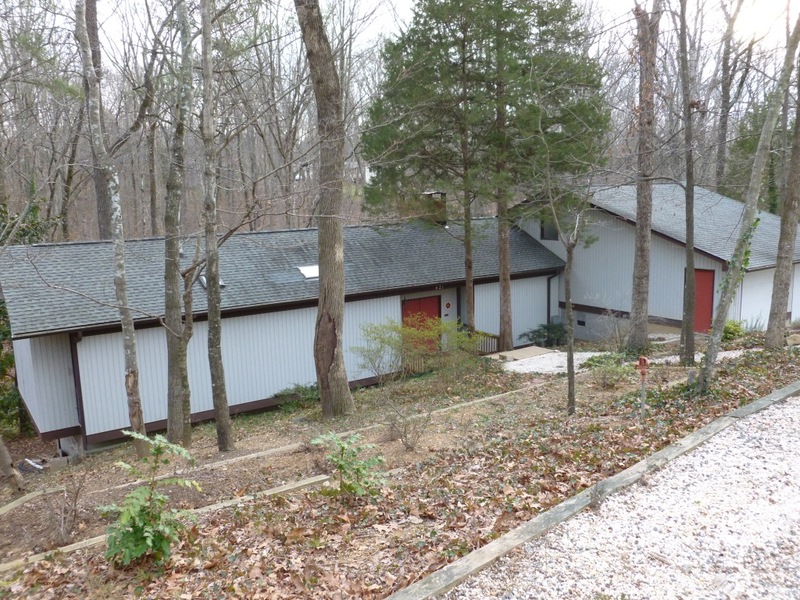 Sold in 2016 to Sally L. Van Wert and Norman J. Glassbrook. 1982 - The Richard and Martha Beutel House, 4 Buttons Road, Chapel Hill. Built by J. P. Goforth. Architect unknown. Sold to Mary A. D. Eubanks. Sold to Barbara Wood and MJ Pratt. Sold to Alan Goldstein and Diane Chambless. Sold in 2002 to Pamela Cuff and Tracy Lewis. 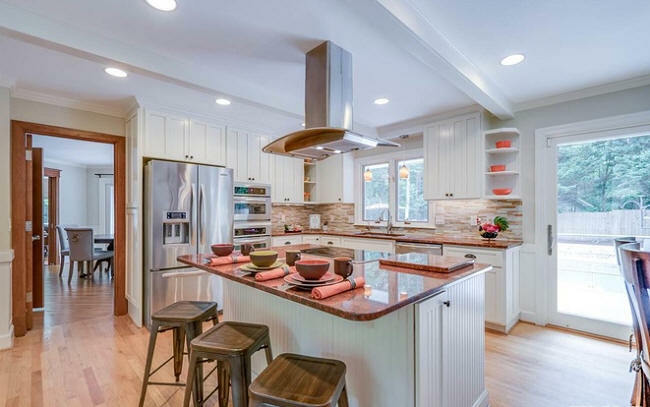 Kitchen renovation by Dail Dixon. Transferred to Pamela Cuff in 2012. Top photo by Carin Walsh. Bottom photo by Virginia Faust. 1982 - 3212 Whitfield Road, Chapel Hill. Architect unknown. Sold in 2016 to Joseph F. and Anna R. Edney. 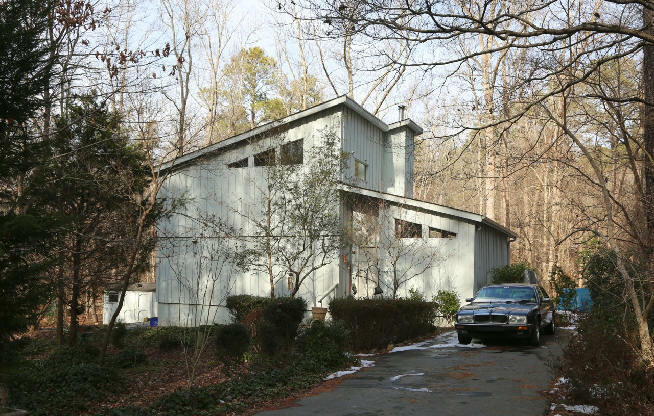 1983 – The Sally Jesse and Mack Brown House, 830 Kenmore Road, Chapel Hill. Architect unknown. Sold to Sharon Palsha and Jake Freiberger. Unsure if Modernist. 1984 - 118 Stoneridge Drive, Chapel Hill. Architect unknown. Built by J.P. Goforth. Sold in 2017 to Warren A. Kibbe. 1984 - 120 Stoneridge Drive, Chapel Hill. Architect unknown. Built by J.P. Goforth. 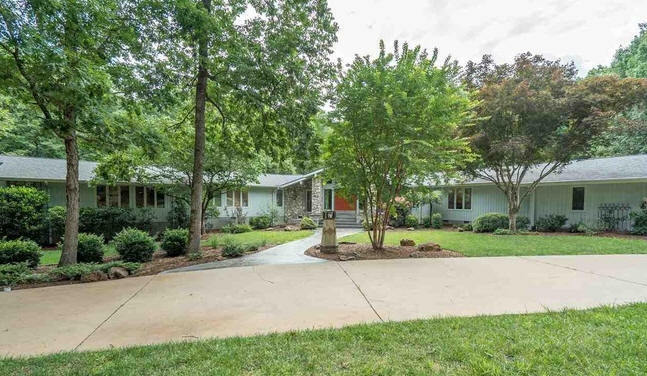 1985 - 4400 Oak Hill Road, Chapel Hill. Built by JP Goforth. For sale in 2017. 1985 - The Roy and Laura Mathew Residence, 3813 Windy Hill Road, Chapel Hill. Designed by Robert Anderson of Nashville TN, a friend of the Mathews. Built by C. S. Witt. Sold to Luca Rigotti and Marily Nixon in 2003. Sold in 2010 to Maria (Mia) S. Halman. 1985 - 1441 Gray Bluff Trail, Chapel Hill. Architect unknown. Sold to William F. Spang. Photo by Duffy Healey. 1986 - The Bradley and Selinda Barker House, 209 The Glades, Chapel Hill. Located in Chatham County. Designed and built by Mark Hance. Sold in 2013 to Inez K. and Daniel L. Taylor. Sold in 2017 to Mary E. Goode and Matthew B. Spangler. 1987 - The Dennis G. and Dorothy J. Vollmer House, 109 Lynwood Place, Chapel Hill. Designed and built by J. P. Goforth. Sold to Anne Churchwell Adams. 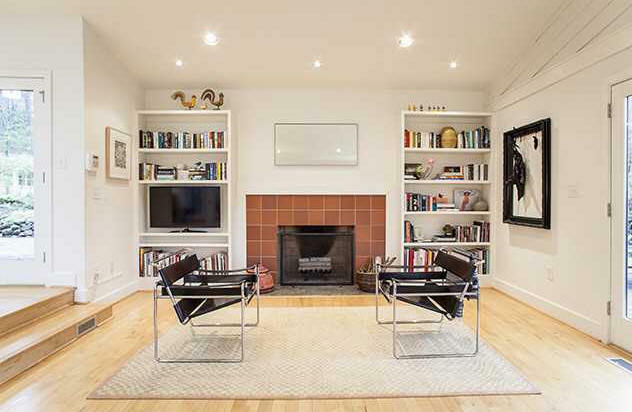 Sold in 2017 to Franklin Li and Jessica Lin. Photos by Franklin Li. 1988 - 327 Azalea Drive, Chapel Hill. Architect unknown. Sold to David C. Lee. 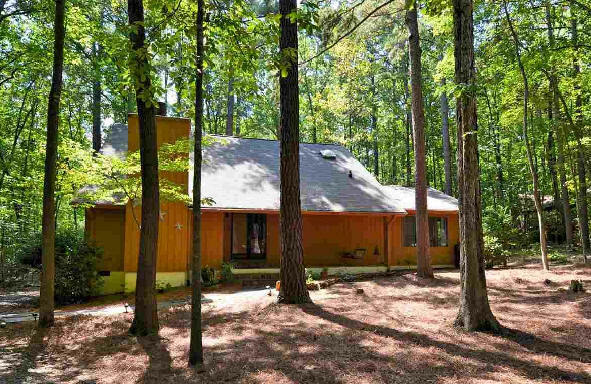 Sold in 1999 to Marcella Burk Groon. Photo by Duffy Healey. 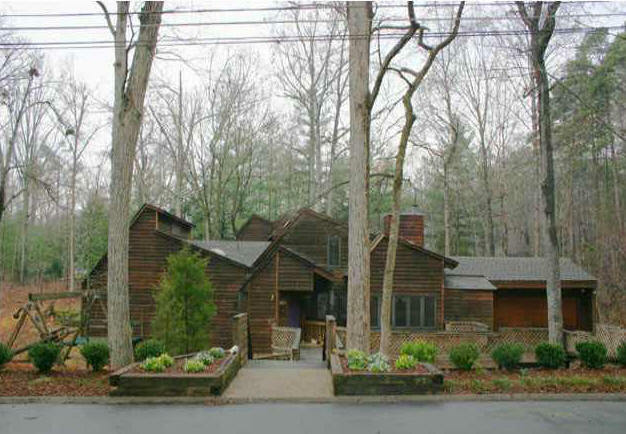 1990 - The Anne C. and Myron Liptzin House, 215 Friendly Lane, Chapel Hill. 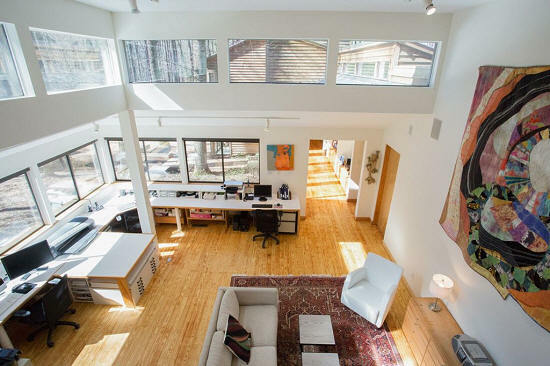 Designed by architect Josh Gurlitz, built by Scott McLean. 1990 - The Frederick W. and E. Perry Good House, 1022 Damascus Church Road, Chapel Hill. 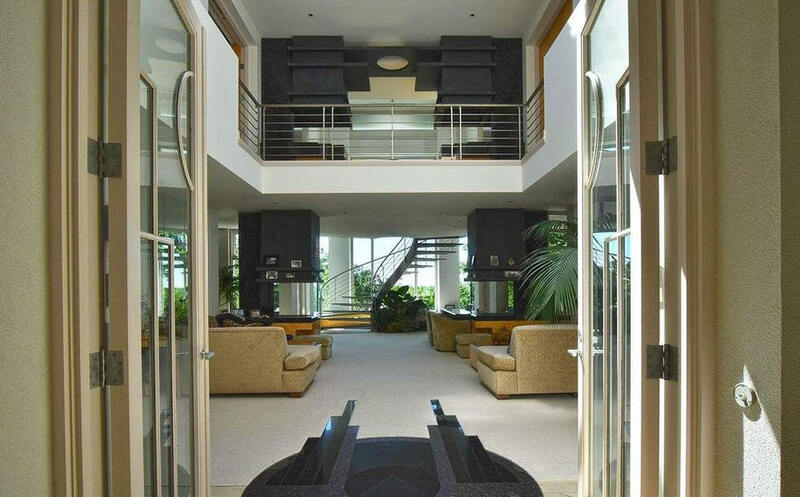 Designed by architect Ron Mace. Built by Claris Building. 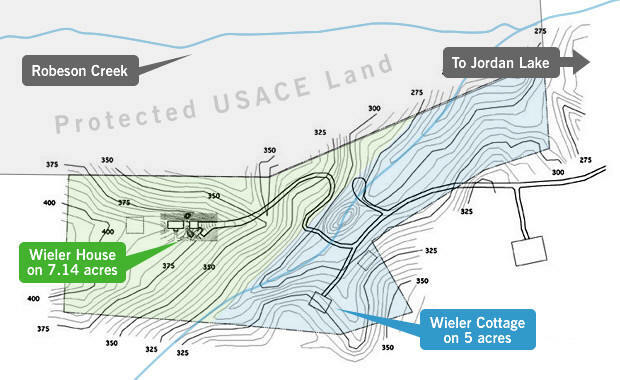 13.5 acres. 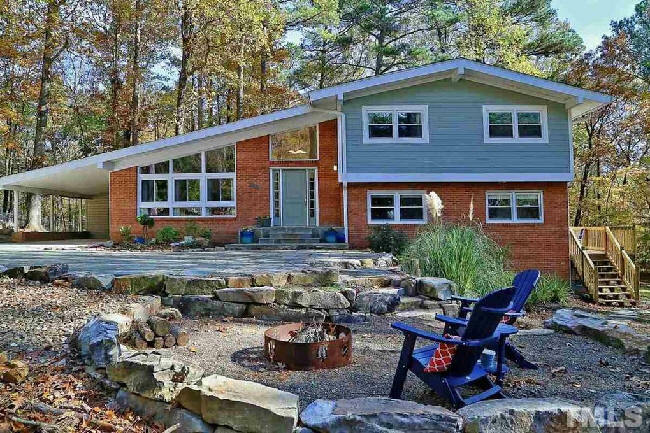 Sold in 2018 to Melissa Russell and Michael Neiswender. 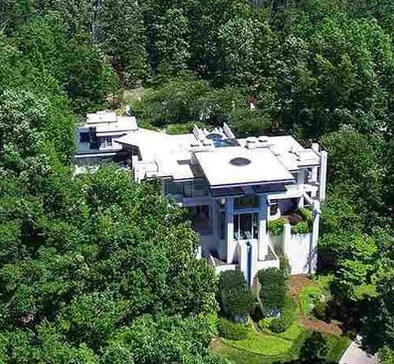 1990 - The Arthur T. Jolin and Wafaa Carter House, 975 Gallup Road, Chapel Hill. Architect unknown. Still owners as of 2016. 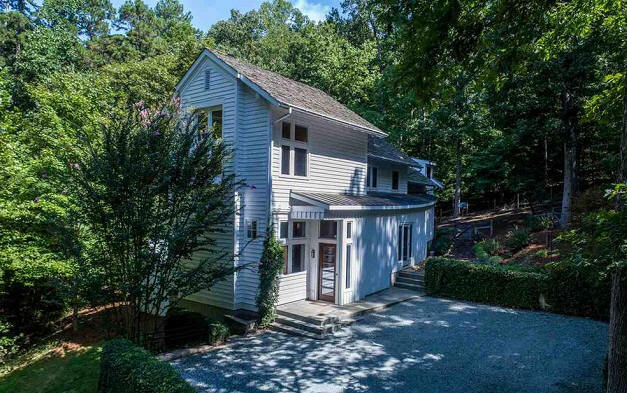 1992 - The G. Douglas Wicker House, 607 Kensington Drive, Chapel Hill. Sold in 1999 to Hun Young Jo. Designed by Steve Gaddis. 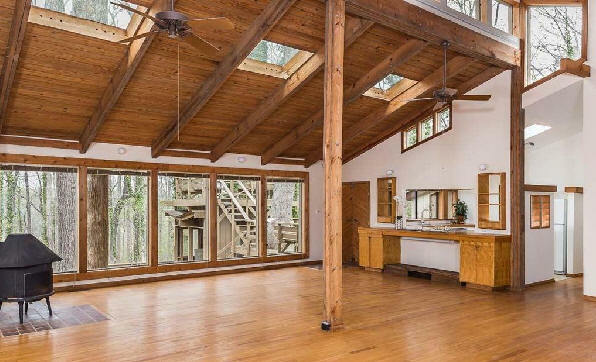 Built by Triangle Homecrafters. Sold in 2002 to Gail McGuinness and William E. Bell. Photos by Jerry Merkatos. 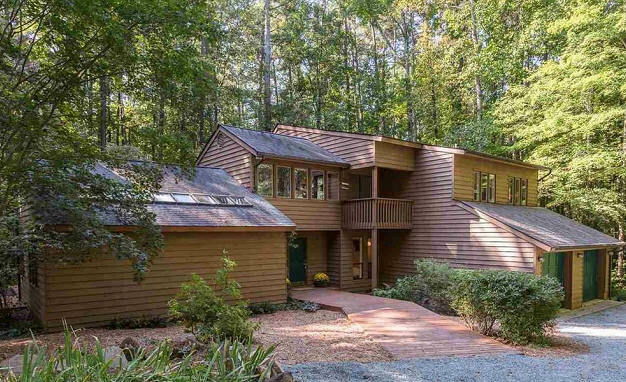 1993 - The Thaddeus V. and Ricka Samulski House, 801 Creekstone Drive, Chapel Hill, NC. Architect unknown. Built by Webster. Sold in 2014 to Helen L. Jang and Sean G. Mitchell. 1994 - The Peter and Sabrina U. 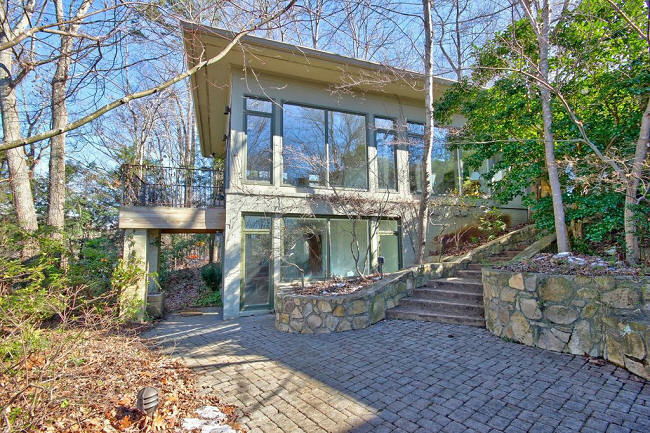 Glass House, 2409 Falls Drive, Chapel Hill. Concept designed by Sabrina Glass. Leonard (Len) Vogel drew up the plans. Built by Ken Kissella of Raleigh. Sold in 1999 to James Boyle and Lauren Dame. Deeded in 2013 to James D. Boyle. Deeded in 2015 to Jennifer Jenkins and James D. Boyle. 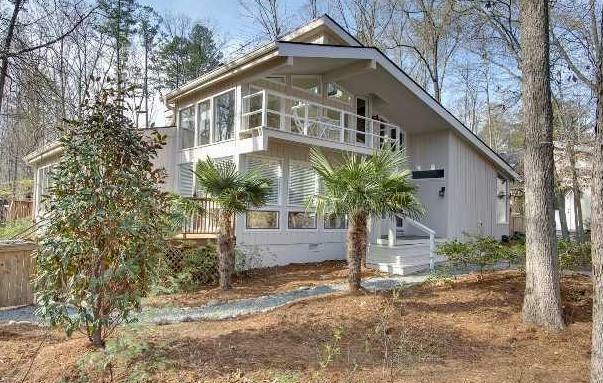 1999 - The Toivo A. Somer house, 24 Frances Street, Chapel Hill. Designed by Taavo Somer. Sold in 2014 to Kevin H. Perrone. 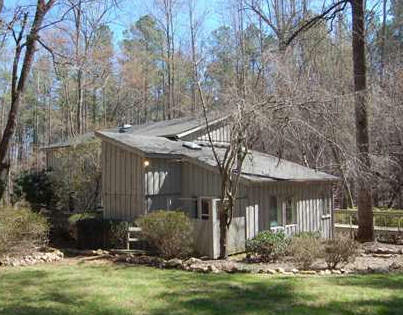 2001 - The Susan S. and Donald (Don) O. Tise Jr. House, 914 Lystra Lane, Chapel Hill. Designed by Don Tise. Sold in 2016 to Barbara A. and David J. Mckeon. 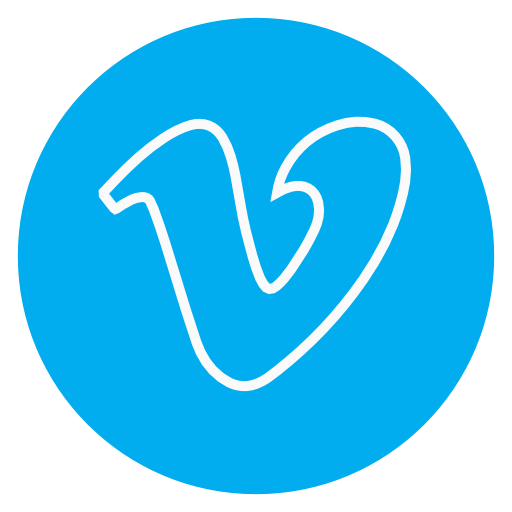 Sold in 2017 to Rebecca L. Vidra and Aaron Moody. 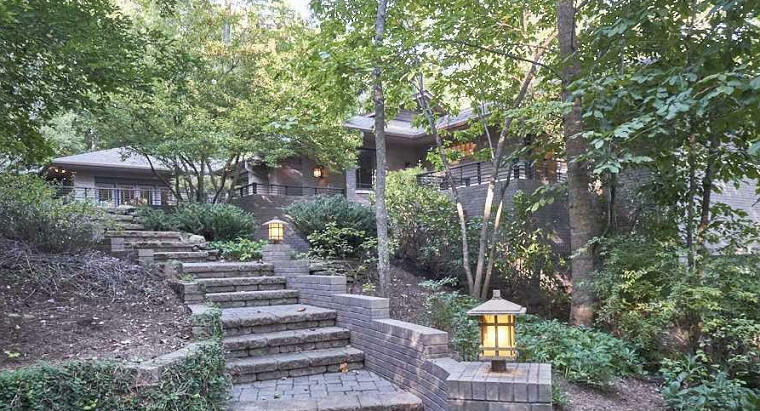 2001 - The Dale F. and Karen Sisel House, aka Eagle's Walk, 23935 Cherry, Governor's Club, Chapel Hill. 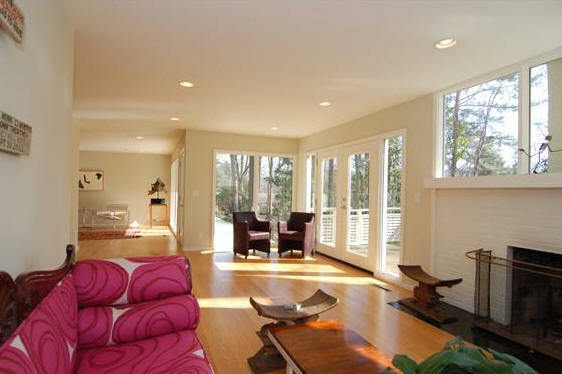 Sold in 2008 to David and Catherine Bova. Located in Chatham County. Designed by Mason Edmunds. For sale in 2017. 2002 - The James J. 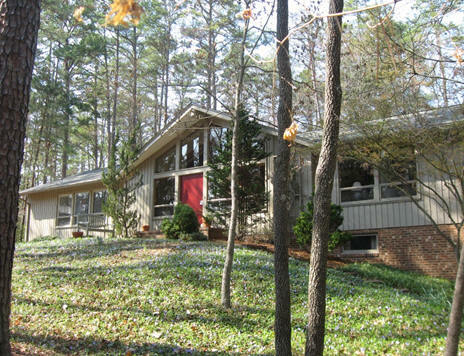 (Jim) and Kim Henry House, 410 Woodgate Drive, Woodlands, Chapel Hill. Designed by Mike Barkley. Built by Jim Henry. 2003 - The Daluge House. 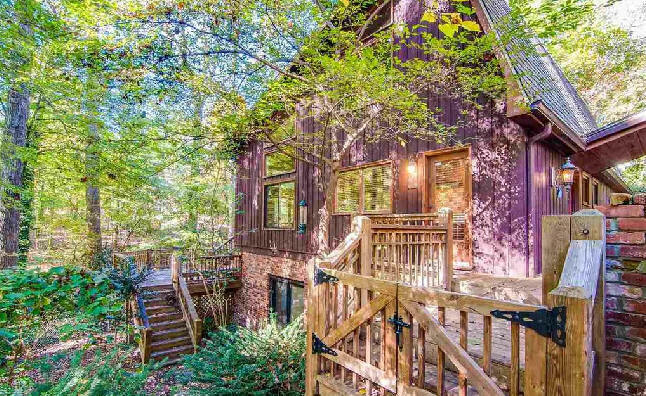 566 Sun Forest Way, Chapel Hill. 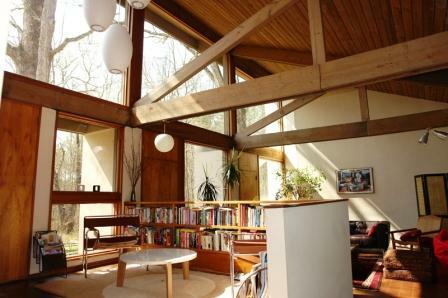 Designed by architect Steven A. Fisher. 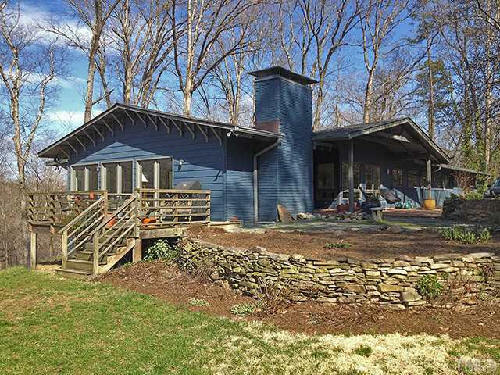 Sold in 2018 to Susanne and William Lovelace. 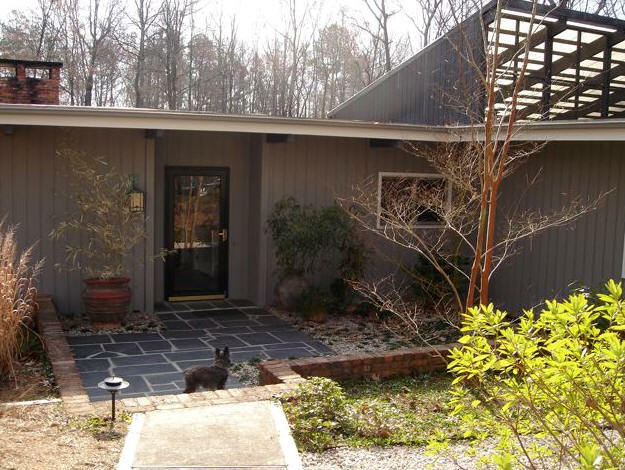 2004 - The John Doerfer House, aka Black Bull, 102 Strowd Lane, Chapel Hill NC. 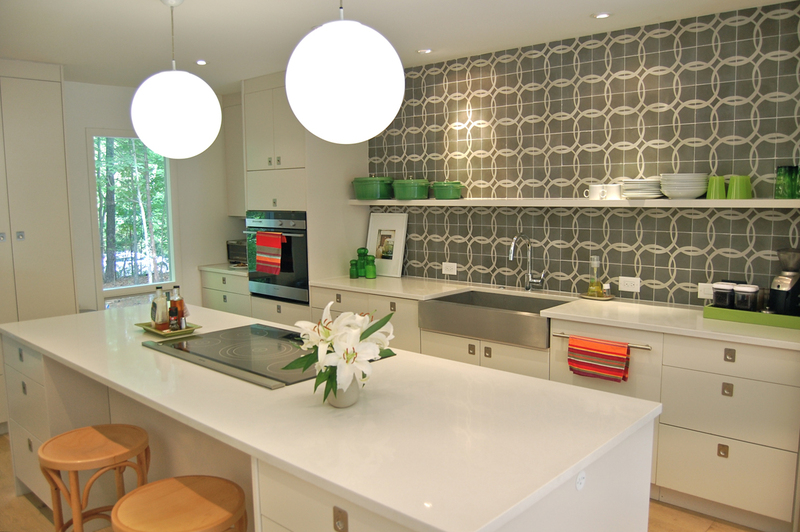 Designed by Bill Luza of Objet Design. Commissioned around 2001. There were 54 iterations. 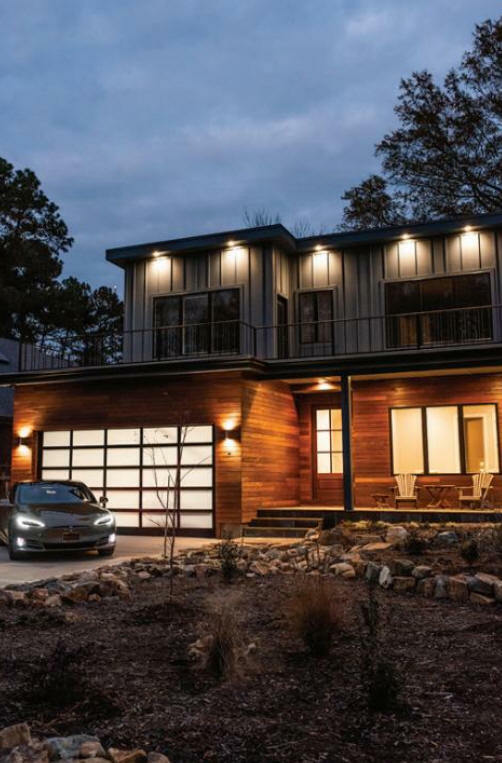 The final version was Japanese in nature; however the client became more concerned with resale value in the traditional outskirts of Chapel Hill, and the modernist Japanese transitioned into a modern farmhouse. Built by Buildex. 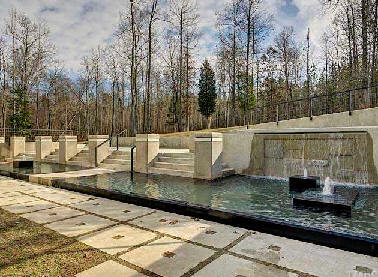 Sold through bankruptcy in 2006 to Kim and Janet Stoltz who hired landscape architect Eric Davis. For sale in 2018. 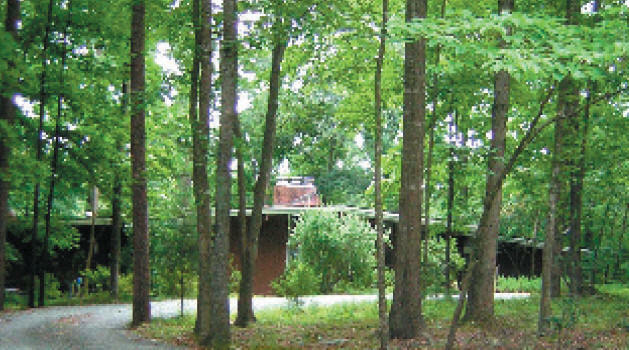 2005 - The Nathan Wieler and Ingrid Tung House, aka the area's first DWELL house, 196 Beech Hill (aka 3246 Hanks Chapel Road), Pittsboro NC. 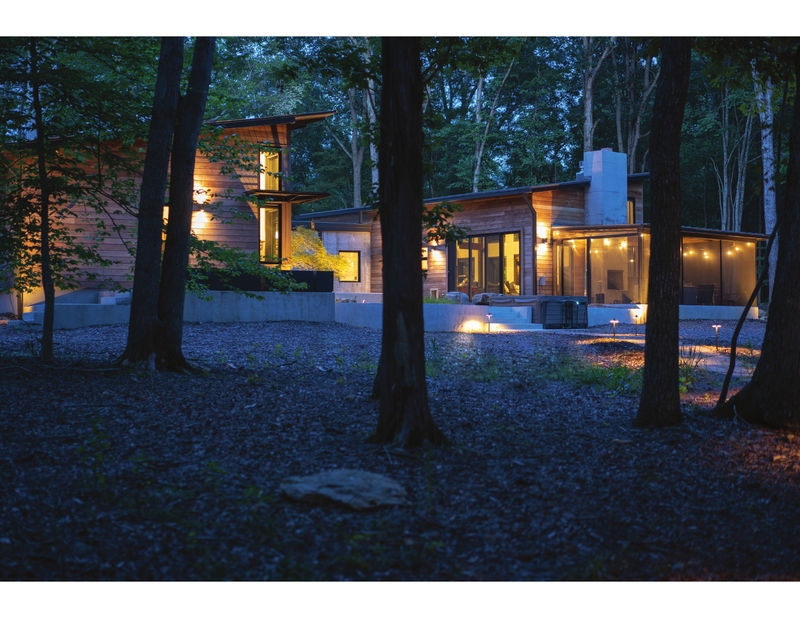 Designed by Joseph Tanney and Robert Luntz of R4A (Resolution 4 Architecture). 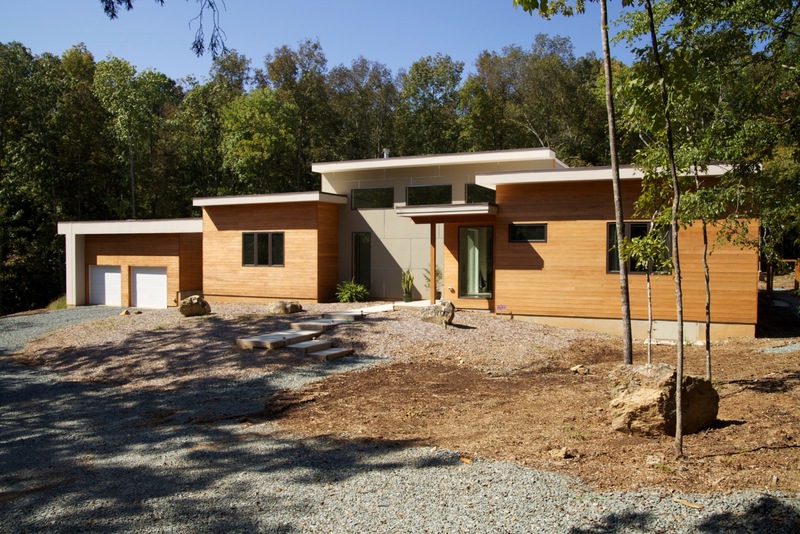 The area's second DWELL house in Hillsborough NC, designed by Joel Turkel, is here. 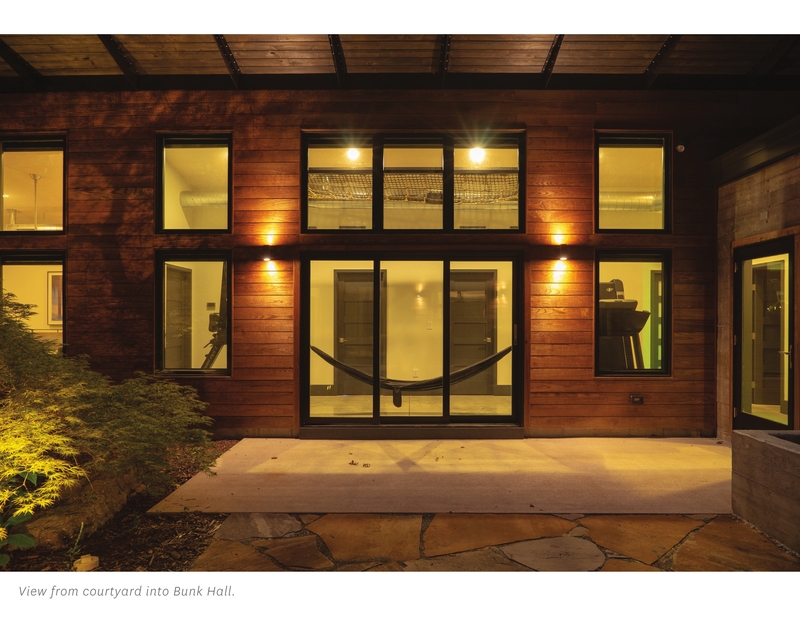 Nathan Wieler and Ingrid Tung were frustrated with the limited options available in new and existing houses and shared them with DWELL magazine. 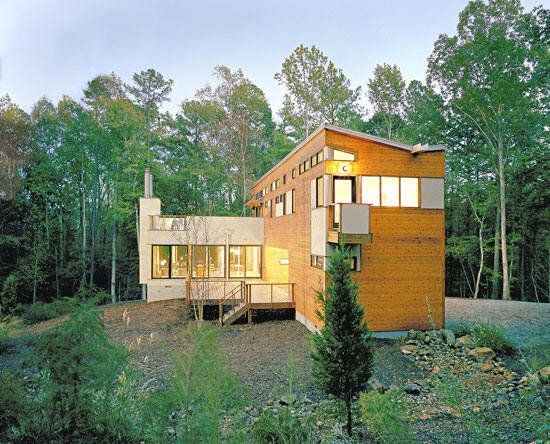 In 2002, Wieler and DWELL initiated the Dwell Home Design Invitational, a 21st century version of the Case Study Houses program. 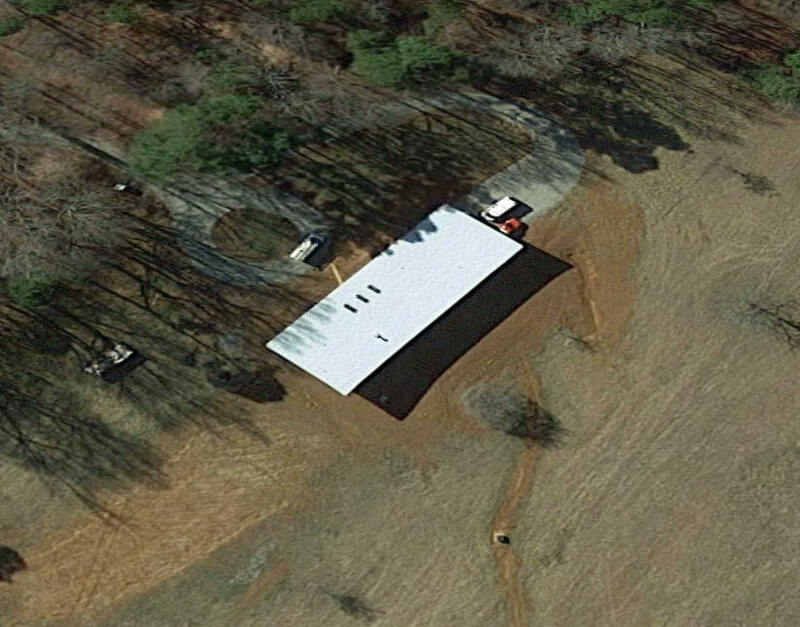 The construction budget was to be $200,000 plus the land (bought for around $200,000) for a house on 9 acres. The design had to be prefab, so in order to move them by truck, sections could not be wider than 16 feet. Sixteen architects from the US and abroad were selected to submit designs. 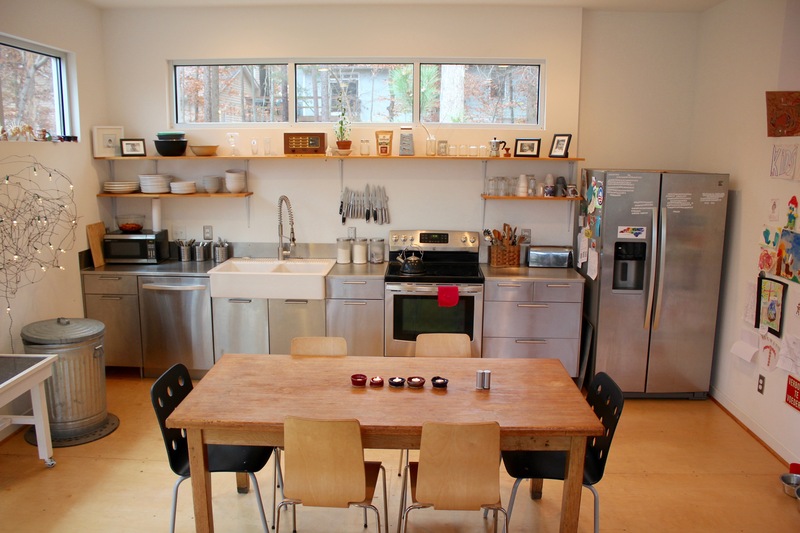 In 2003, the Wielers selected Joseph Tanney and Robert Luntz of Resolution4 Architecture in New York. 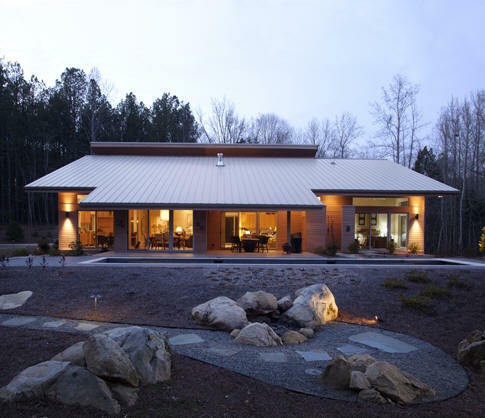 Module assembly began April 2004 at Carolina Building Systems in Salisbury, North Carolina. Soon the parts would be put together, and by July 2004, over 2000 people braved the searing summer heat during an open house. In December 2004, DWELL declared the competition a huge success. 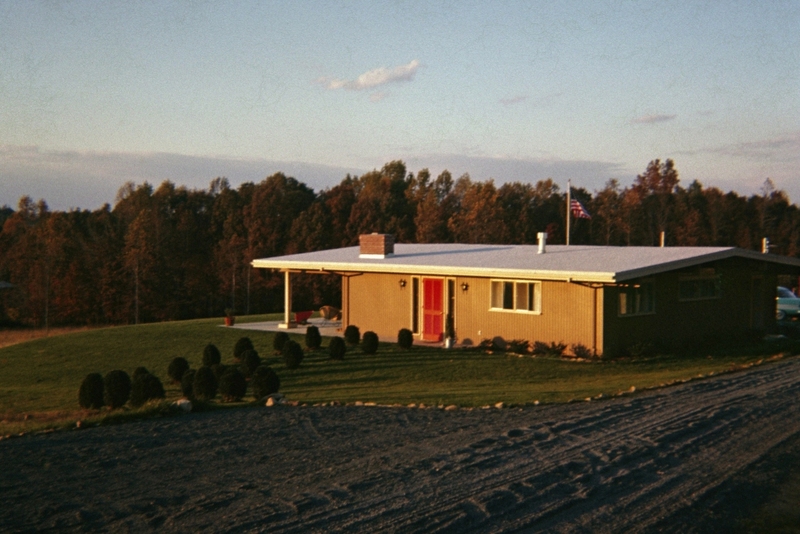 The Wielers were indeed the owners of a stunning new home, called "the most high-profile modern prefab house in America" by the Washington Post and credited by many writers as the spark in a new movement of modern prefab housing. Yet getting to actual occupancy would take longer. It would not be until April 2005 that the Wielers moved in. The process had been far more expensive, time-consuming, and problematic than anyone had anticipated - and nowhere near $200,000. Although the construction contract (excluding land, architect fees and site work) was initially for $206,000, it ran about $350,000. That figure did not include corporate sponsors who provided everything from construction materials to appliances, adding another $200,000 at least. 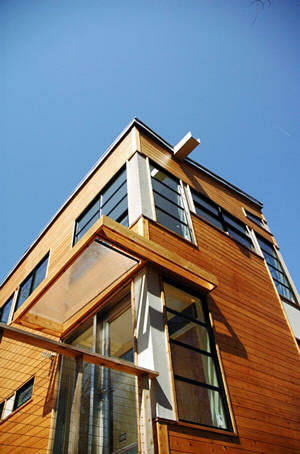 Windows, for instance, were provided by Loewen, a Canadian concern specializing in the luxury market. Trex provided the planks for all the decks. Other sponsors include Artemide, Fisher & Paykel, Jenn-Air, Kohler, Lennox and Marmoleum. 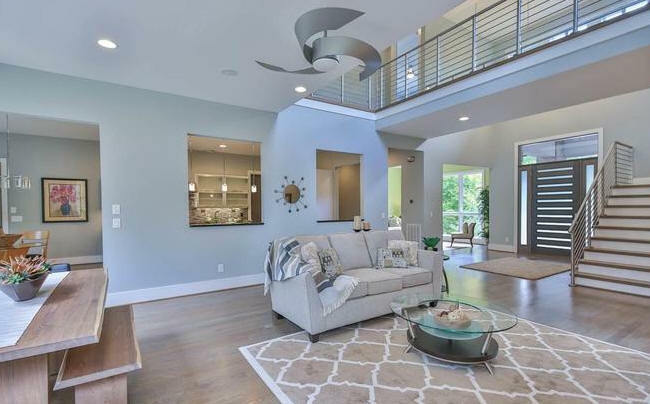 Raleigh architect Louis Cherry and Ann Marie Baum were involved with R4A and also provided interior design products and services, helped with public showings of the home and coordinated press photography. Total final cost: ball park of approximately $750,000 including land, construction, sponsor donations, architect fees, and site work. But what a great house! 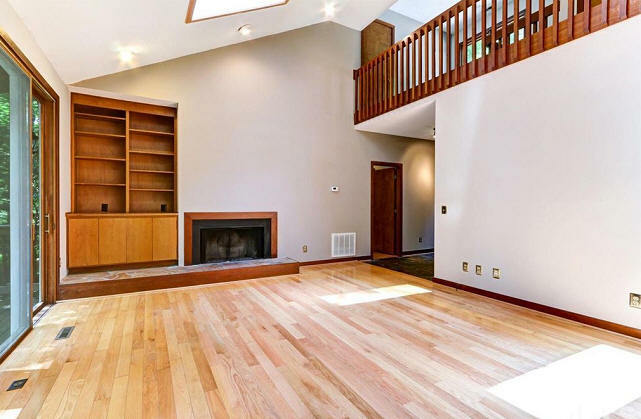 2340 sf inside, 2 bedrooms, 2.5 bathrooms, pulled together by 1,500 square feet of decks and upwards of 80 windows. Wieler finished construction after firing the original contractor, Mount Vernon Homes, Inc., very close to completion. 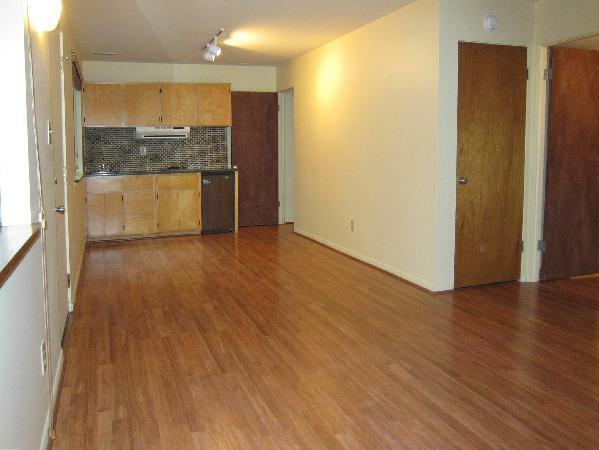 Just seven months later, in November 2005, Wieler put the home on the market. It finally sold in 2009, for much less than construction cost, to Sha Chang and Alfred Kleinhammes. Sources include Nathan Wieler, Wieler, Washington Post, Archinect, New York Times. Sold in 2017 to Tracy L. and Eric R. Zothner. 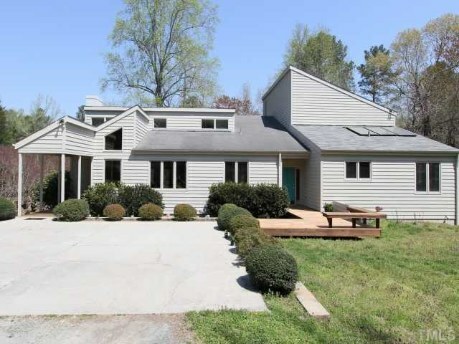 2006 - The Eduardo Aversano and Eunice Polido House, 1017 Starfield Circle, Hillsborough NC. Designed by John Hartley. 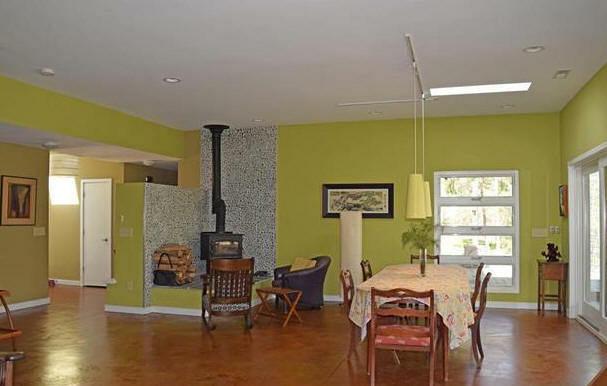 Sold in 2010 to Diana K. and Herman Robinson III. 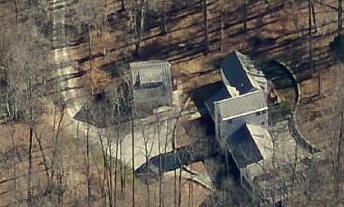 2007 - The Chris Russell House I, 2300 Neville Road, Chapel Hill. Designed and built by Chris Russell. Sold in 2009 to Mike Swim. Sold in 2015 to Marie E. Price and William M. Keelan. 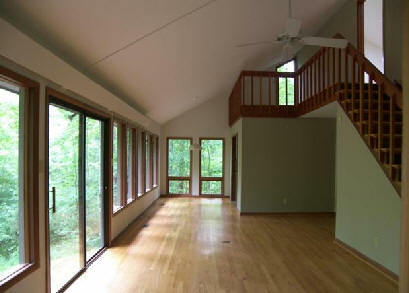 2008 - The Rob and Lauren Munach House, 319 Wrights Way, Pittsboro. 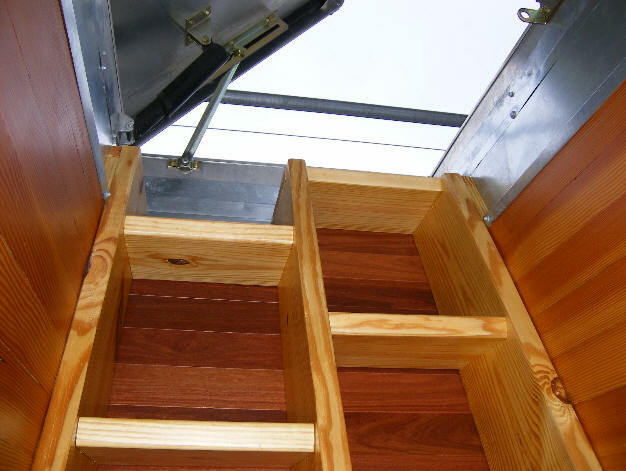 Designed and built by Rob and Lauren Munach. Rob Munach was the structural engineer with help from friend Jack Haggerty. 2008 - The William M. (Jr.) and Jonathan Quesenberry House, 689 Frosty Meadow Drive, Pittsboro NC. Designed by Jonathan Quesenberry. Built by Q-Squared Builders (owned by the Quesenberrys). Tricked out with built-in tech features. Sold in 2016 to Rafan LLC. 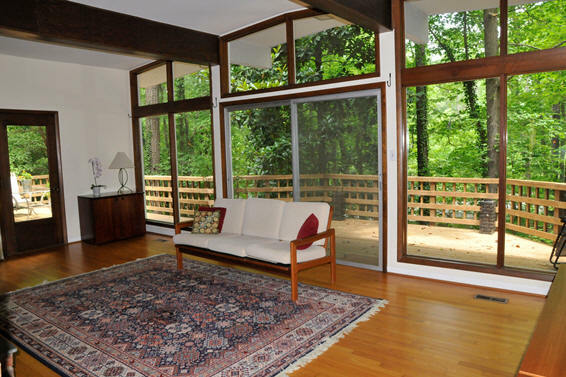 2009 - The Philip and Susan Lozier House, 525 Walnut Hill Drive, Hillsborough NC. 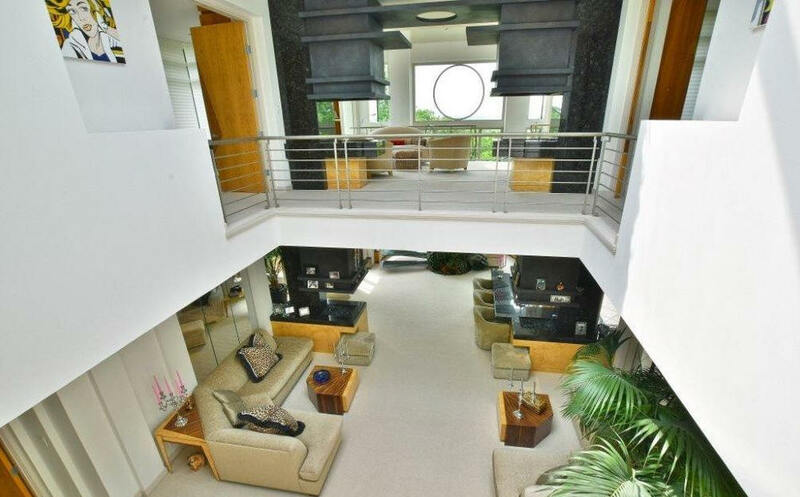 Designed by architect Philip Lozier. 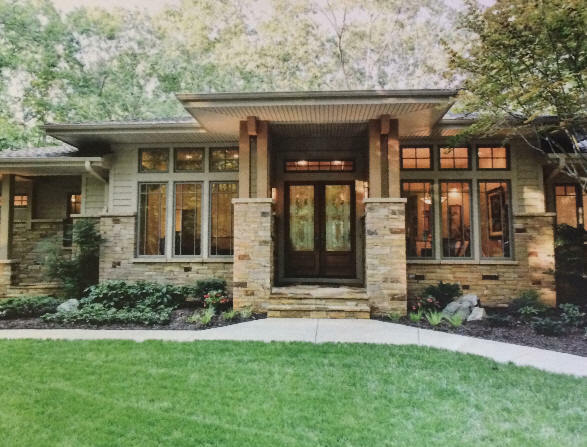 Built by Spyglass Building Company. 2010 - The Lita W. and Chris A. Russell House, 1007 Reaves Drive, Chapel Hill. Designed and built by Chris Russell. Sold in 2016 to Jodi and Jeffrey A. Anderson. 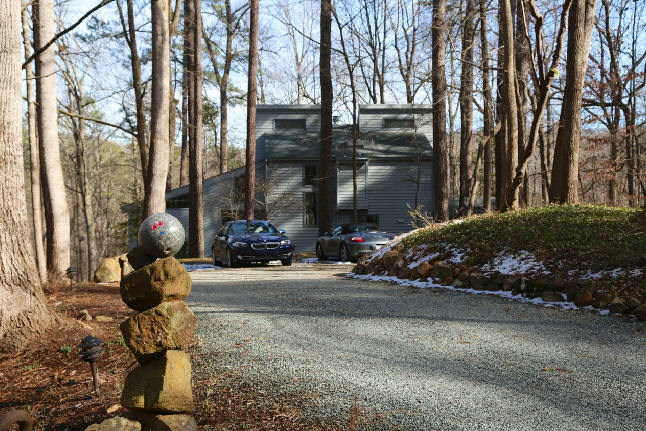 2011 - The Kevin McNeilly / Frederick Russ Residence, 108 West Hampton Way, Chapel Hill. 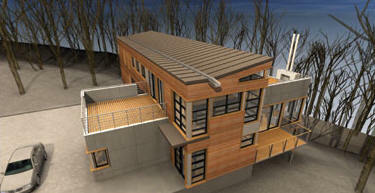 Designed by architect Ryan Duebber of Cincinnati OH. Built by Krichco Construction. 2012 - The Litwinski-Brubaker House, 107 Partin Street, Chapel Hill. Commissioned 2009. 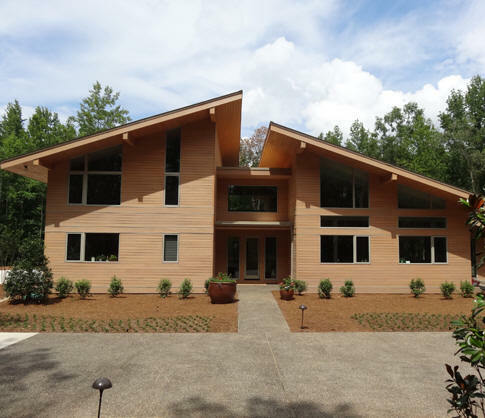 Designed and built by Ramon Garcia of Construction Services Contractor Inc.
2013 - The Christopher D. Ehrenfield House, 13132 Morehead, Chapel Hill NC. Designed by David Ripperton. Located in Governors Club, gated community. Sold to Ralph and Carol Disibio. Sold in 2018 to Robert D. Yox and Rina Sarkar. Featured on Love It or List It. 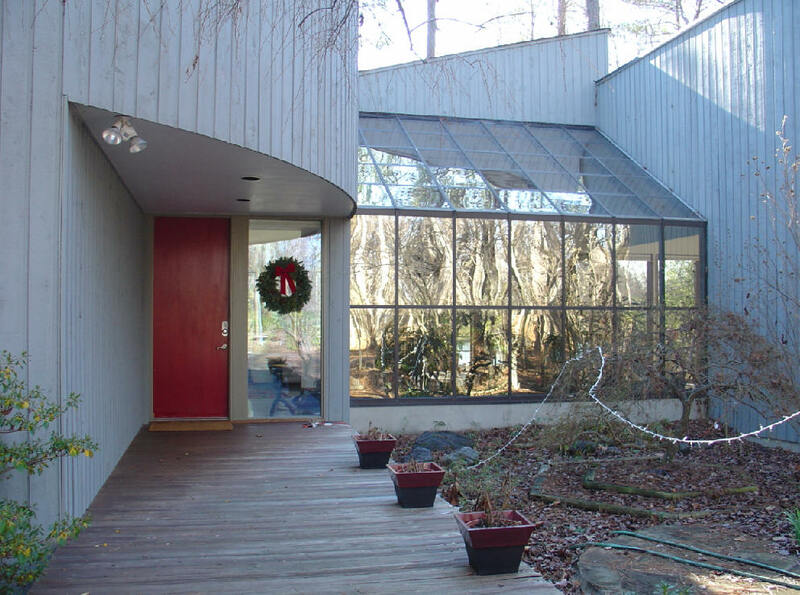 2014 - The Andrew and Maureen Berner House, aka Bernerhaus, 106 Glass House Road, Carrboro. Designed by Len Vogel. Built by Jeff Peloquin. 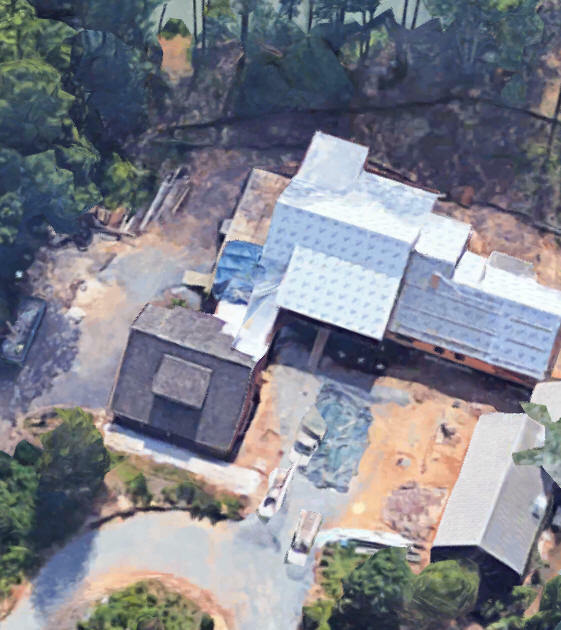 2015 - The James E. and Selaine Niedel Renovation, 2110 South Lakeshore Drive, Chapel Hill. 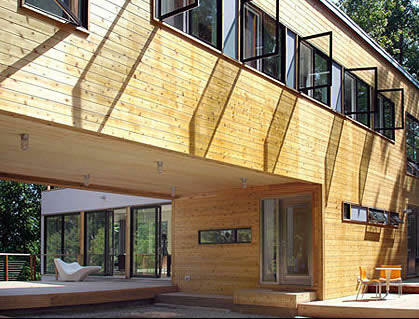 Designed by Tony Lineberry, built by Leon Meyers. 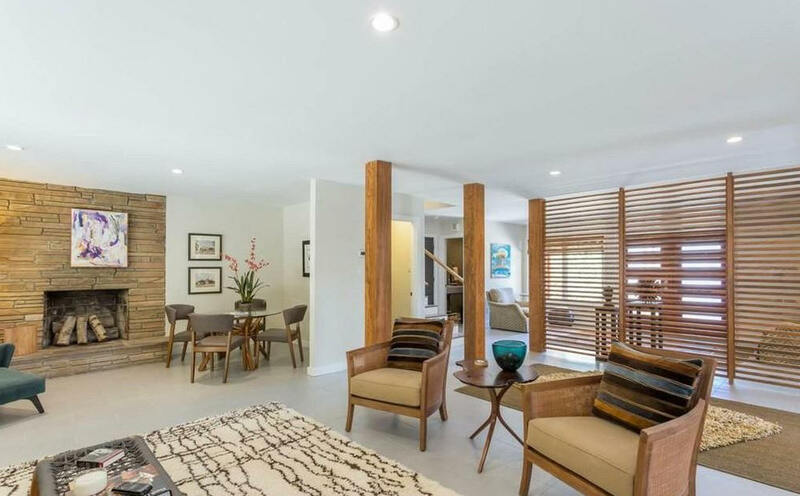 Original house was Colonial; renovation is Modernist. 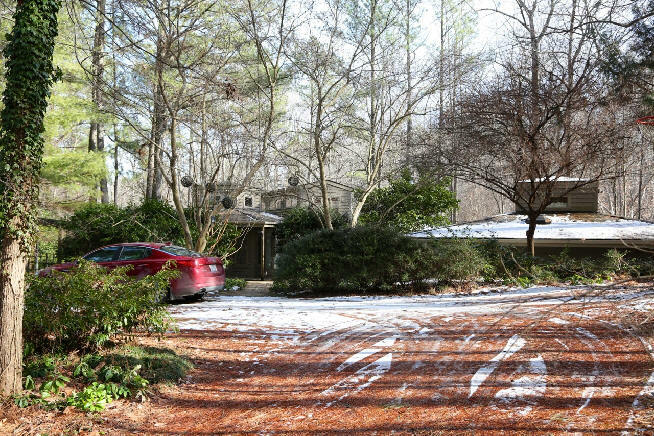 2015 - The David and Lisa Hayes House, aka Casa Mariposa, 127 Glendale Drive, Chapel Hill. 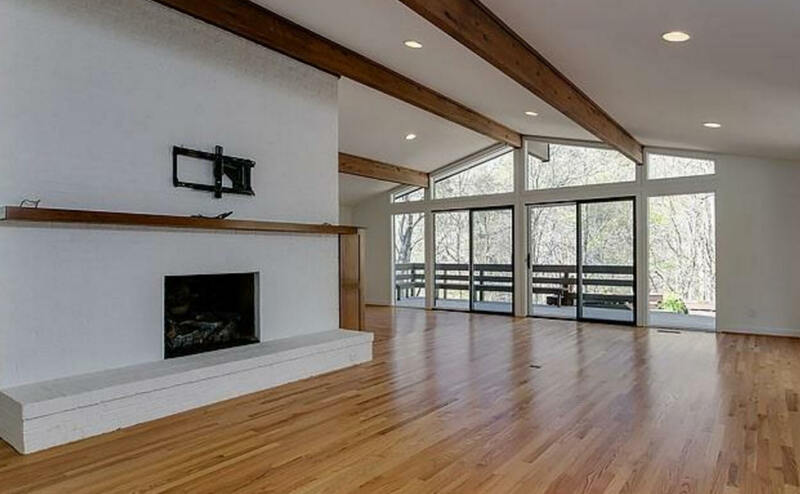 Although the core of the smaller original 1964 ranch house was retained, this was 90% new build. Designed by Lyn McClay. Sold in 2018 to Anne Z. and Michael J. Steiner. 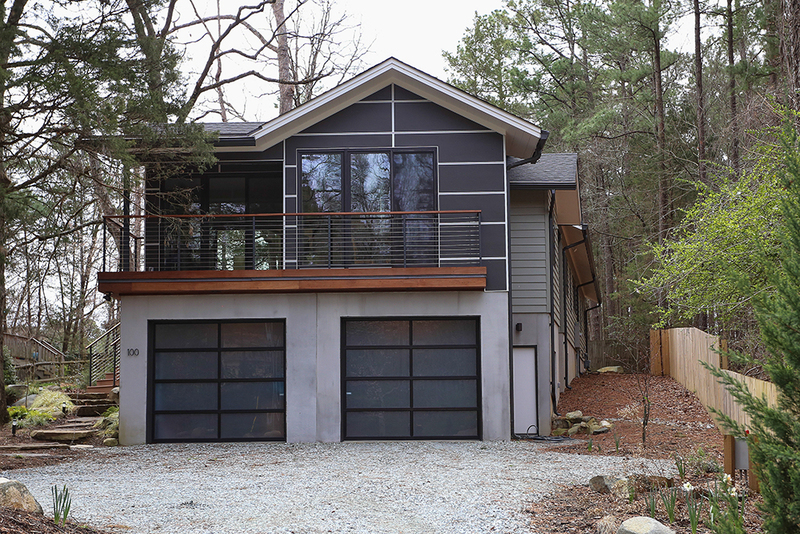 2016 - The Dean W. Avary Residence, 100 Sparkleberry Lane, Carrboro. Designed by Rafael Amuchastegui of Miami. Built by BuildSense. 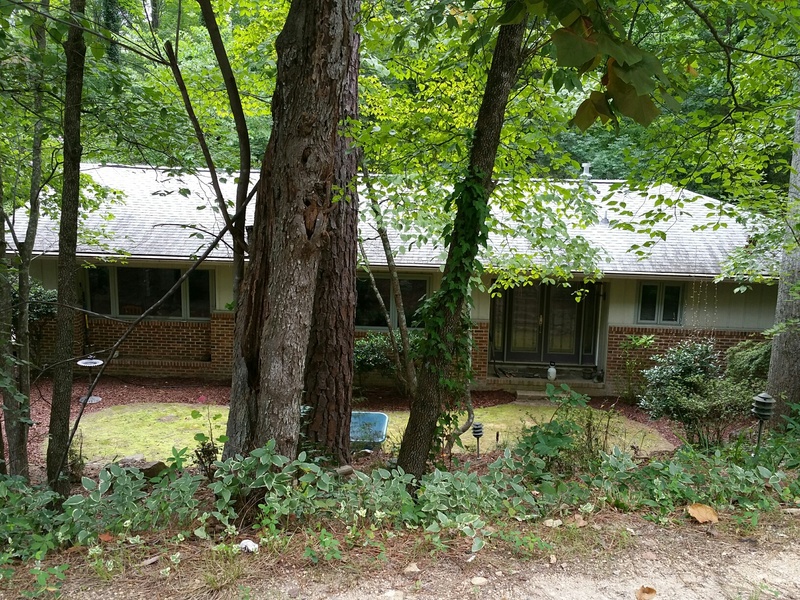 2016 - 1205 Old Lystra Road, Chapel Hill. Renovation designed and built by Barnett Adler. Featured in the New York Times, January 2017. Garage added in 2017. Sold in 2018. 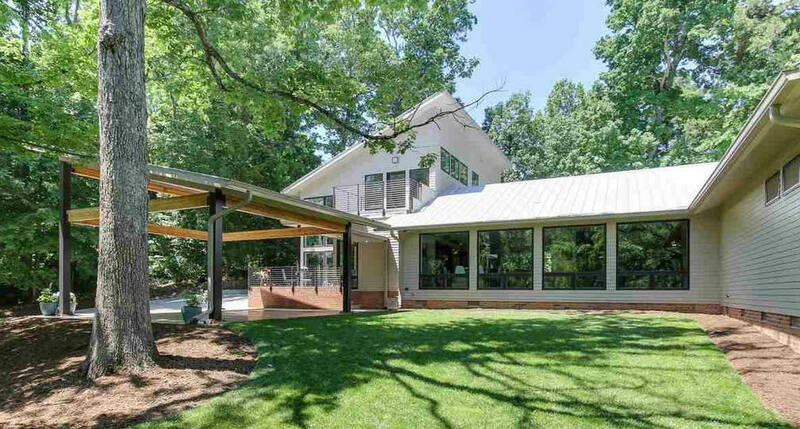 2017 - The Eric Sydell House, 8007 Union Grove Church Road, Chapel Hill. Designed by Jim Spencer. 2018 - The Michael and Katherine Carroll House, 1063 Lawrence Road, Hillsborough NC. Architect unknown. 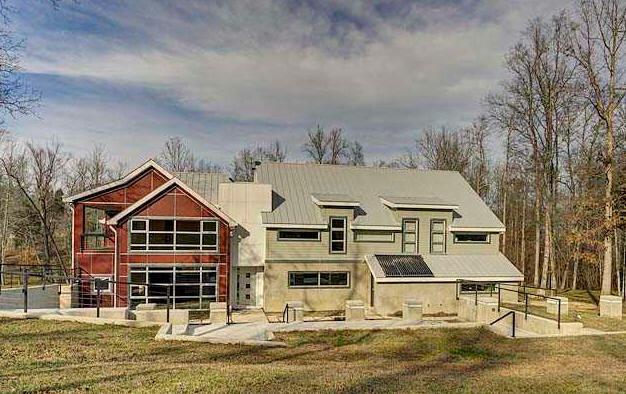 Built by Charles Woods Builder LLC. 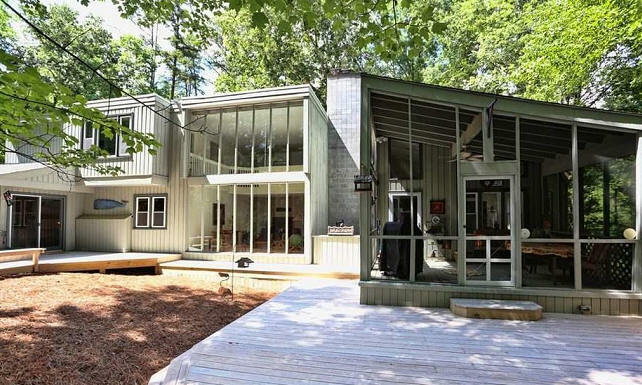 2018 - The Hanan Kovens House, 112 Milton, Chapel Hill. Designed by Kovens. Built by Fred and Lou Pica. Sources include: Johnny Randall, Scott Kovens, Bryan Koon, Roy Weintraub, Emily Moseley, The Town and Gown Architecture of Chapel Hill North Carolina 1795-1975 by Ruth Little, Julie Hollenbeck, Kent Collins, David Sykes.